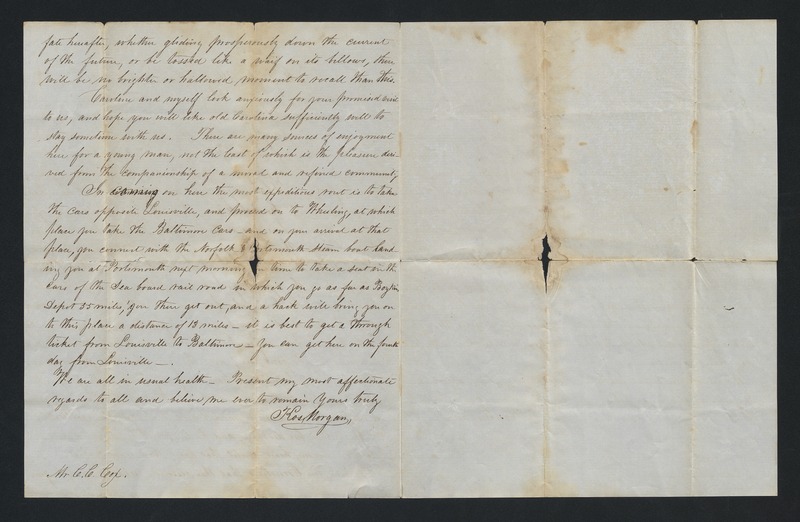 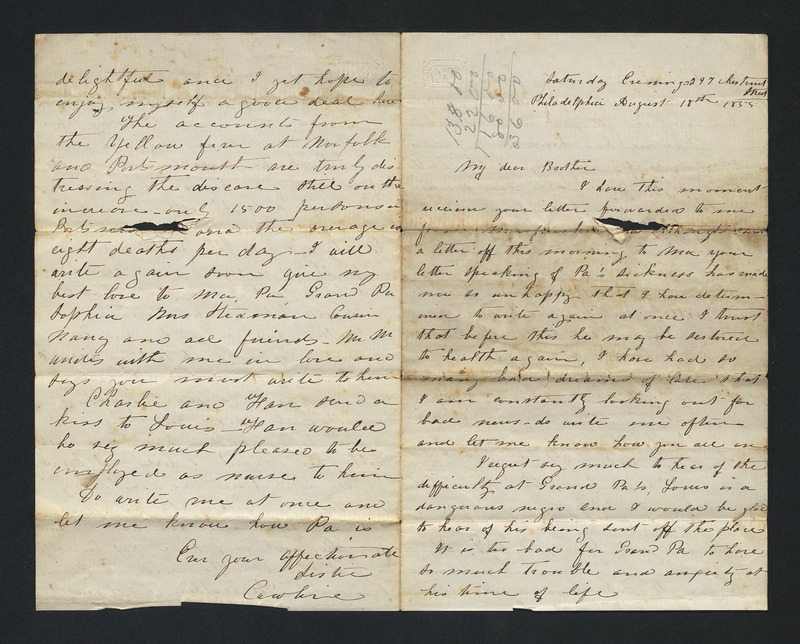 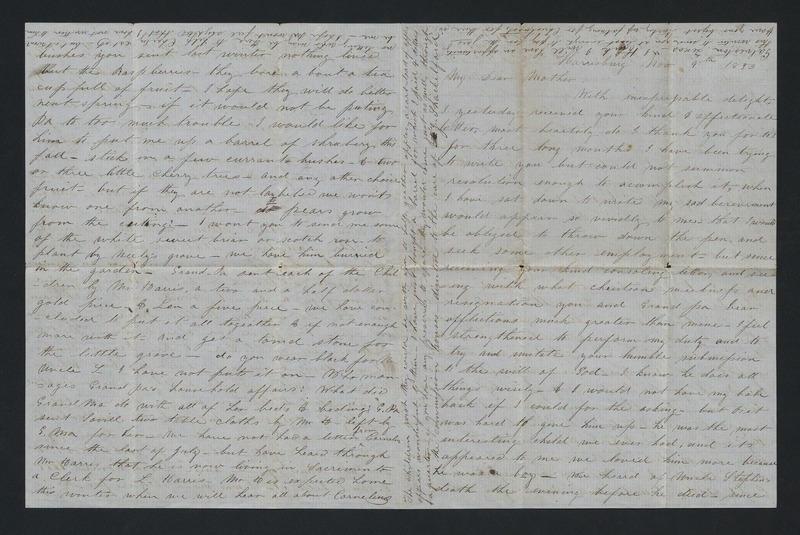 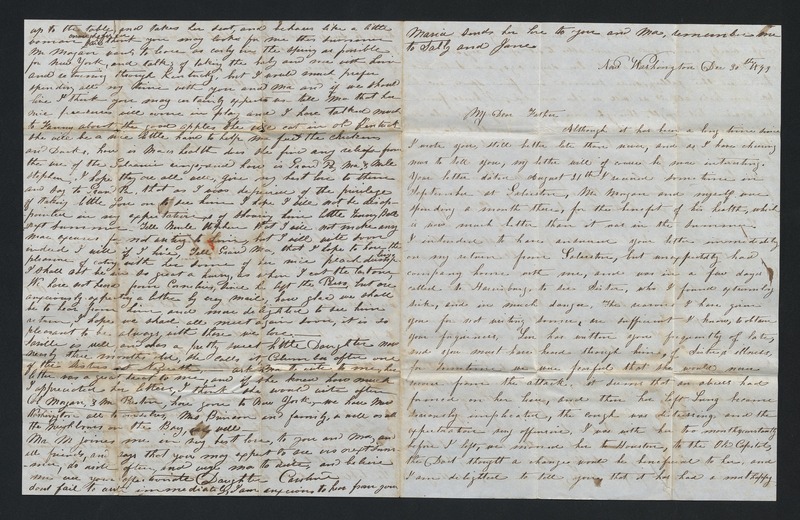 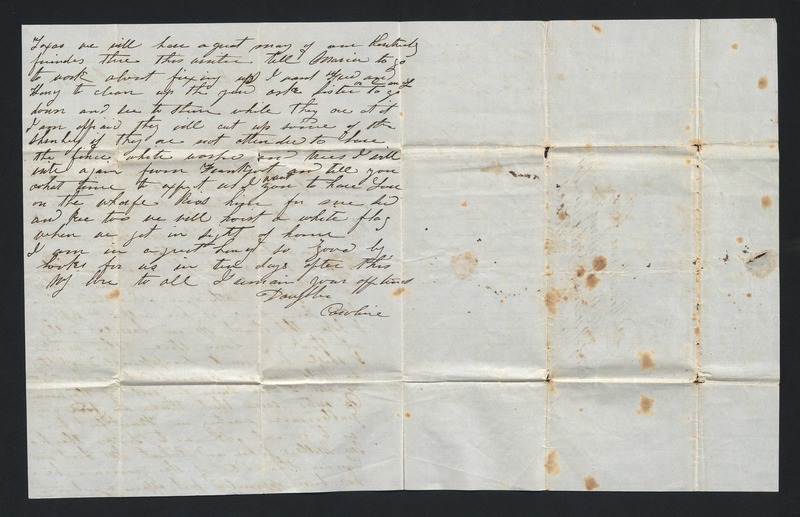 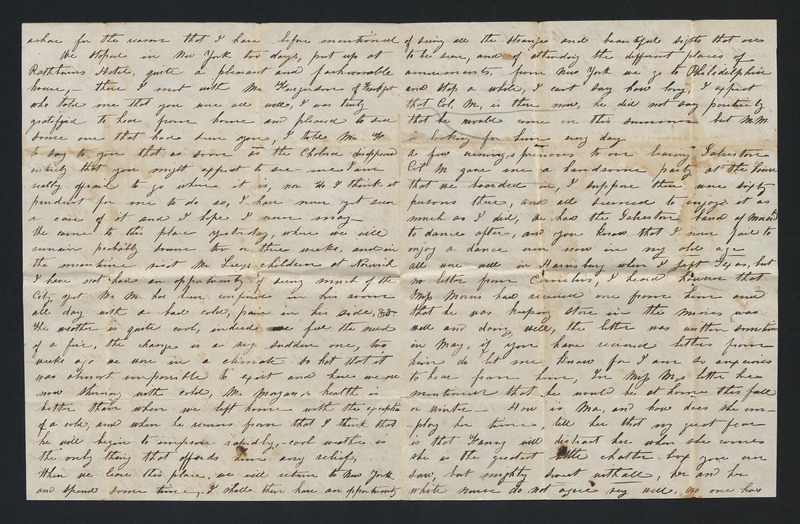 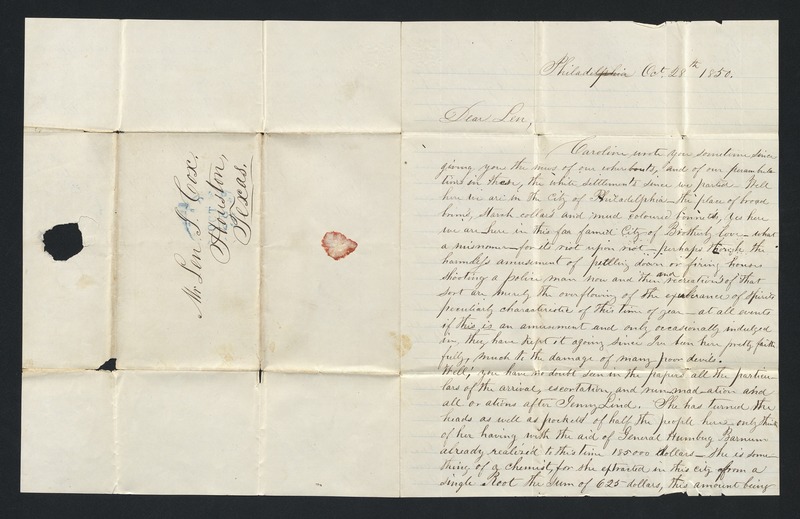 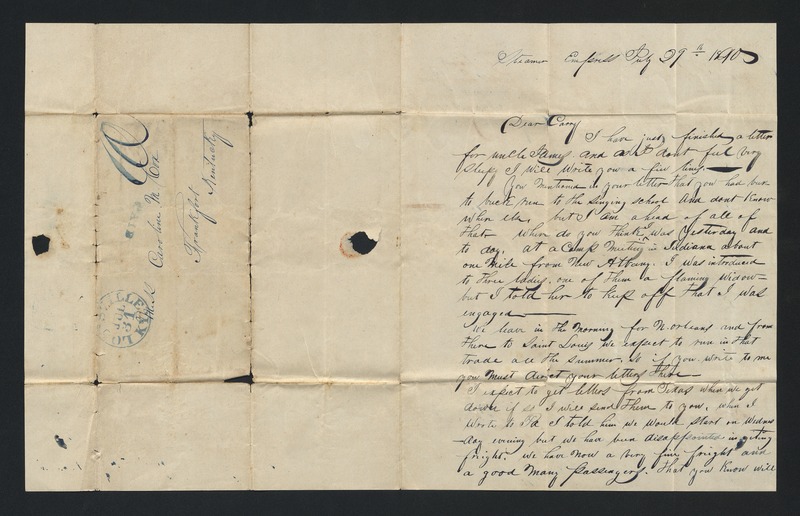 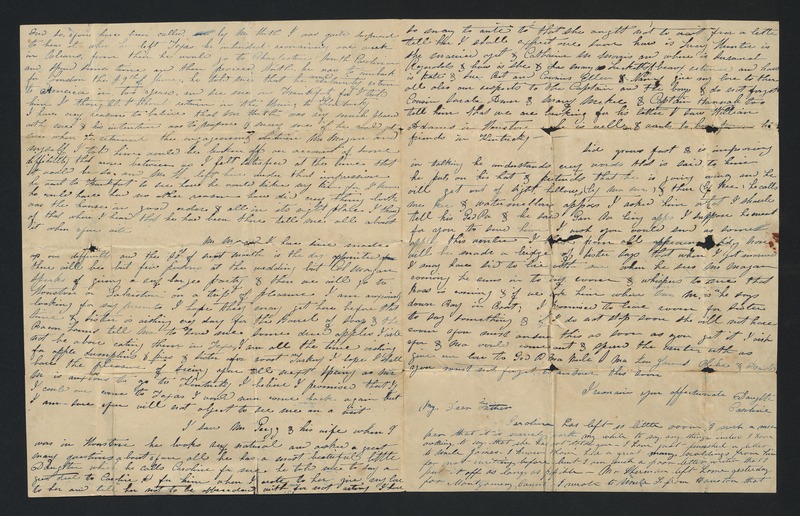 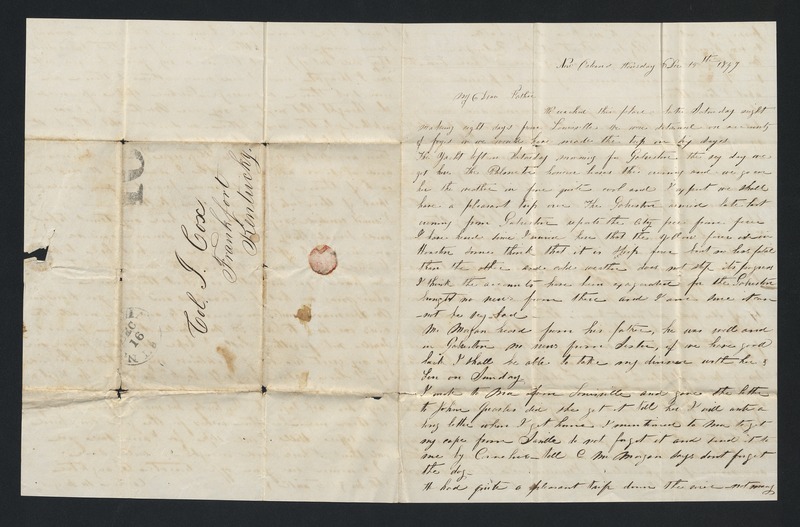 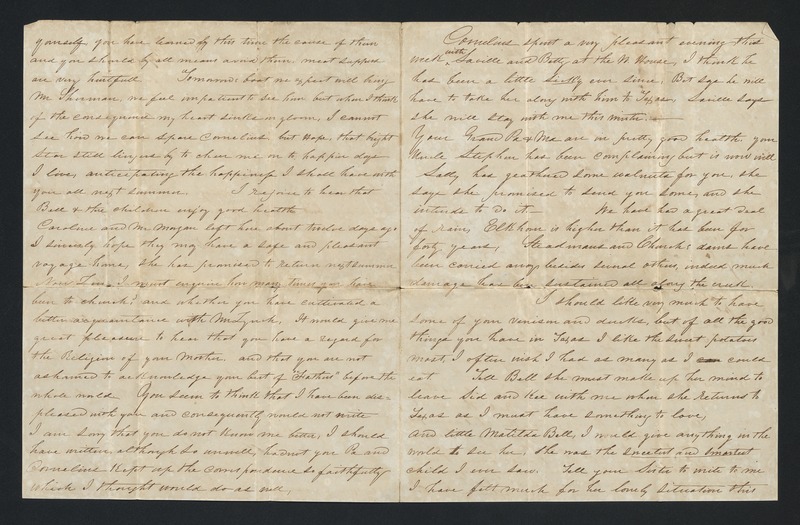 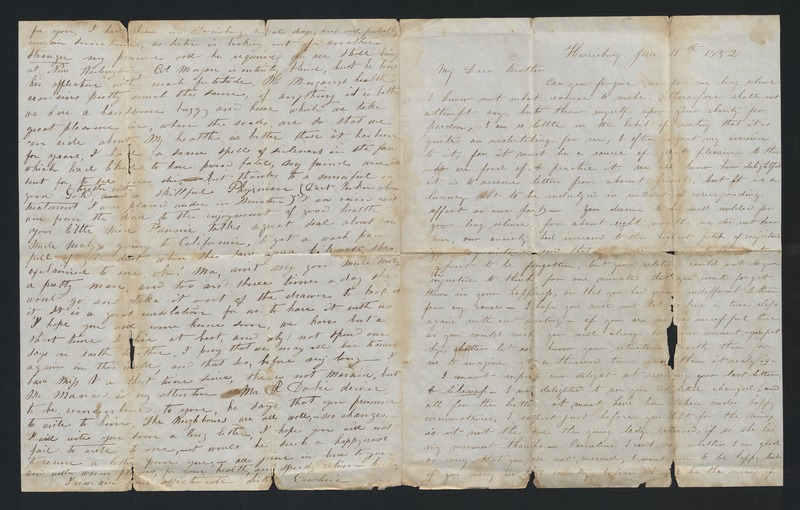 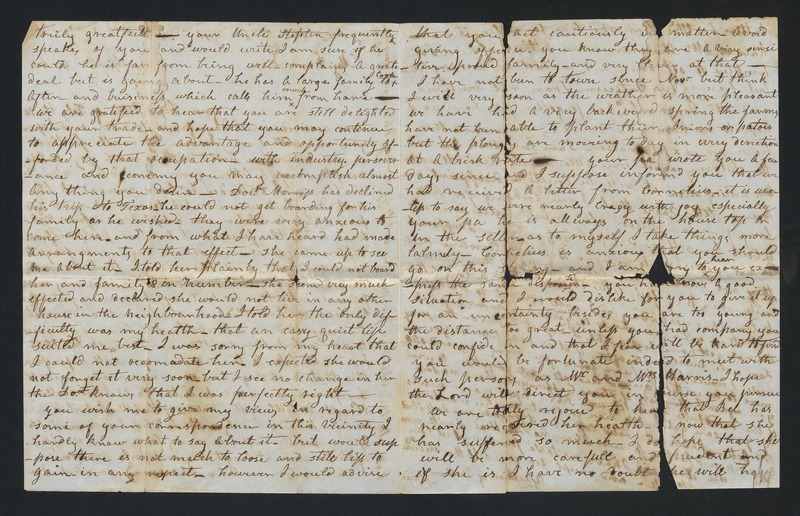 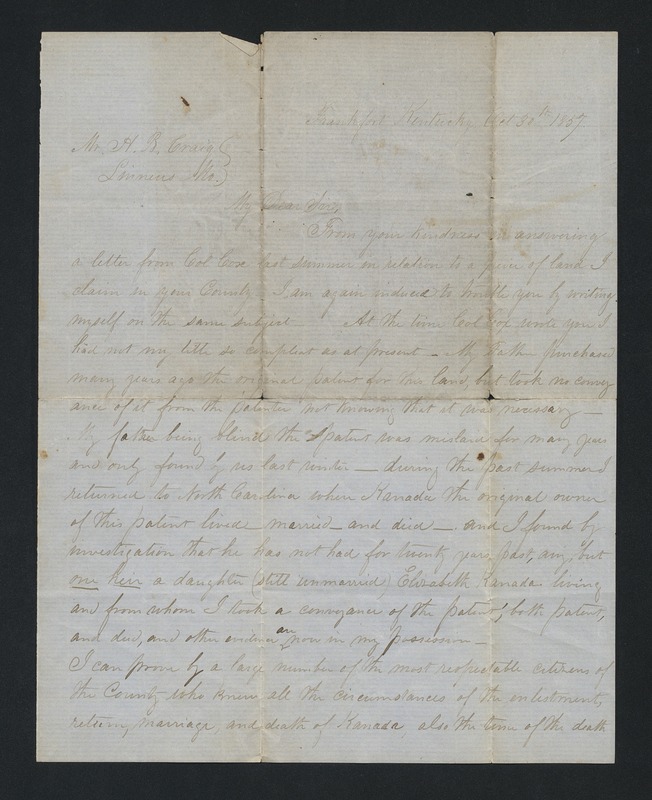 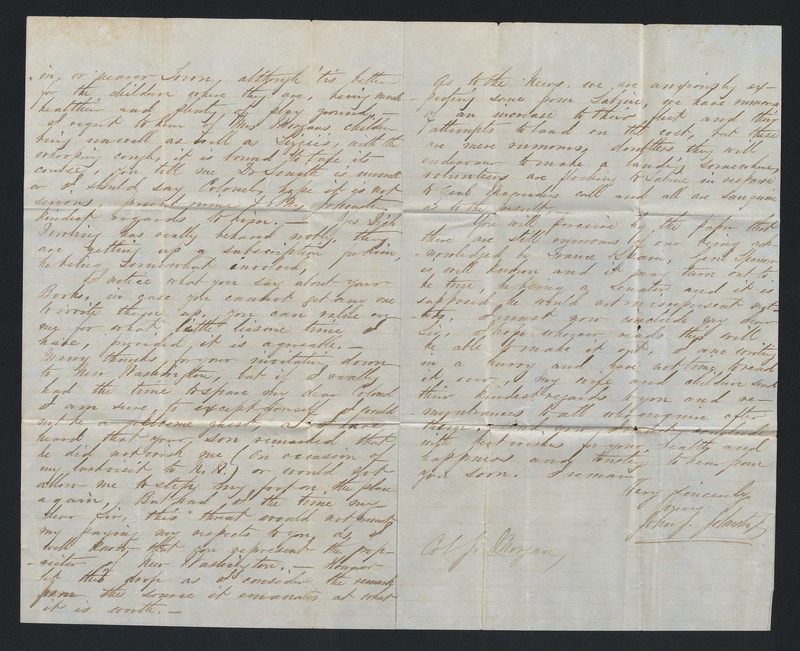 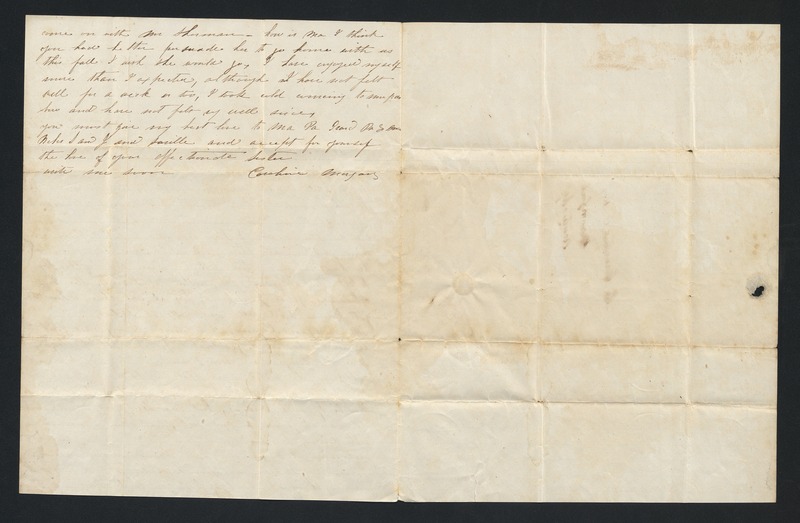 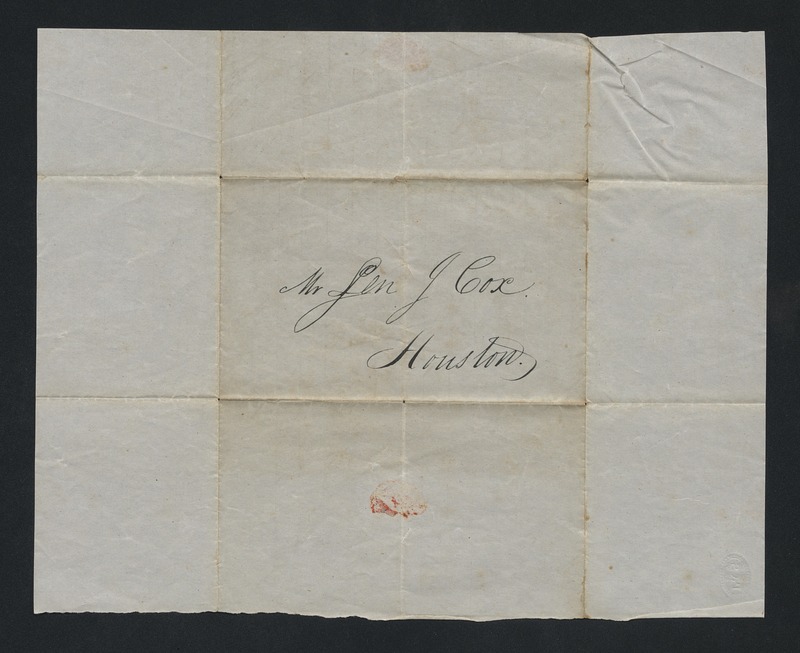 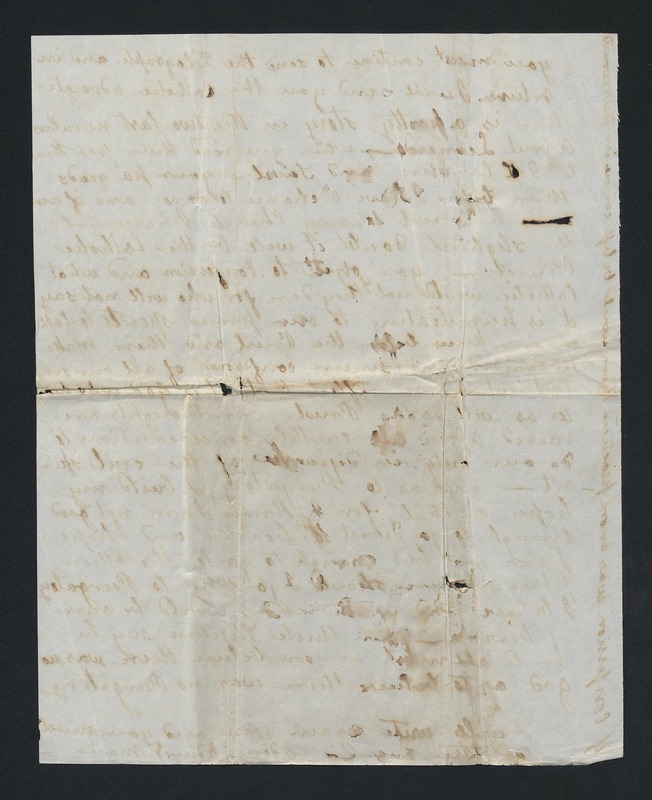 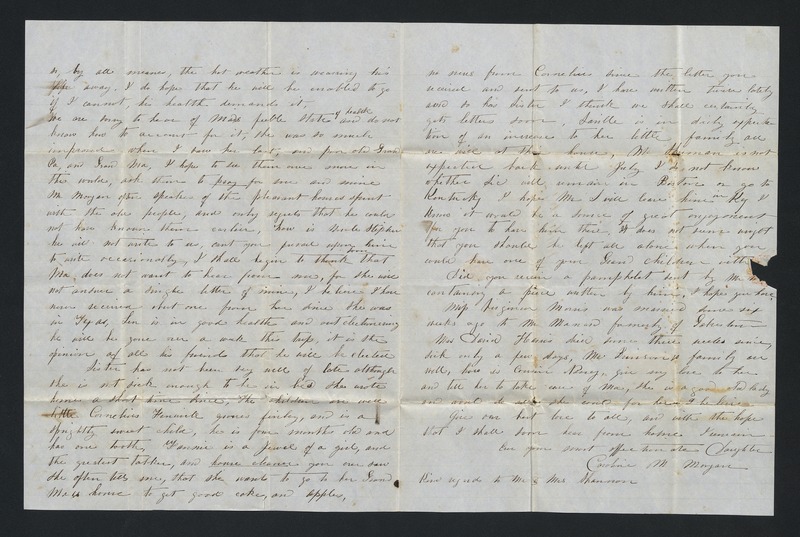 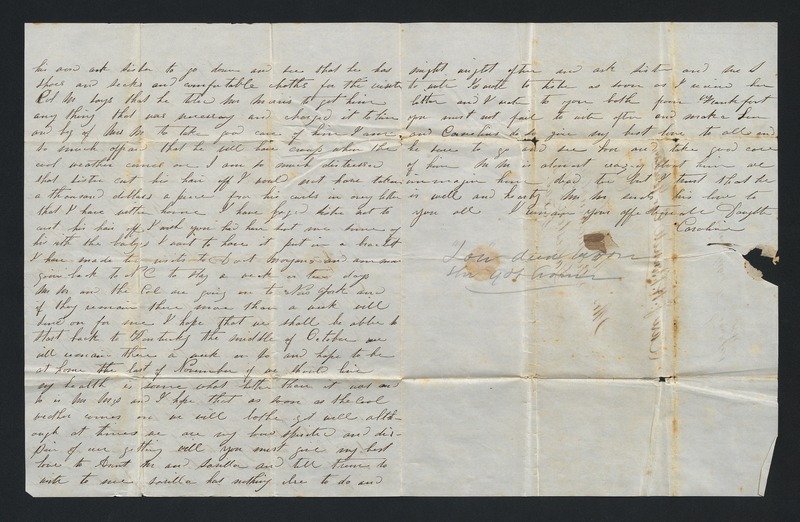 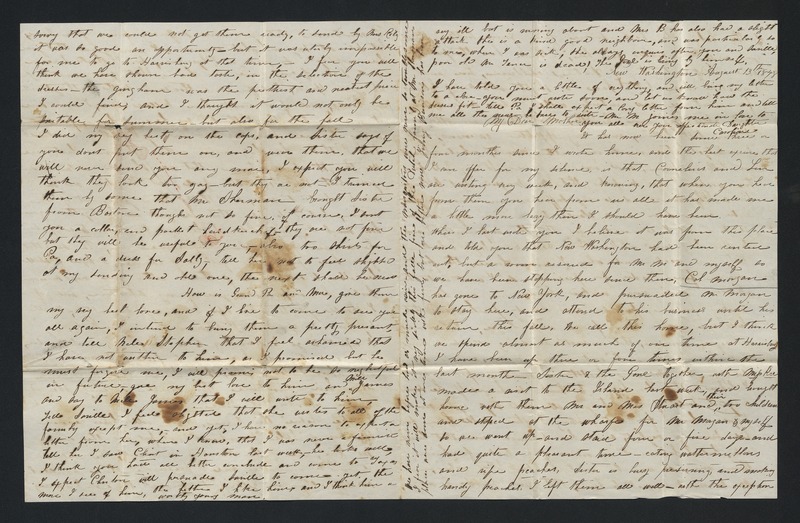 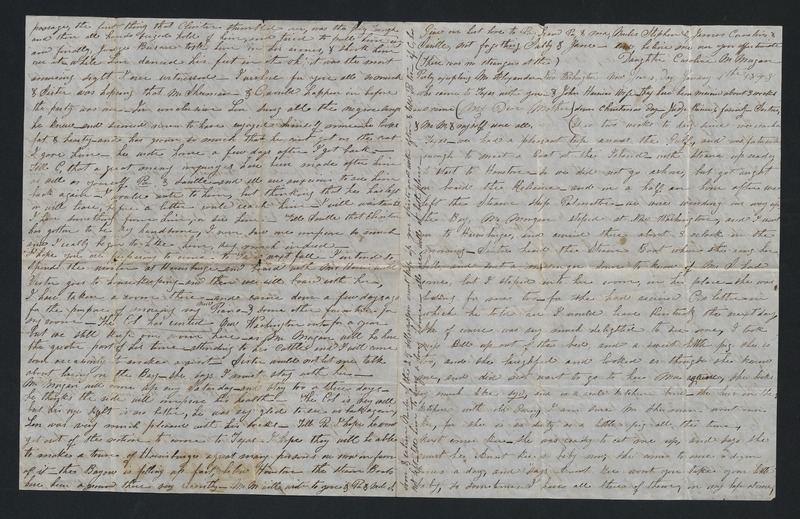 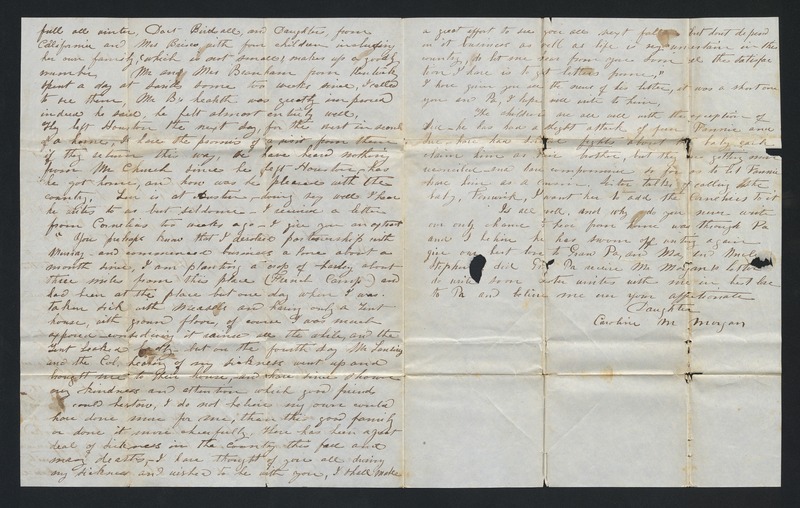 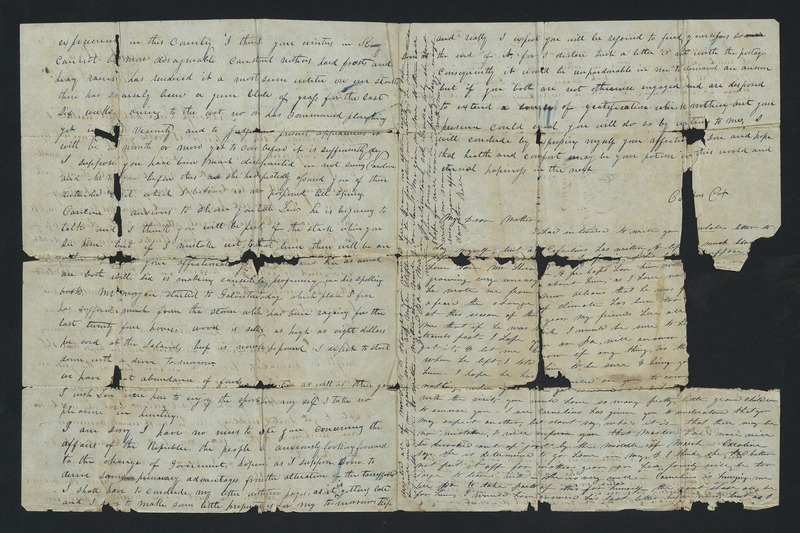 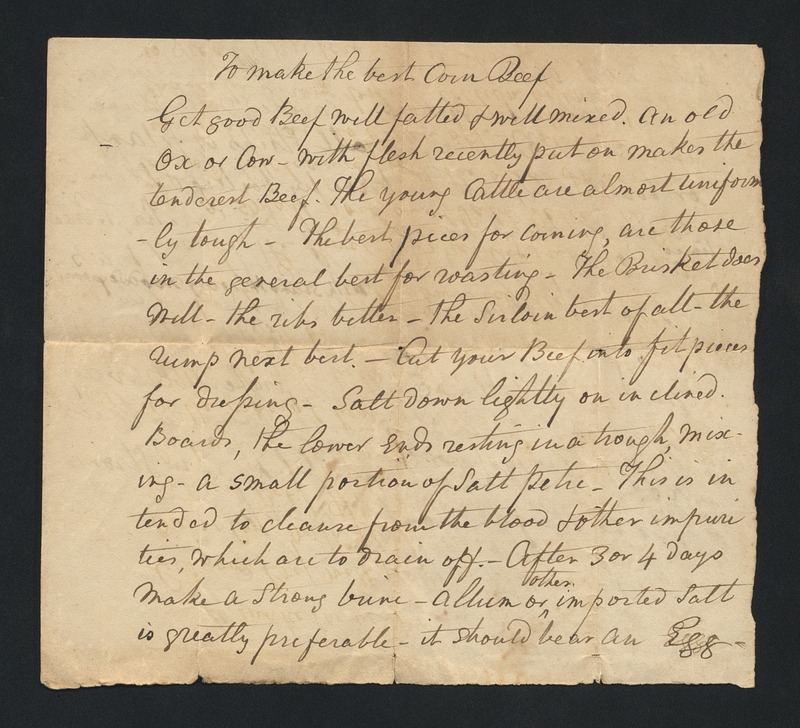 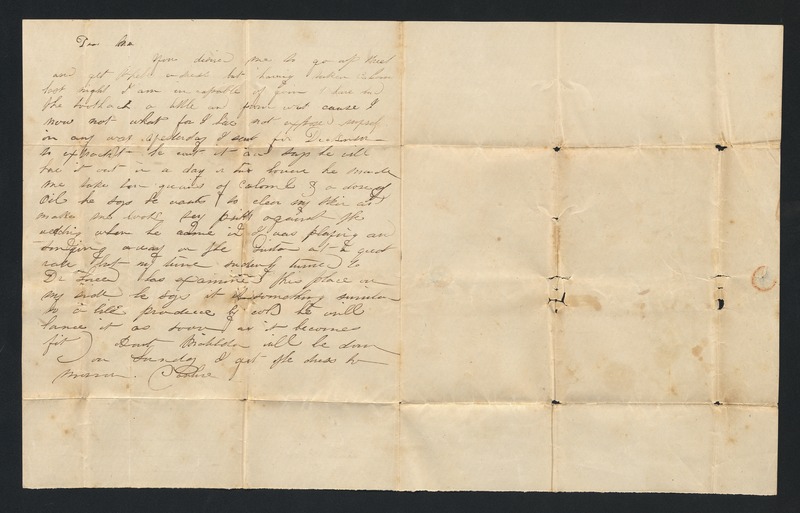 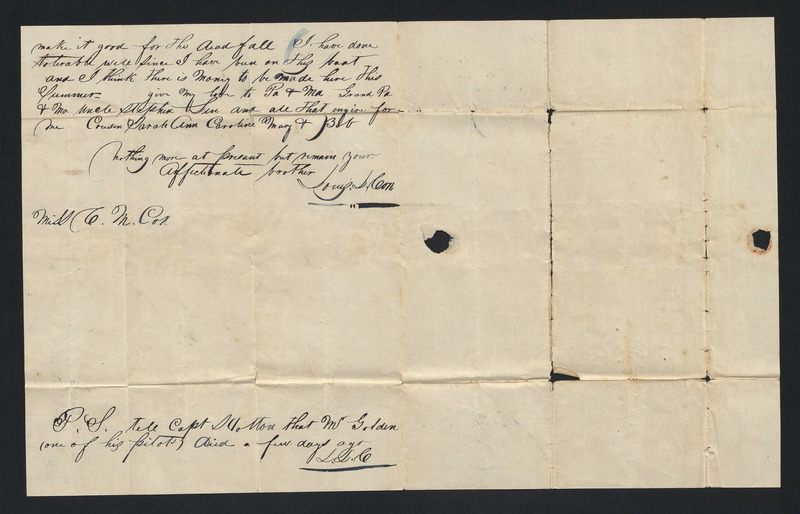 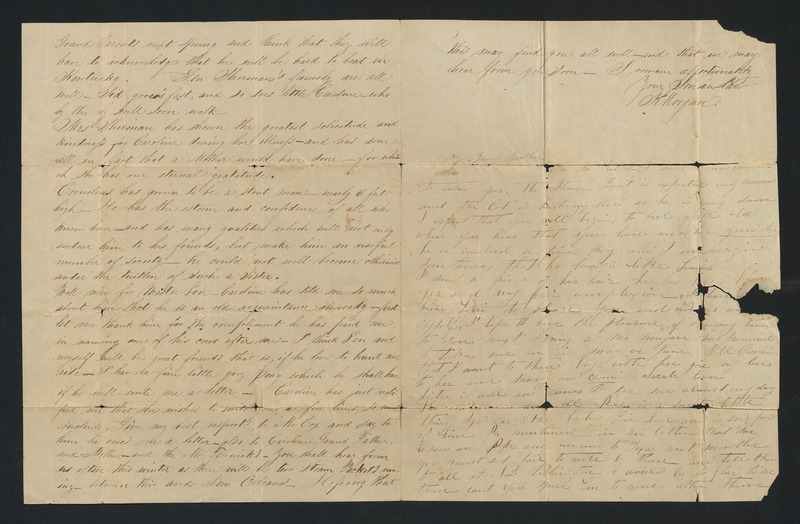 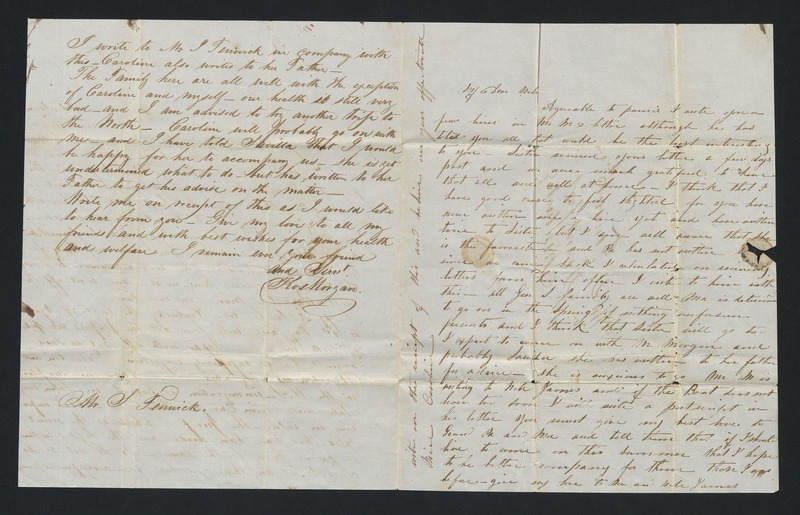 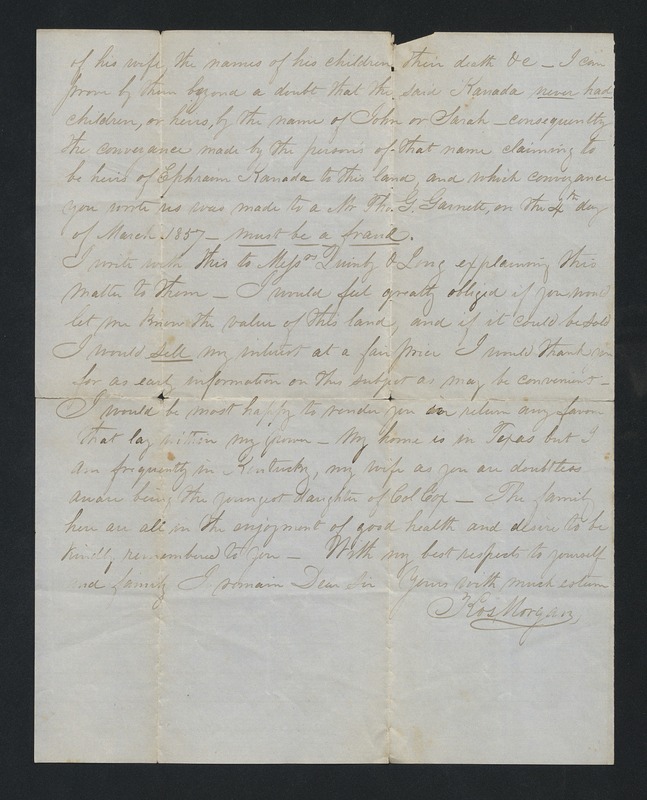 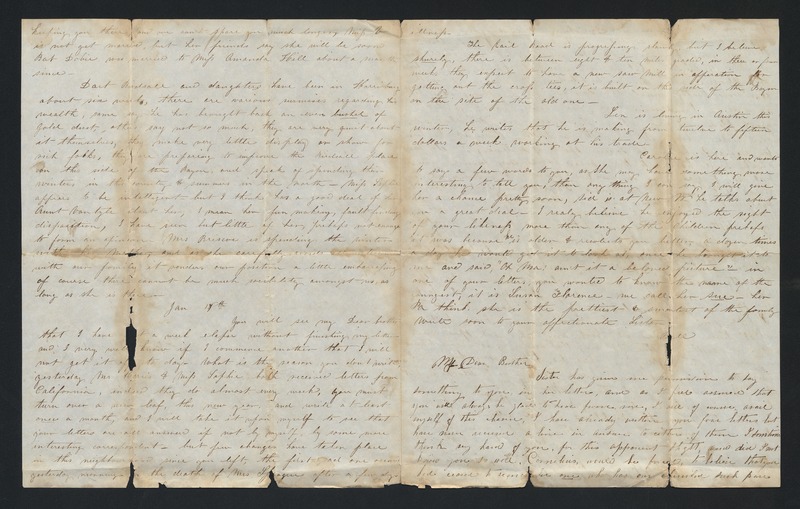 The Caroline Cox Morgan family papers (dated 1839-1863, undated; 0.45 cubic feet; 82 items) comprise correspondence between various Cox and Morgan family members in Kentucky and Texas relating to the Texas Revolution, the Mexican War, and the California Gold Rush as well as daily life. 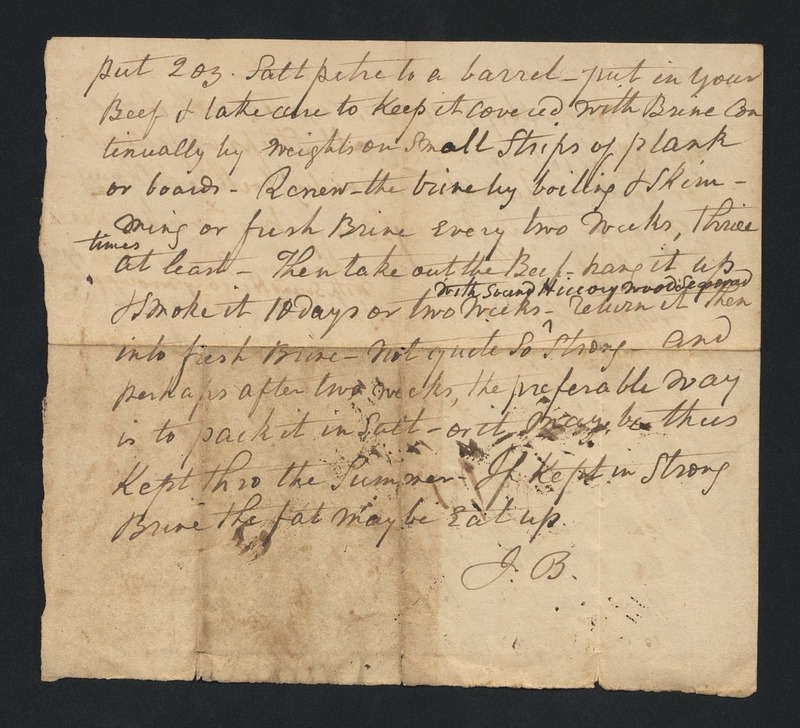 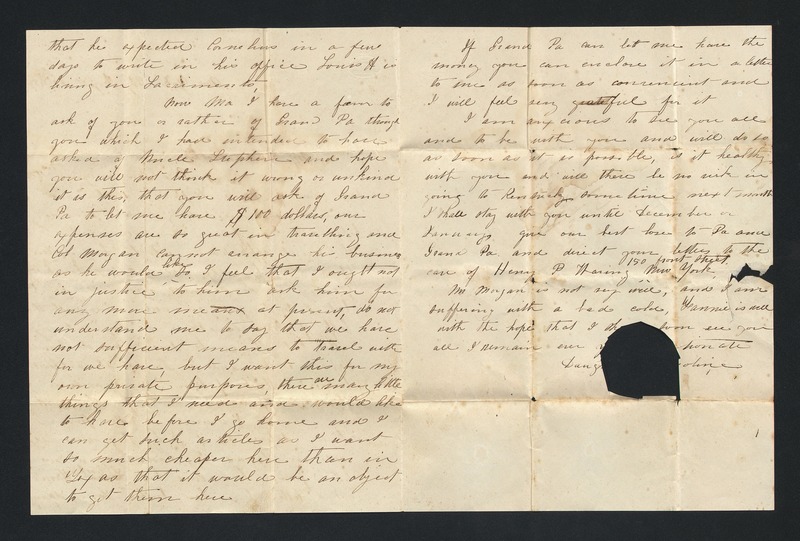 1997ms492: [identification of item], Caroline Cox Morgan family papers, 1839-1863, undated, University of Kentucky Special Collections Research Center. 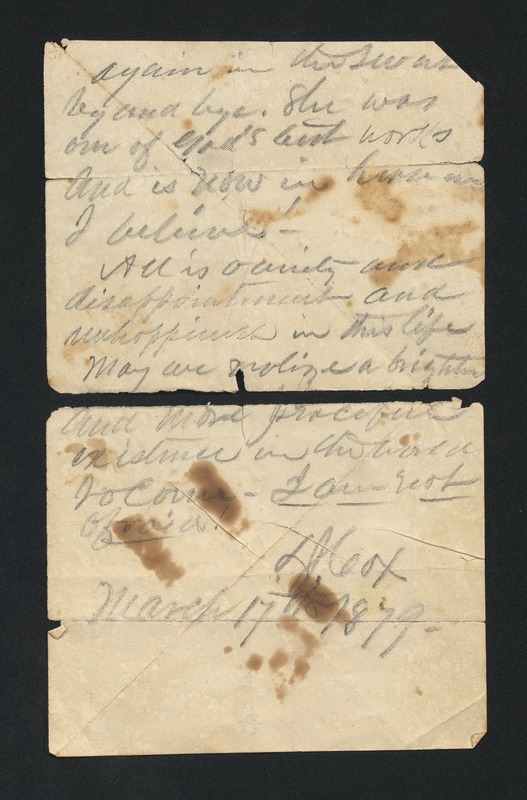 Caroline Cox Morgan (1821-1867) was born in Piqua, Ohio, to Leonard James Cox and Maria Fenwick Cox. 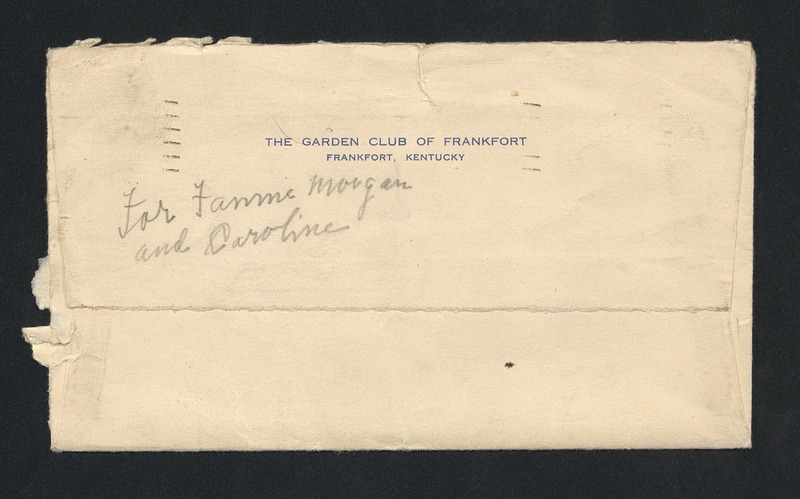 Caroline spent her childhood living in Franklin County, Kentucky. 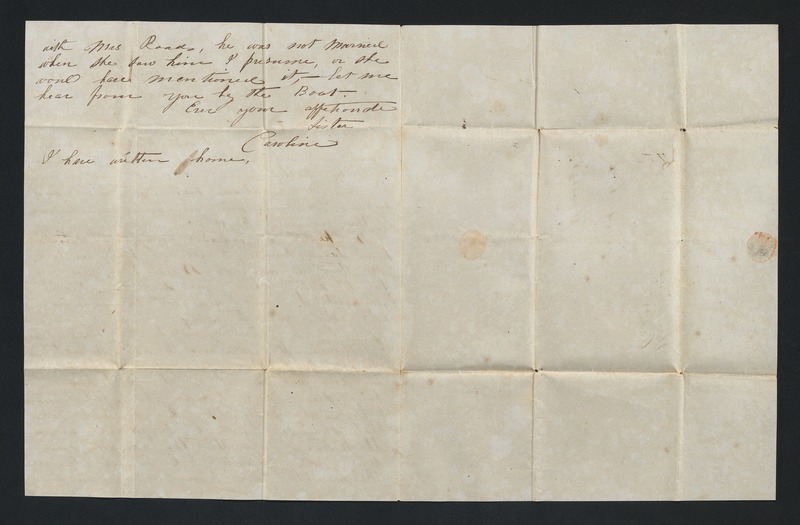 She had an older sister Catherine Isabella Bella (1805-1873) and three brothers Louis, Cornelius, and Leonard. 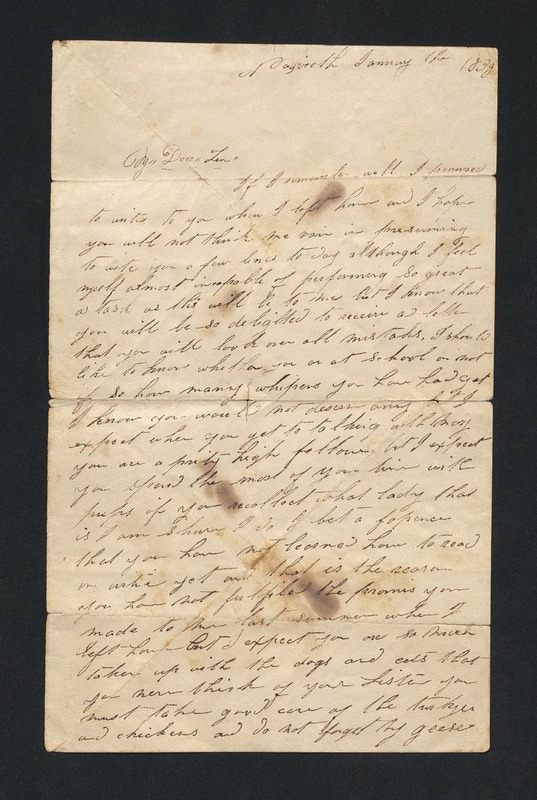 Bella married Sidney Sherman in 1835. 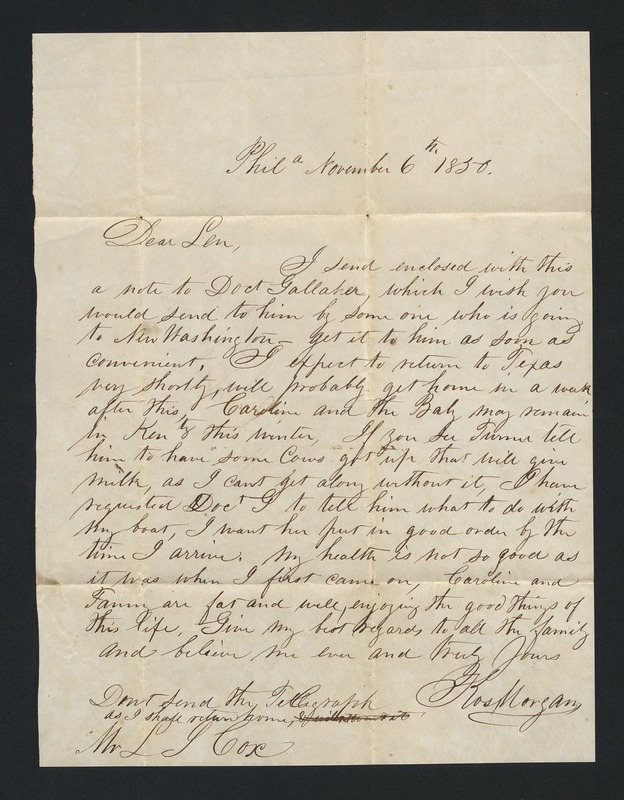 Towards the end of 1835, Sherman gathered a group of men and went to Texas to fight in the Texas Revolution. 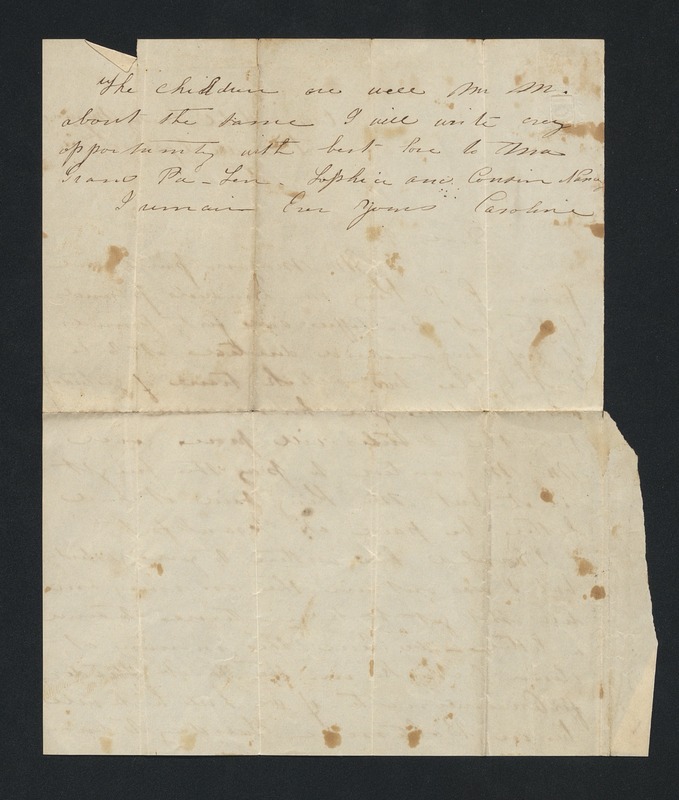 After fighting in the battle of San Jacinto in 1836, Sherman returned to Kentucky for Bella and 12-year old Cornelius Cox. 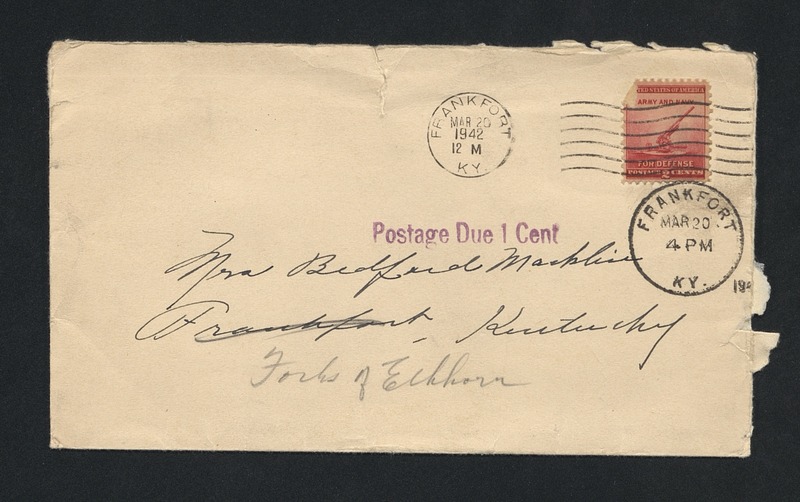 They settled in Harrisburg. 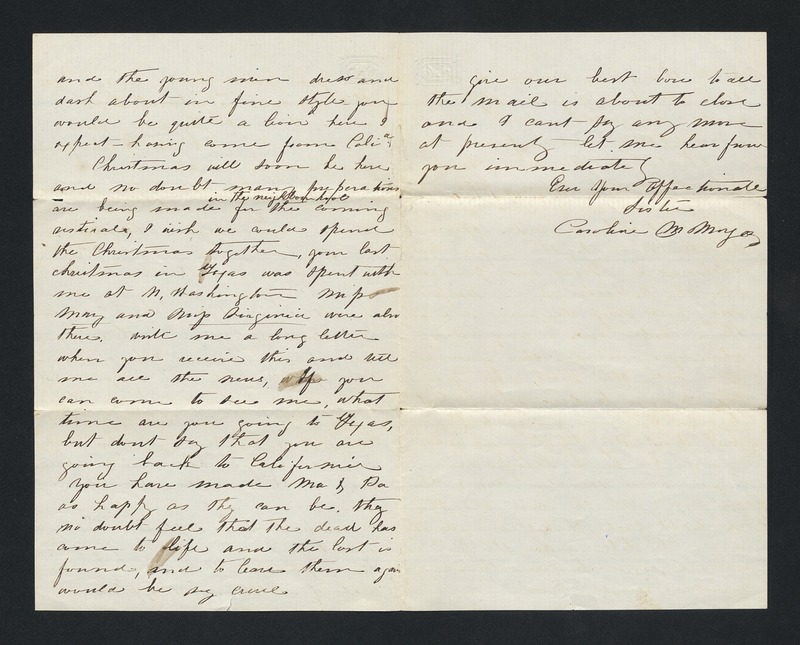 Caroline joined her sister in Texas in 1843 and married Kos (Kosciusko) Morgan, son of Colonel James Morgan, in September 1843. 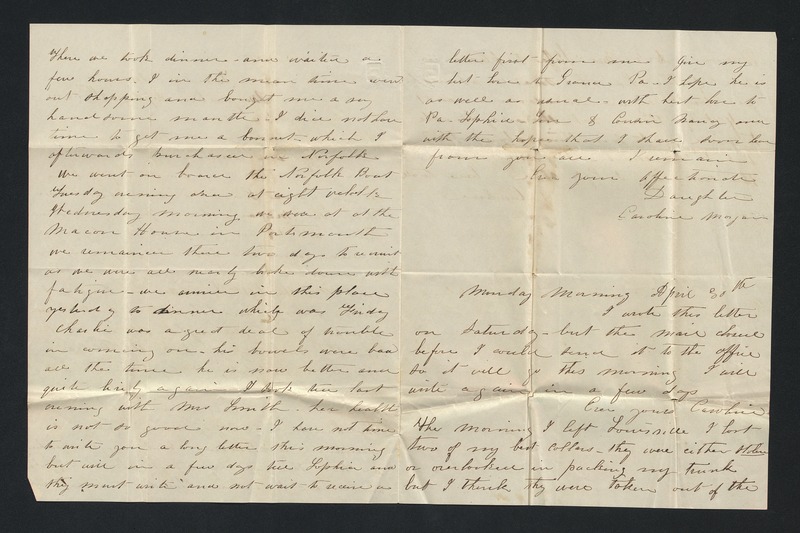 Her brother Louis Cox, who worked on a river boat, died in 1840. 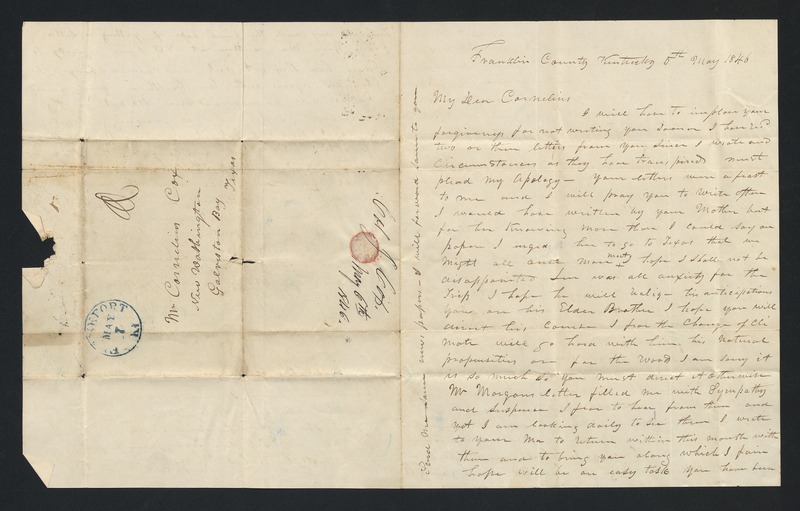 In 1849, Cornelius Cox left Texas for California during the Gold Rush. 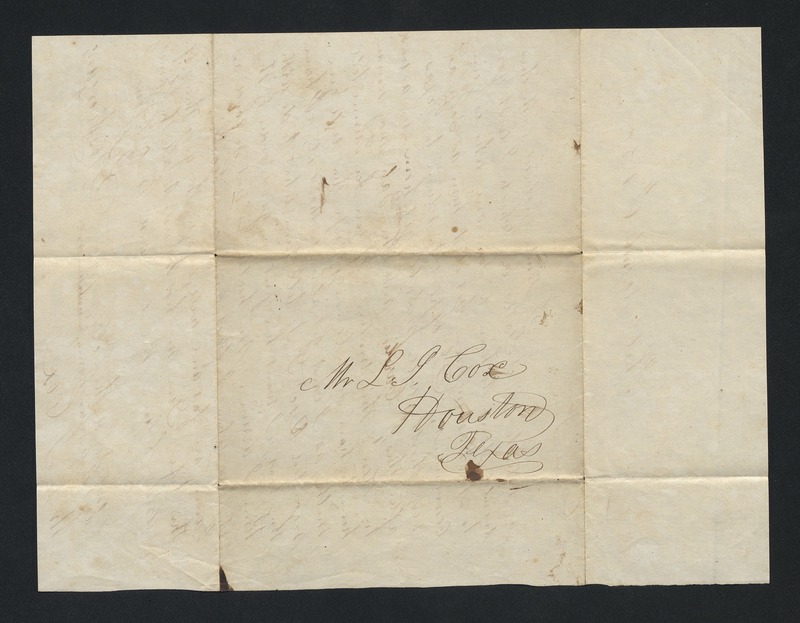 Caroline had 8 children, six of whom lived to adulthood included Fannie Belle, Charlie, Mary Olivia, Ophelia Cecilia, Maria Caroline, and Ellen Latham. 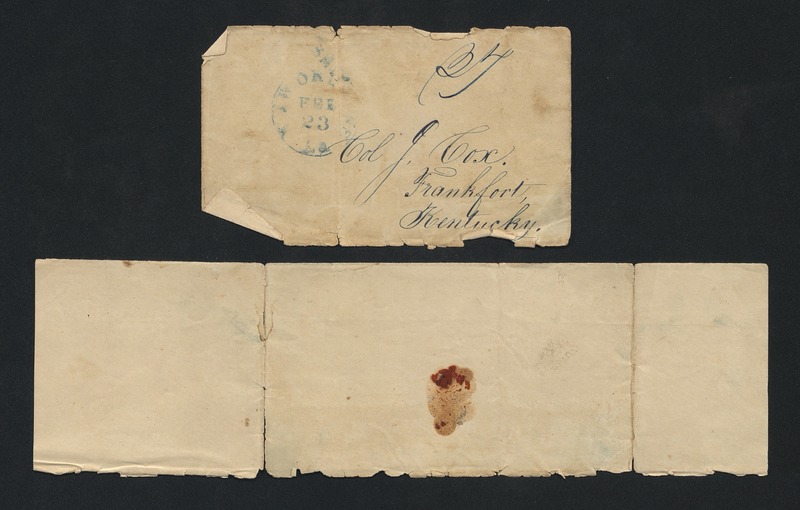 Following the death of Kos Morgan in 1865, Caroline moved to Kentucky to care for her elderly mother. 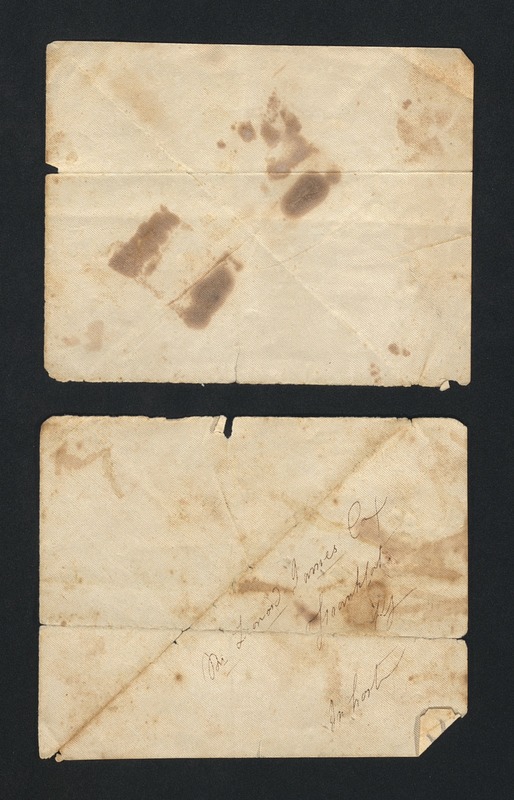 She died in 1867 in Kentucky of tuberculosis. 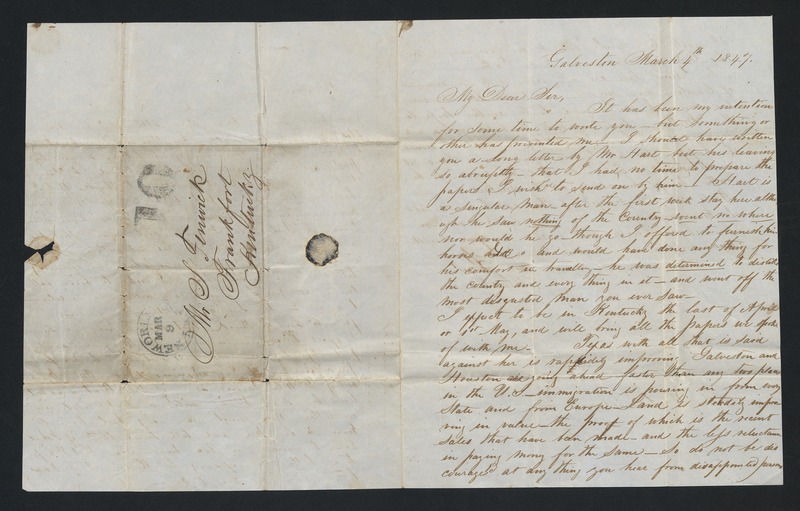 The Caroline Cox Morgan family papers (dated 1839-1863, undated; 0.45 cubic feet; 82 items) comprise correspondence between various Cox and Morgan family members in Kentucky and Texas relating to the Texas Revolution, the Mexican War, and the California Gold Rush as well as daily life. 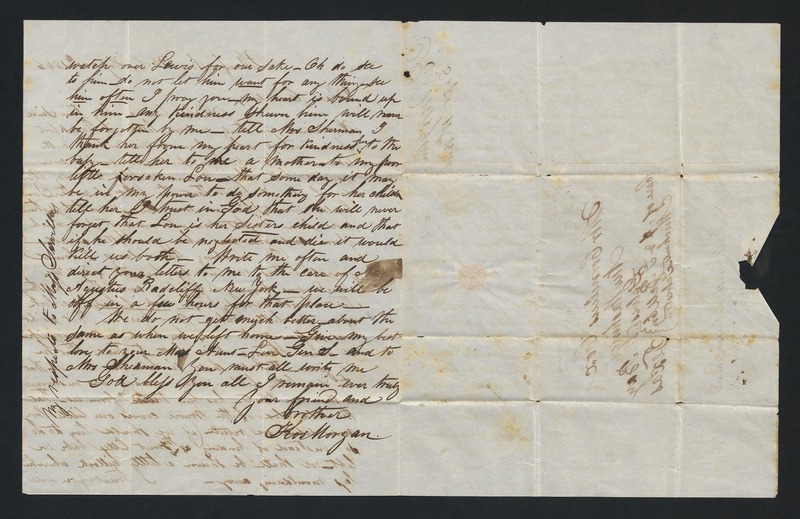 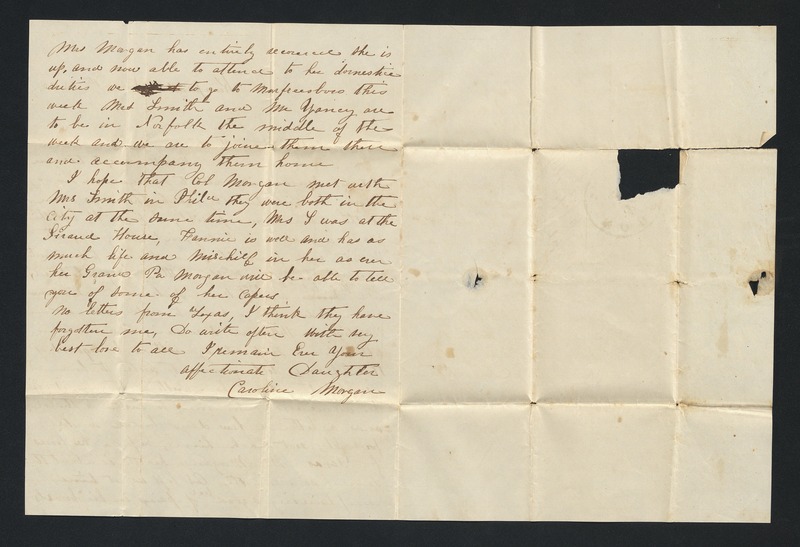 The bulk of the papers consist of letters sent to and by Caroline Cox Morgan. 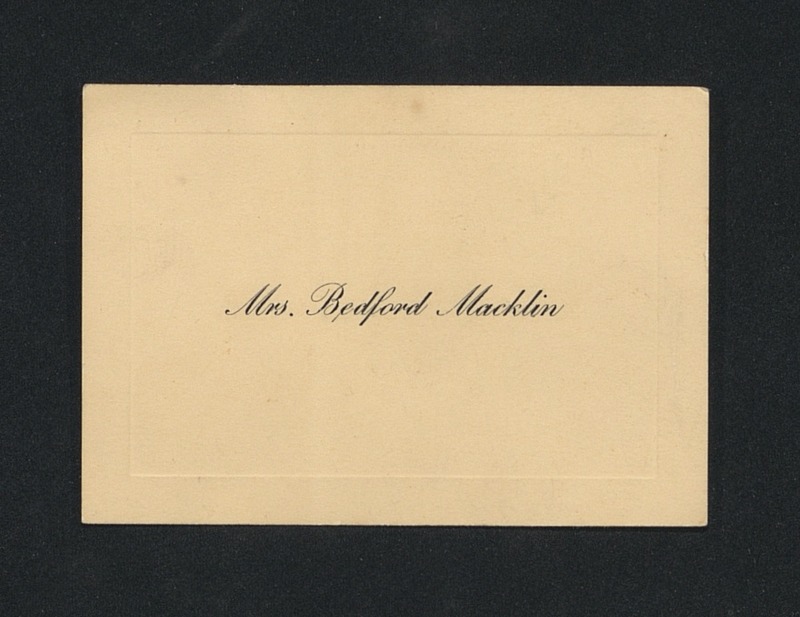 Her frequent correspondants include her sister Bella Sherman, her father Jacob Cox, her mother Maria Cox, and her brother Leonard James Cox. 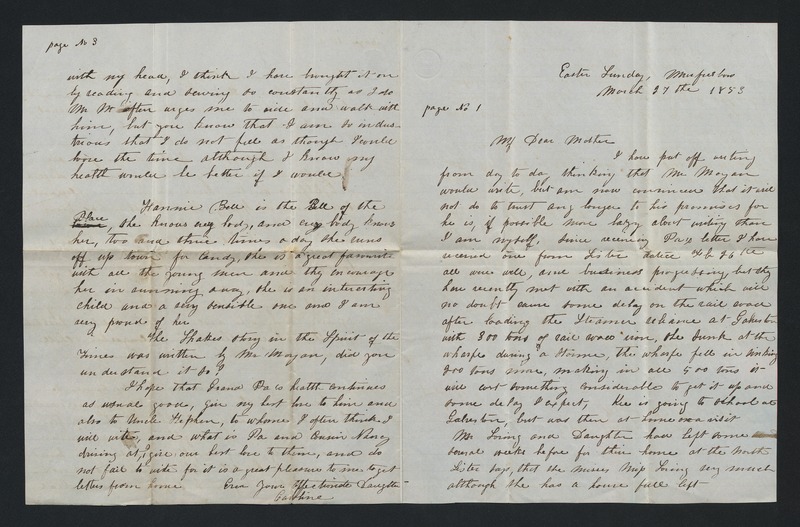 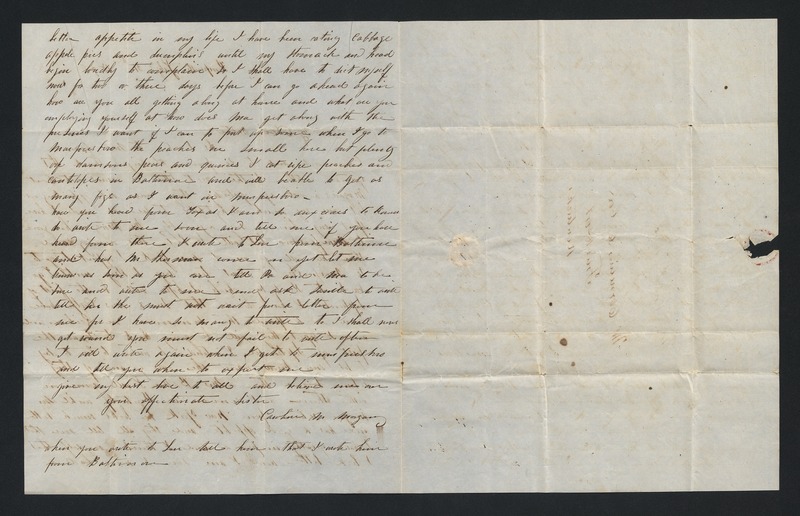 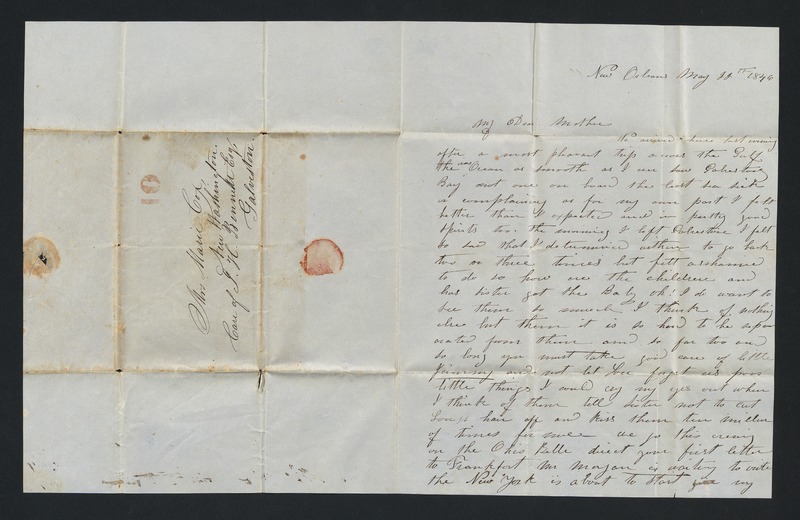 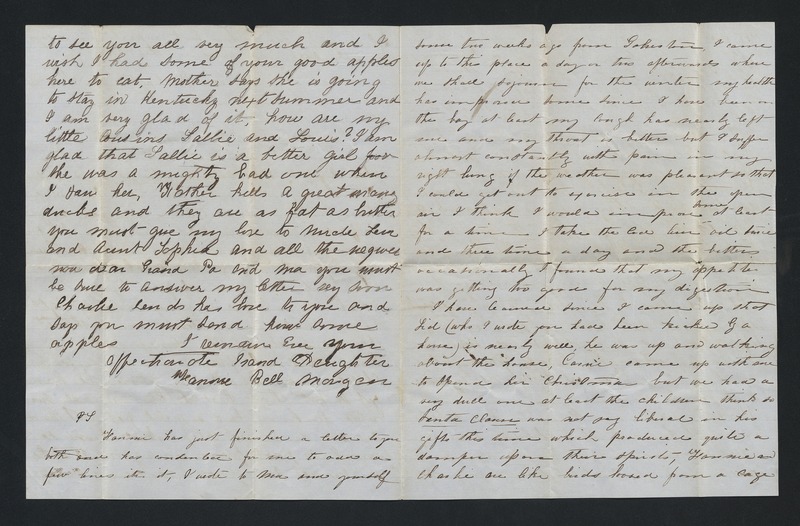 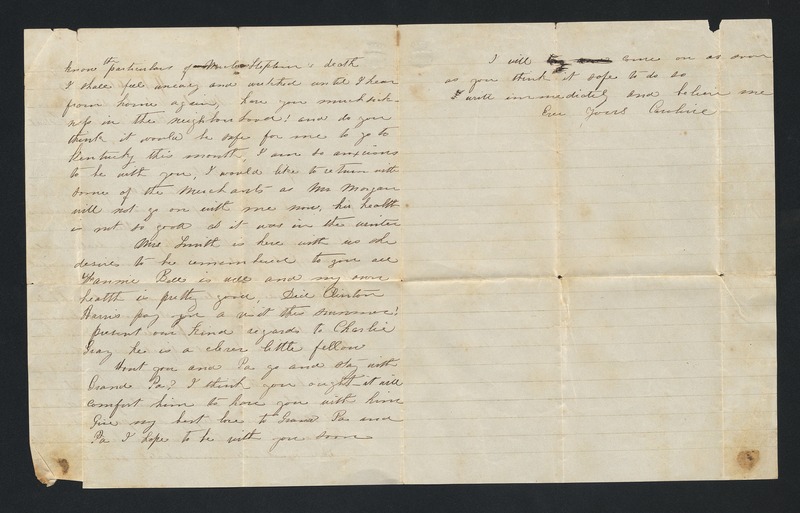 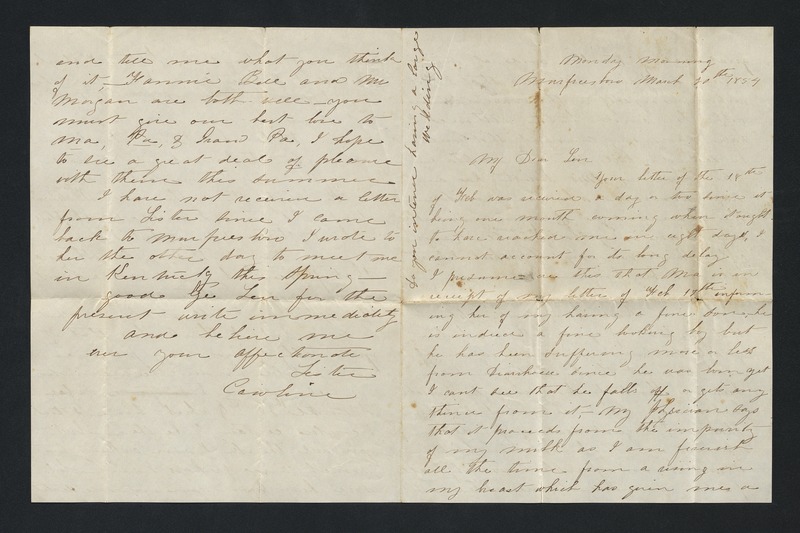 Three of the letters were written by Caroline's brother Louis Cox, who worked on river boats, during the year of his death, 1840. 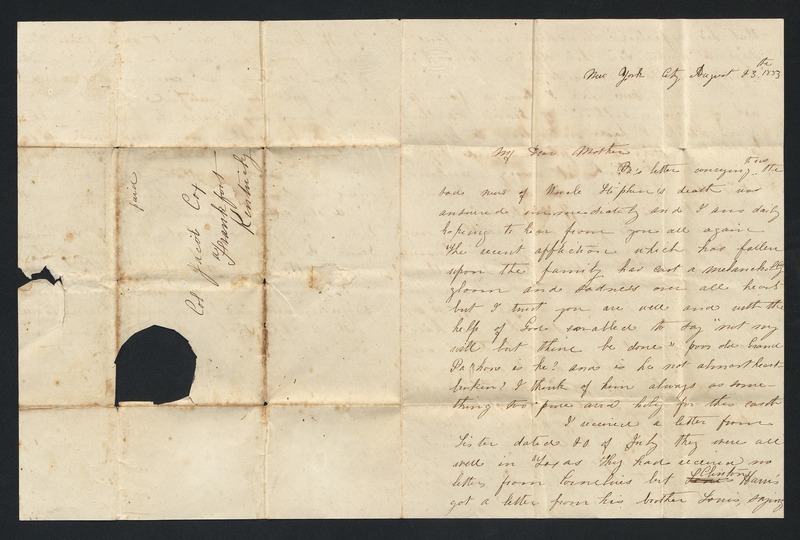 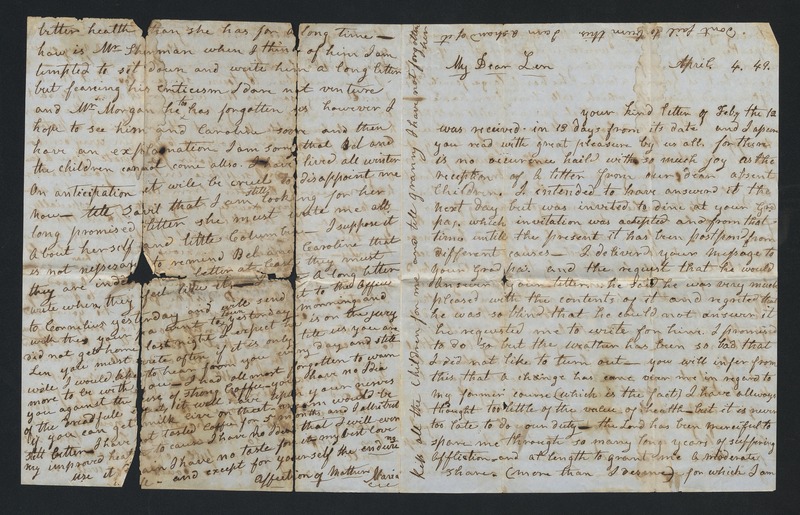 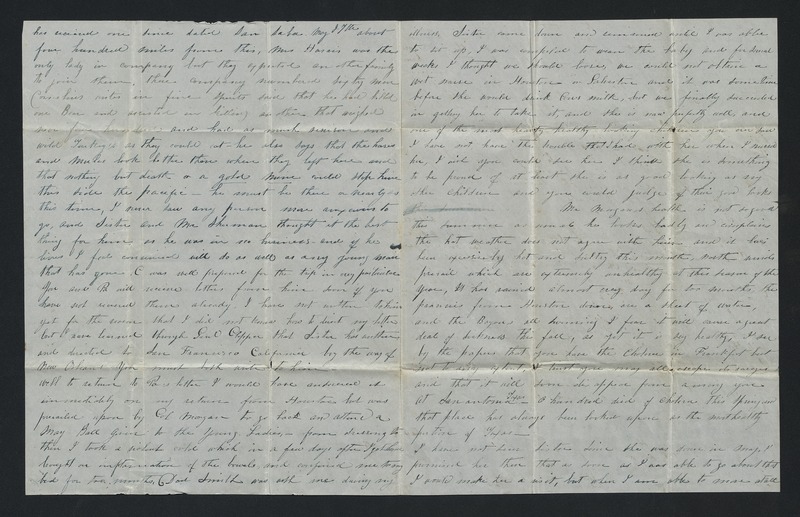 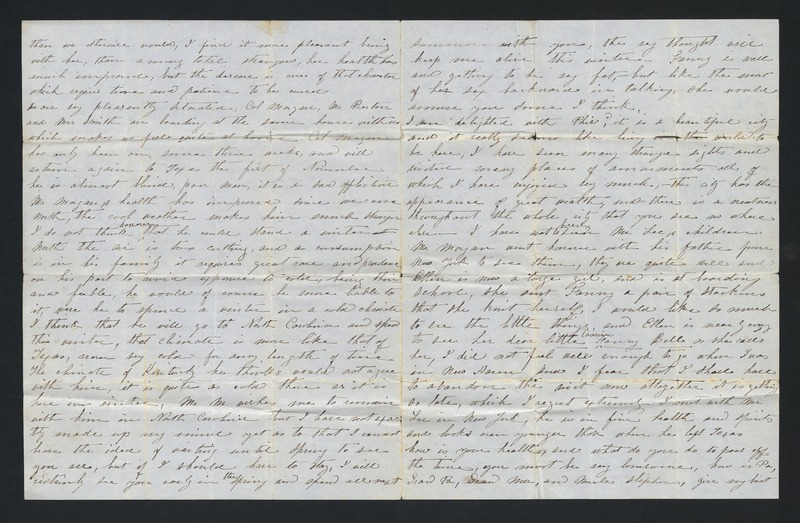 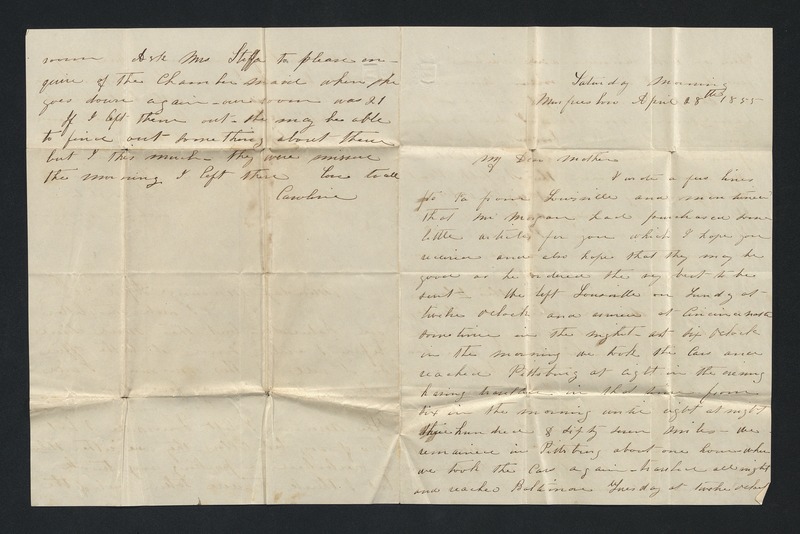 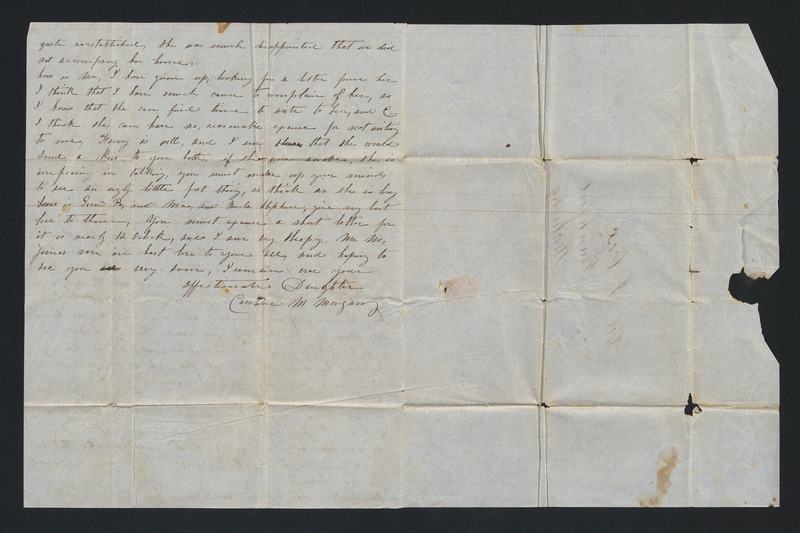 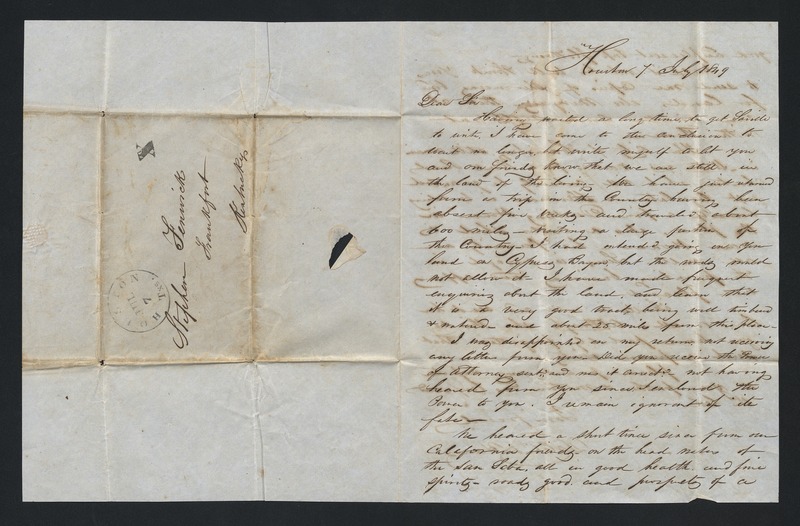 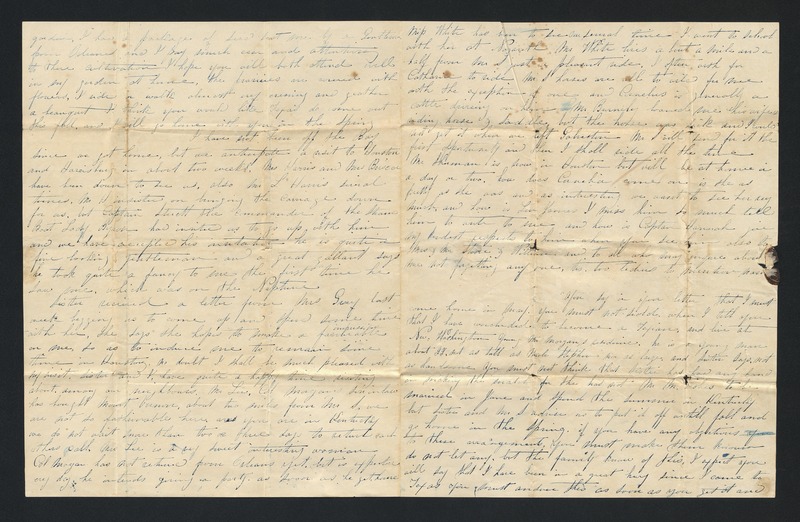 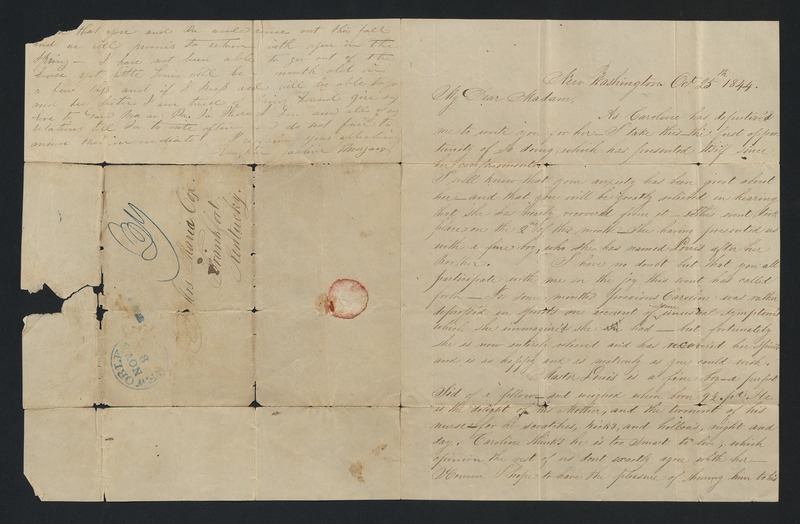 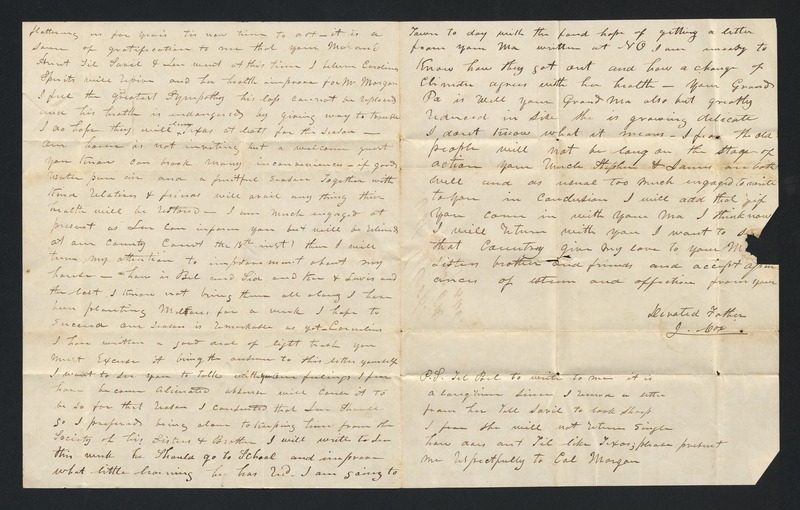 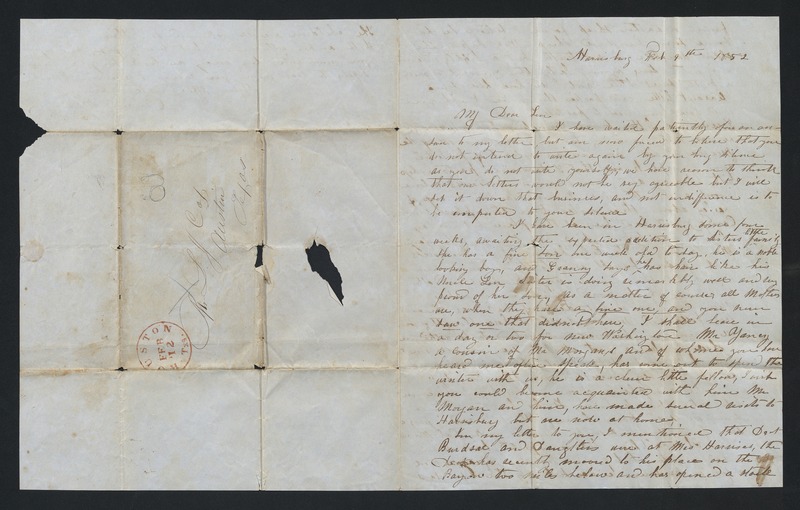 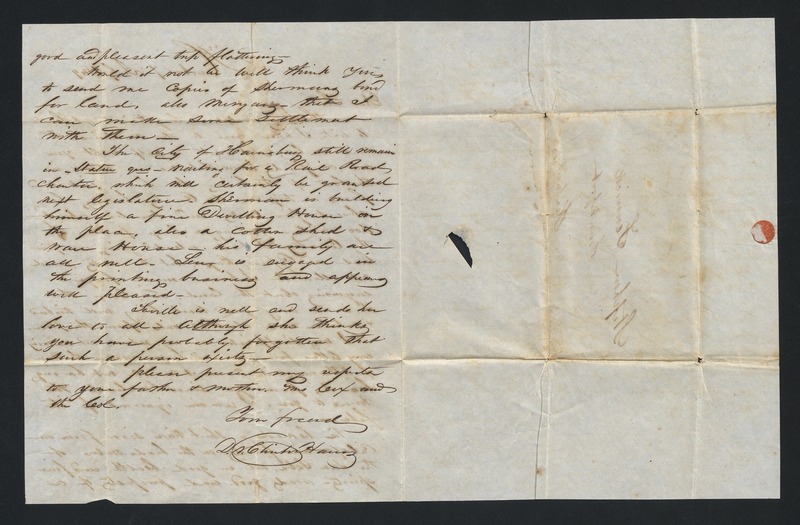 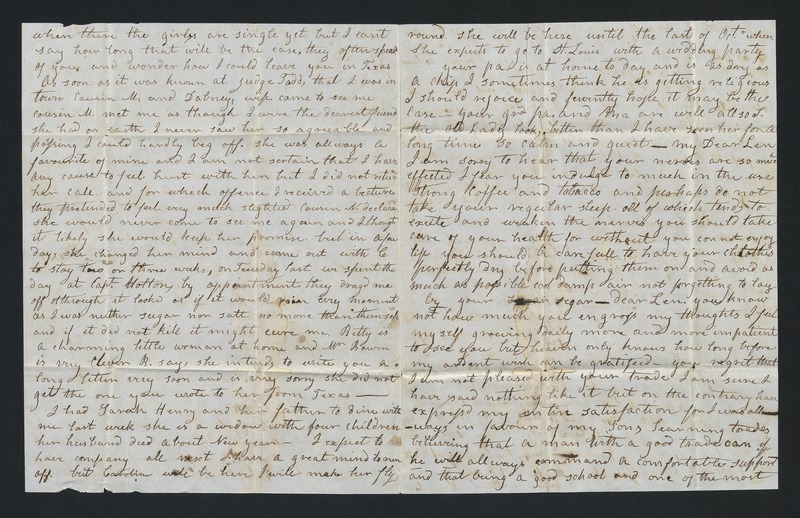 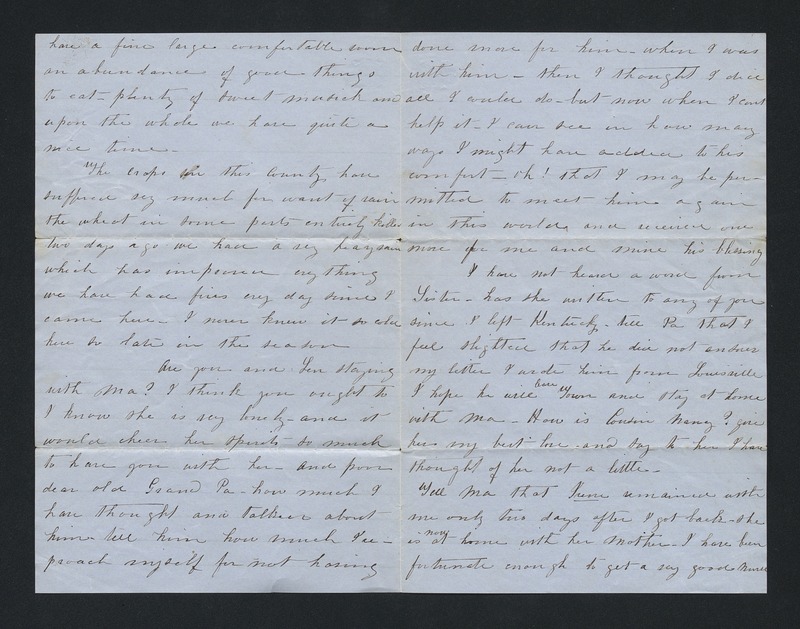 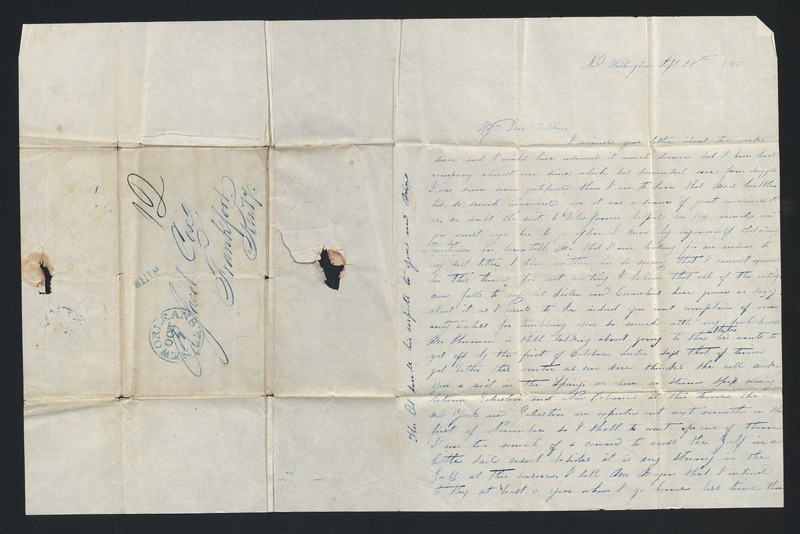 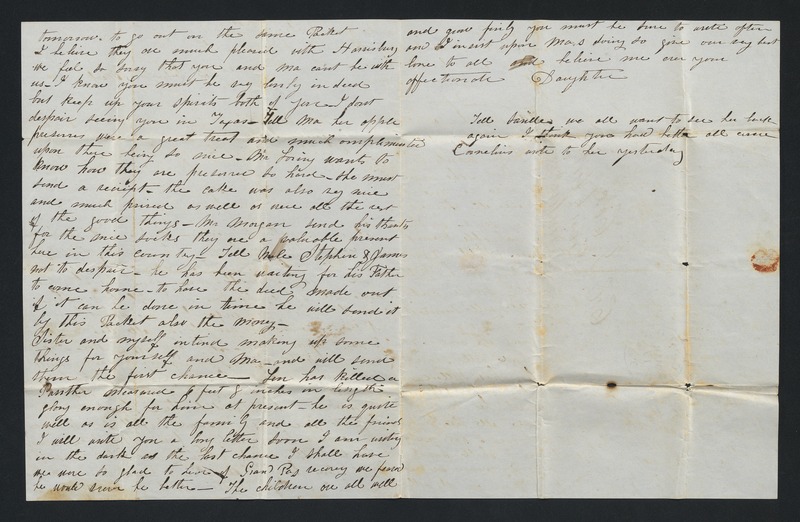 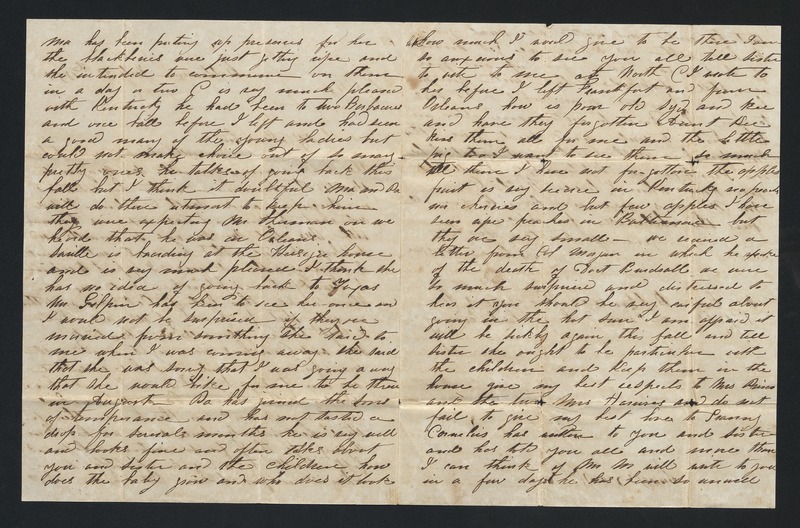 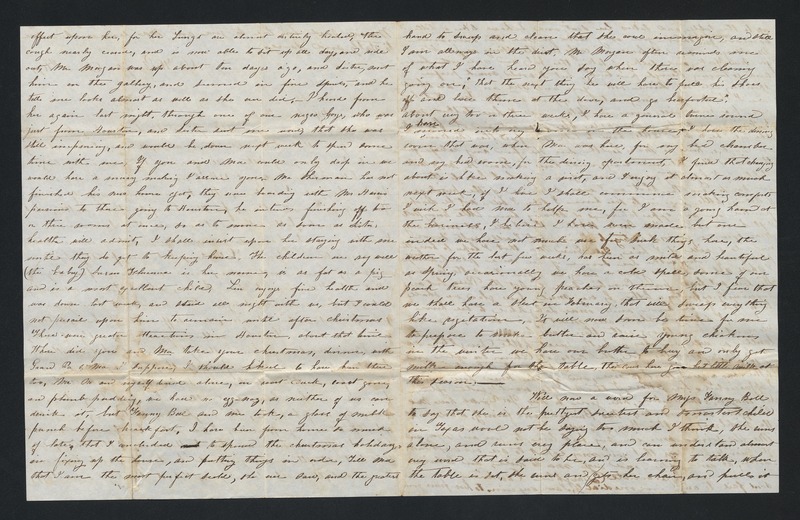 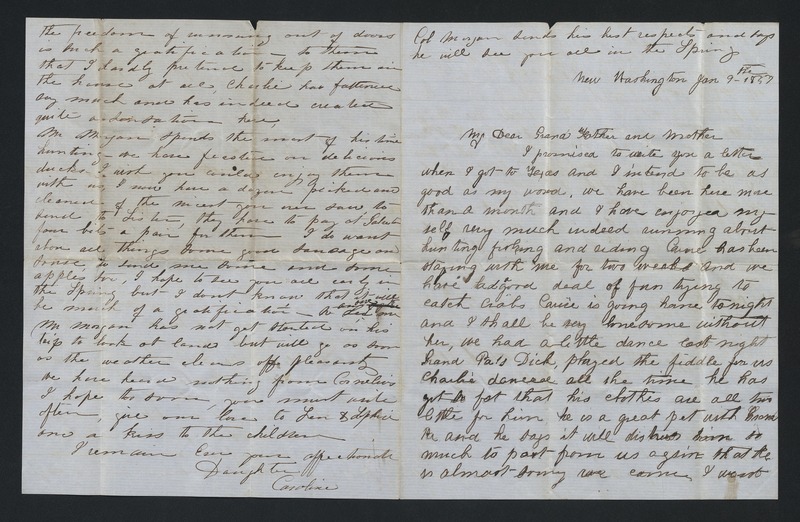 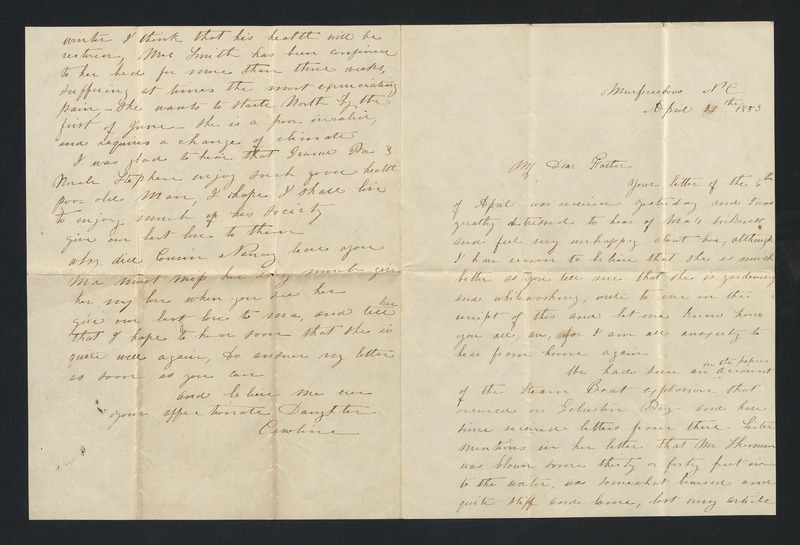 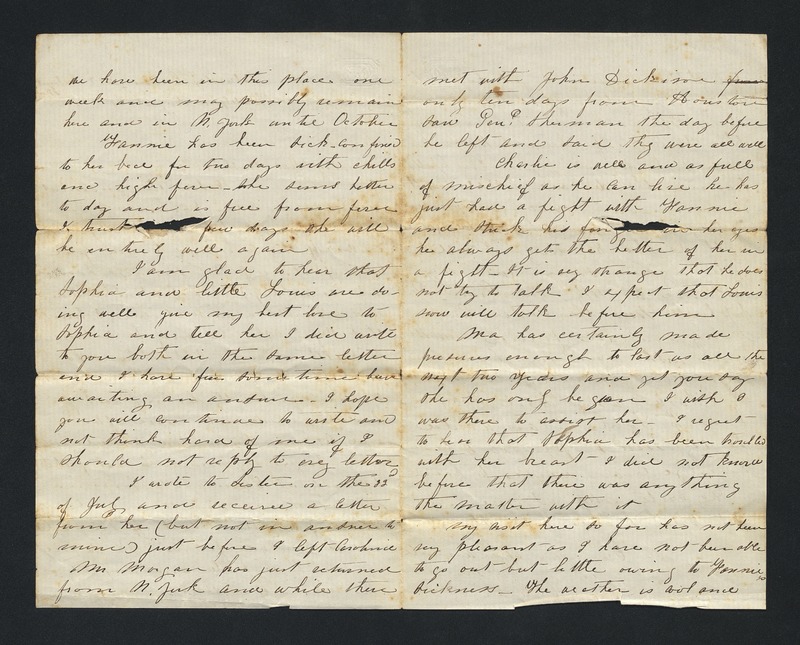 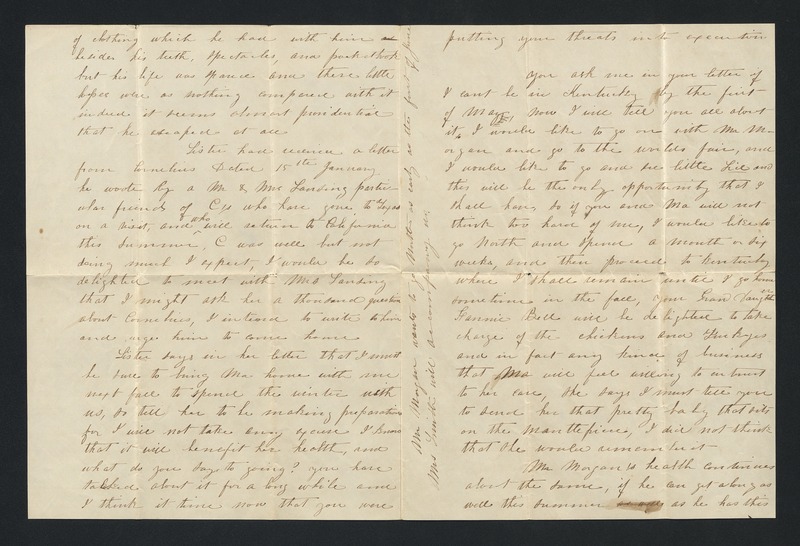 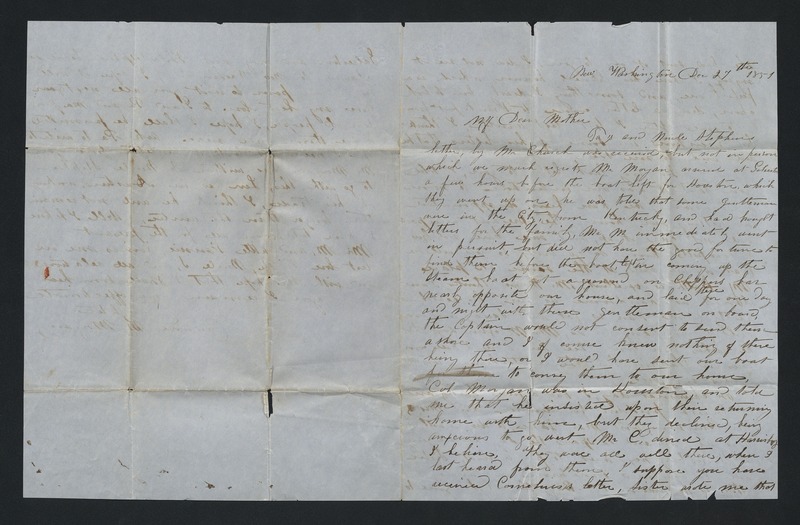 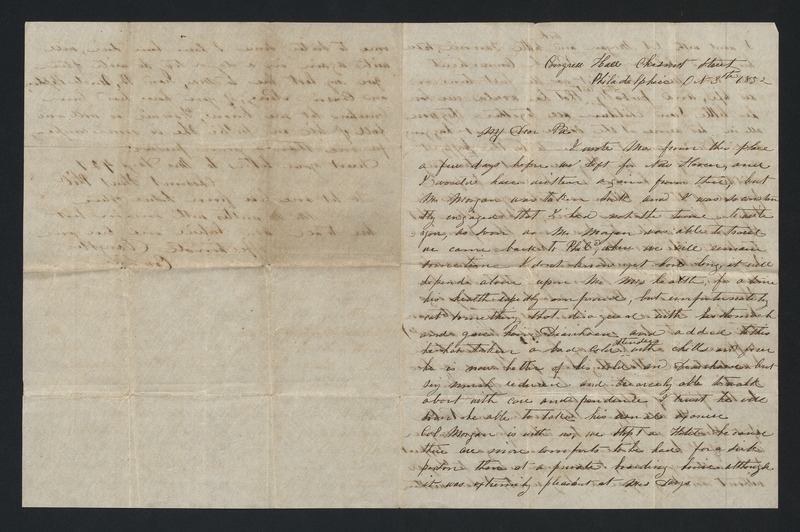 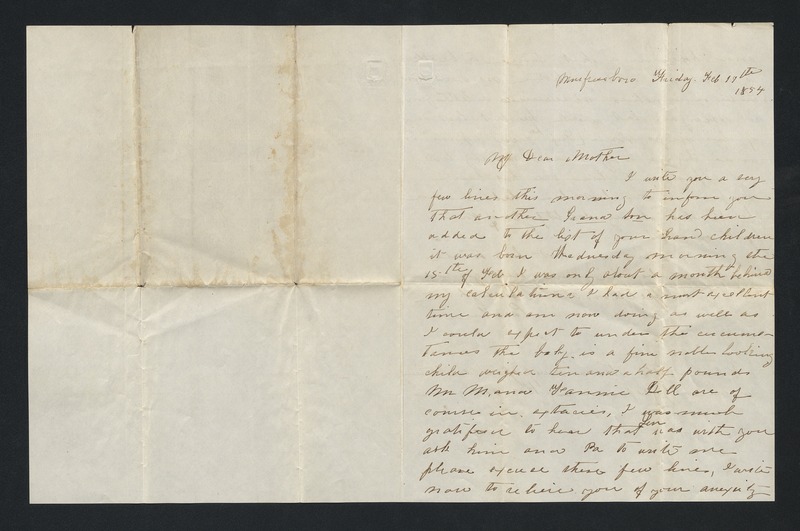 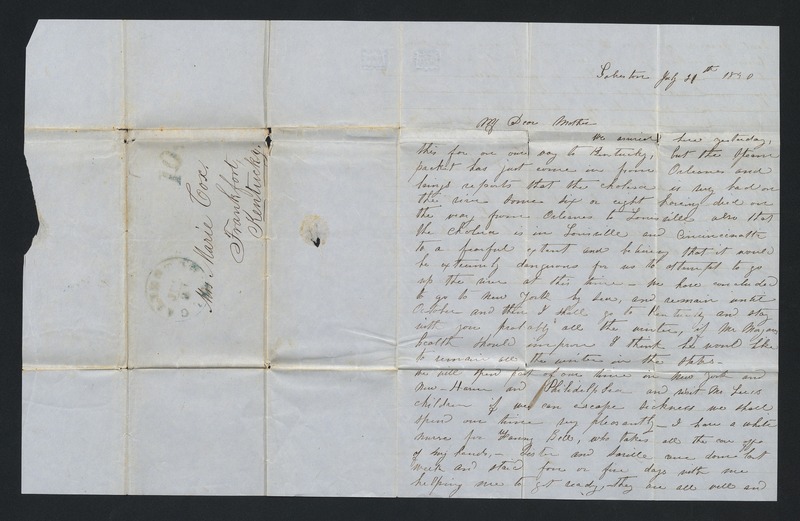 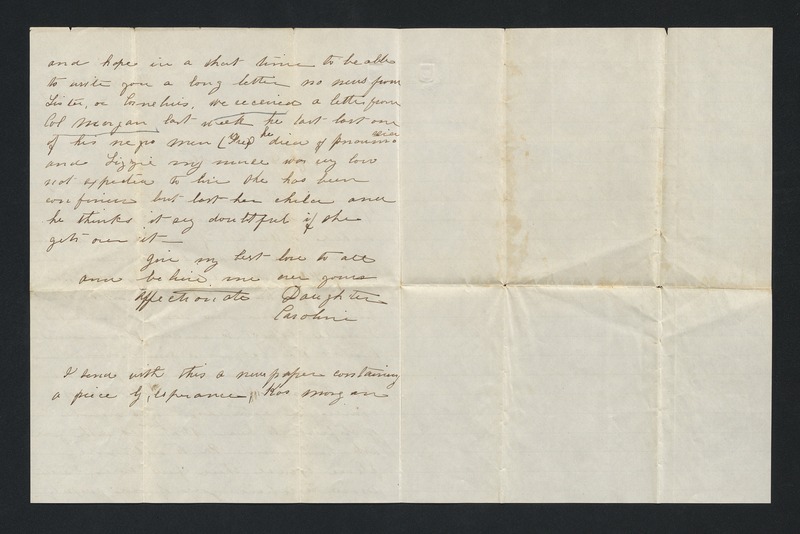 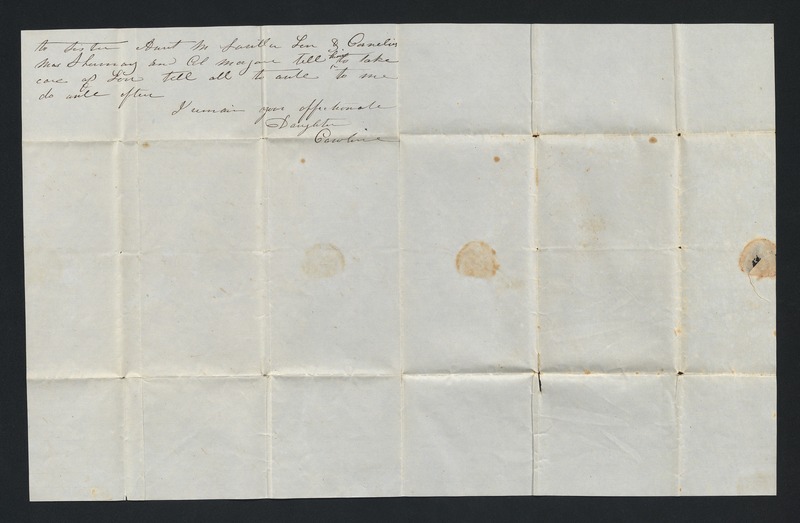 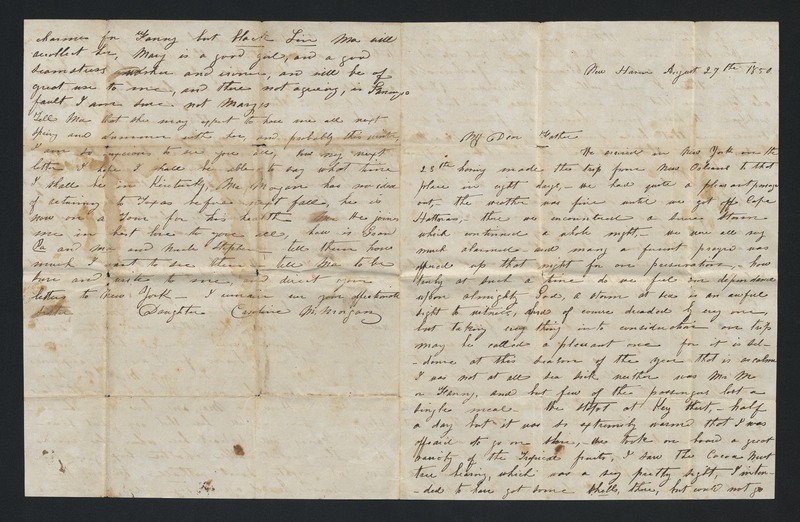 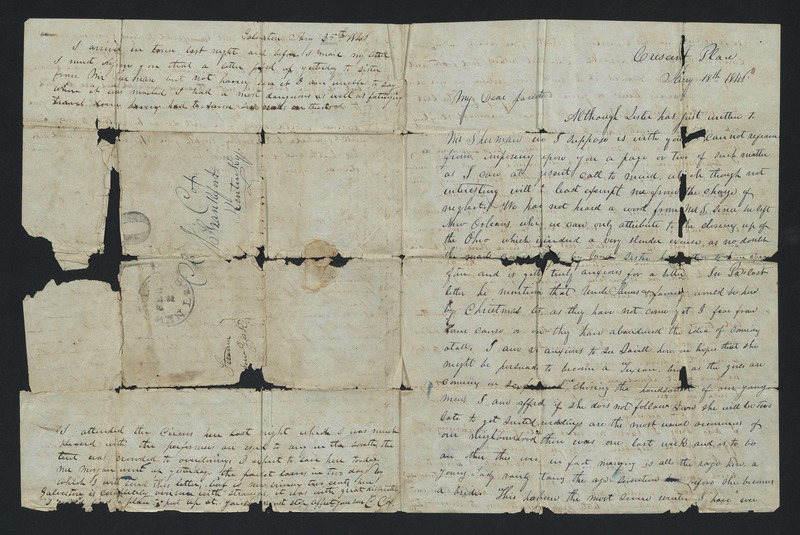 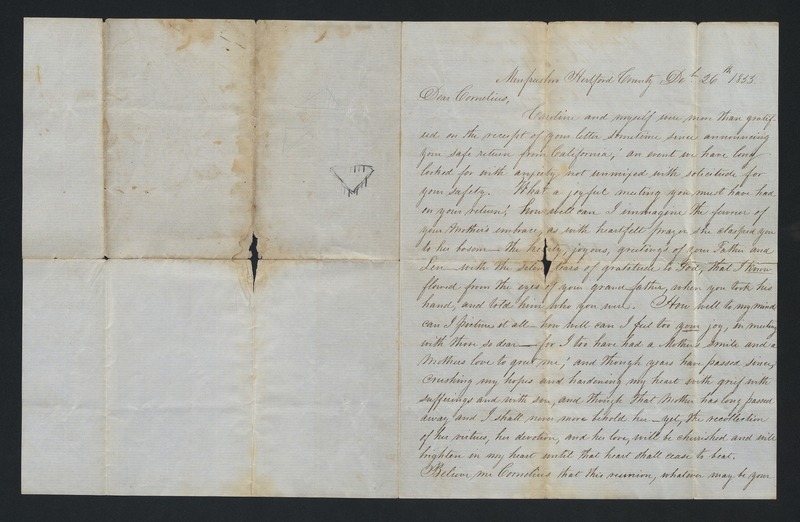 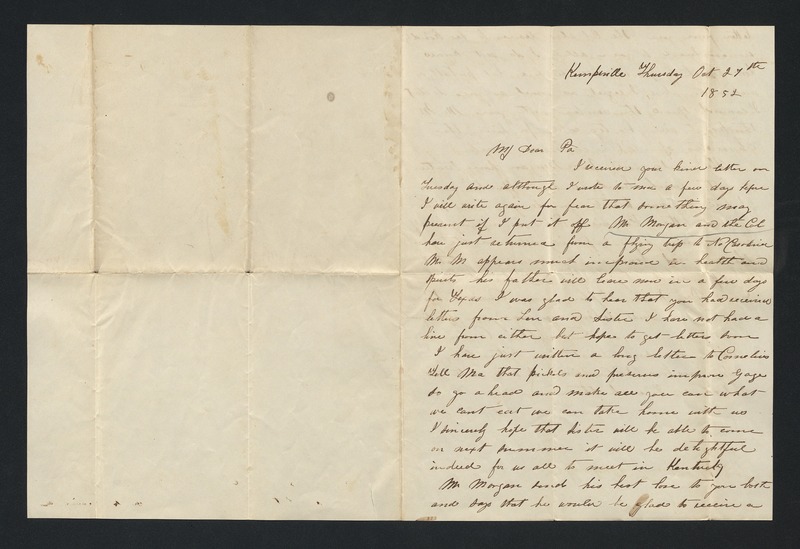 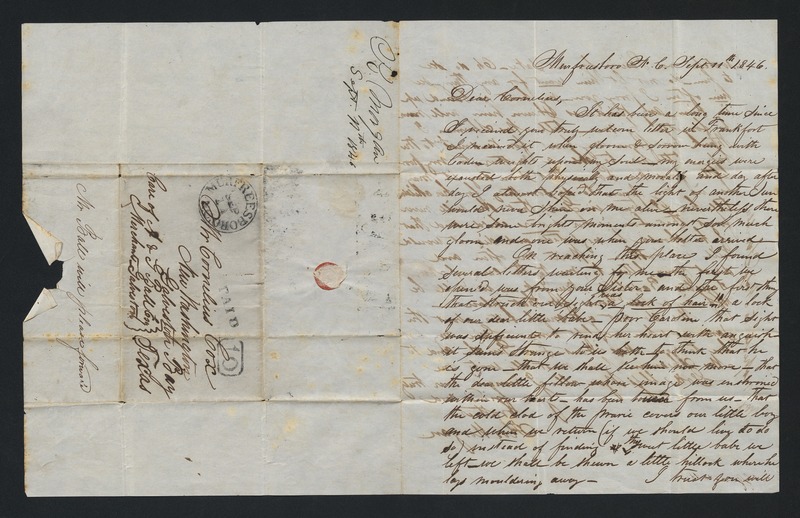 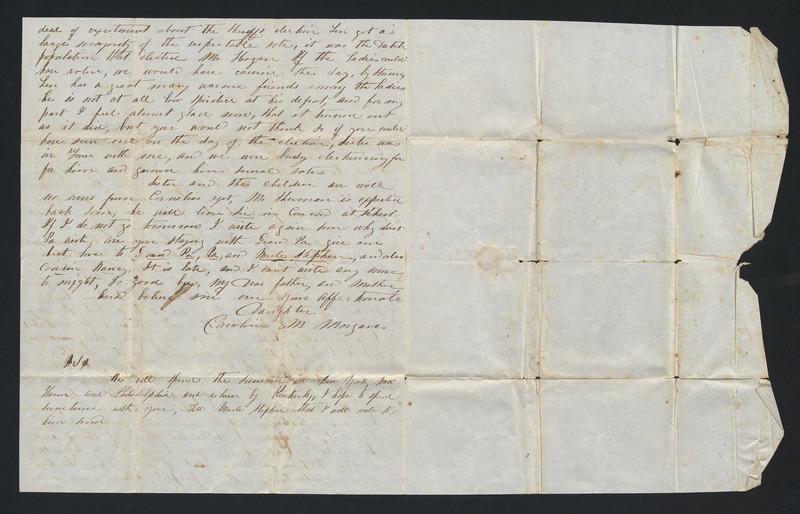 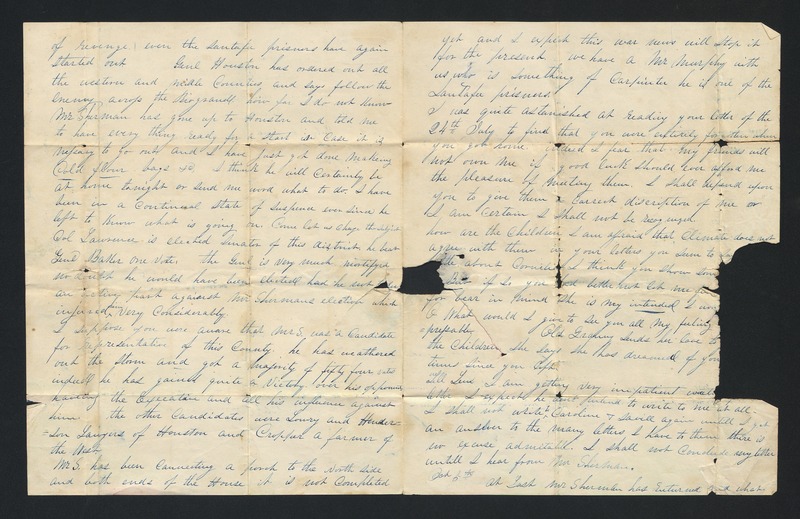 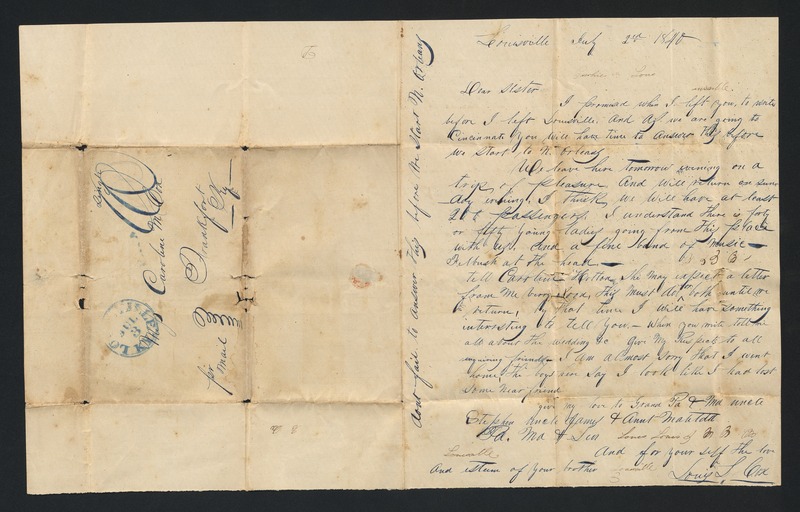 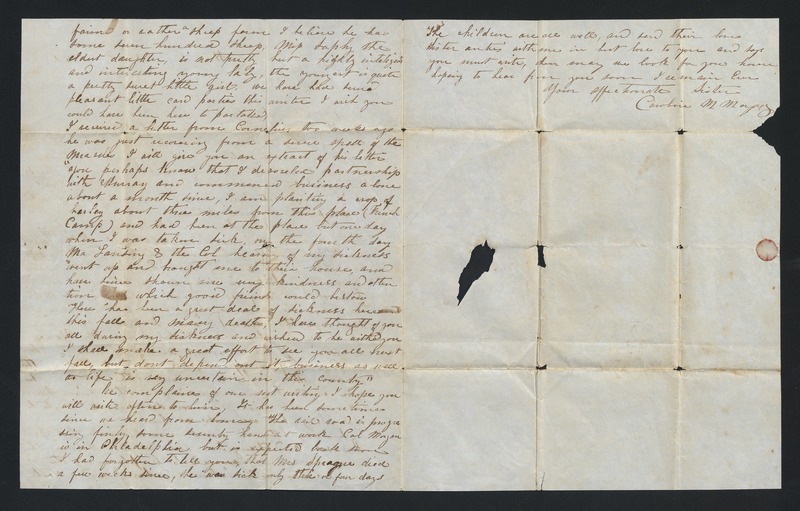 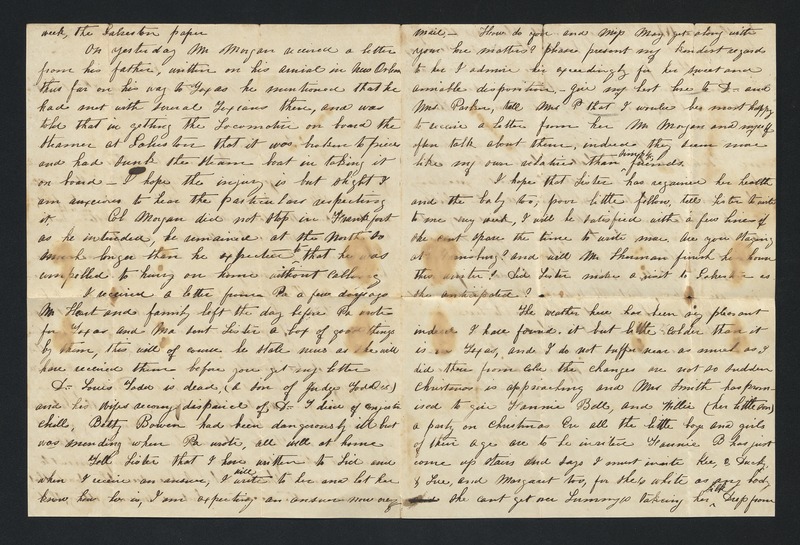 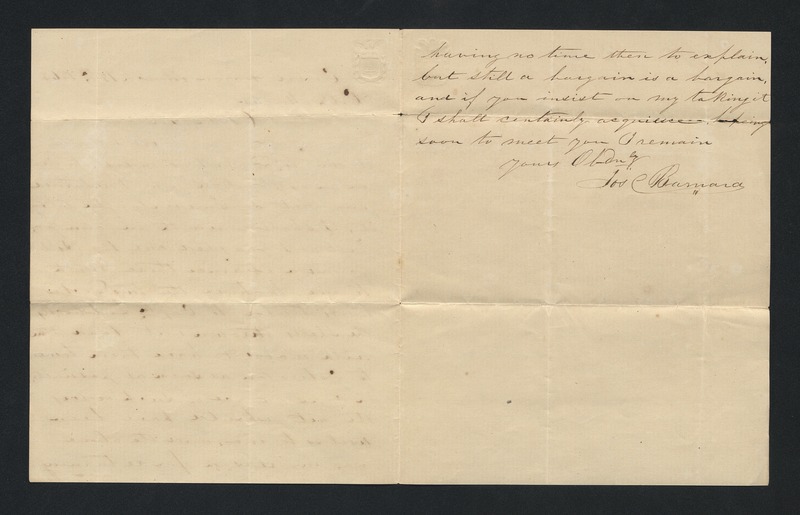 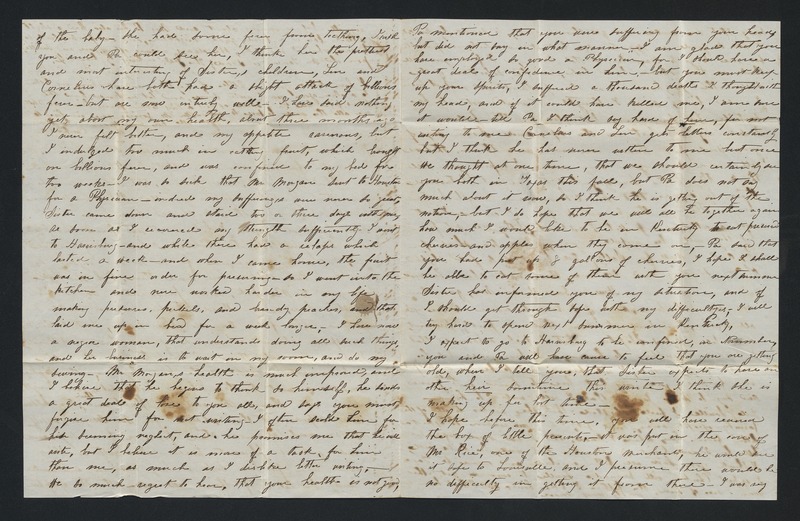 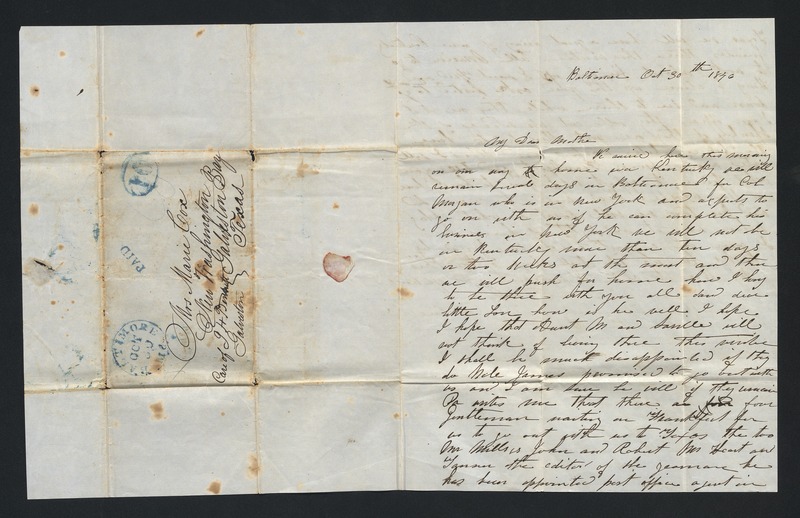 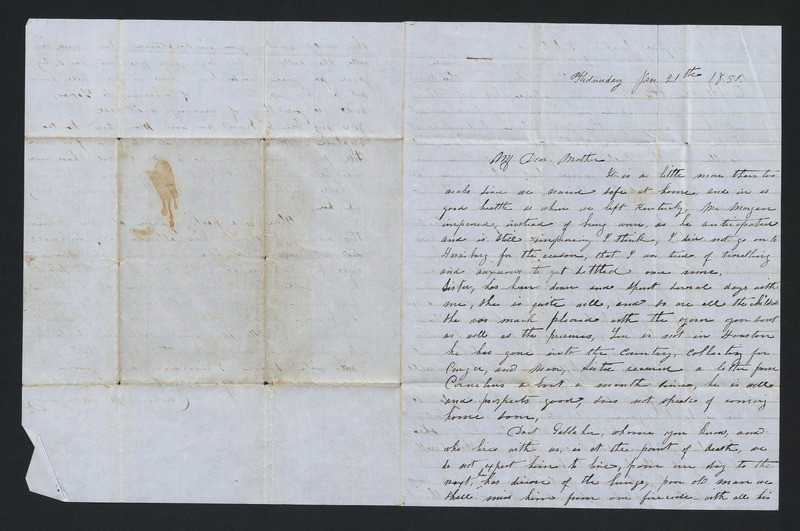 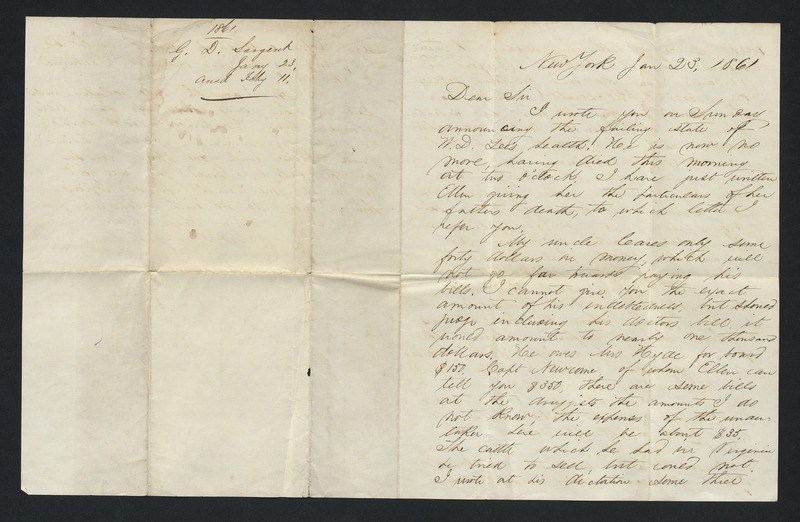 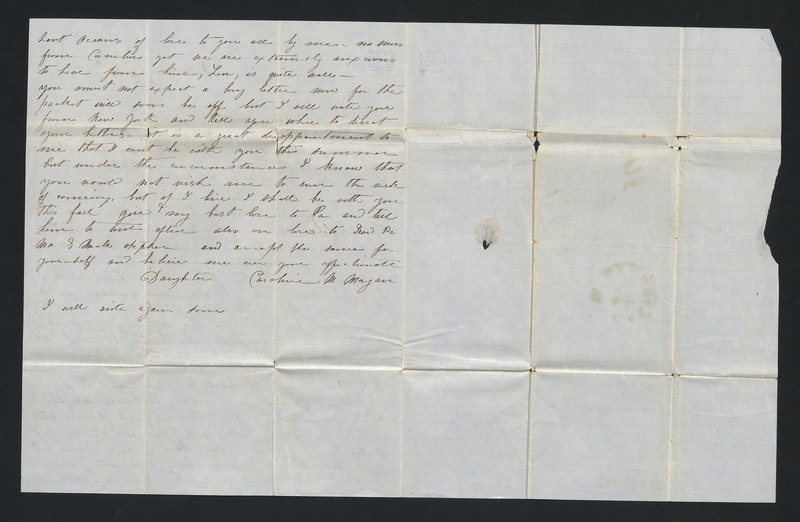 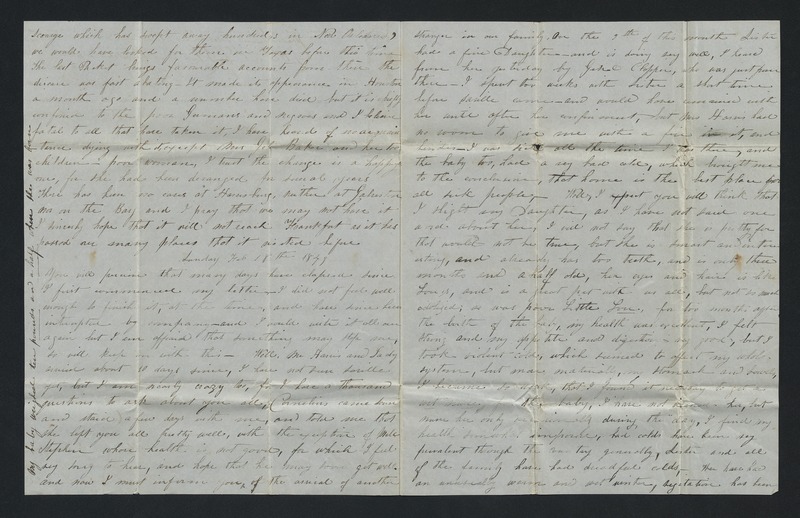 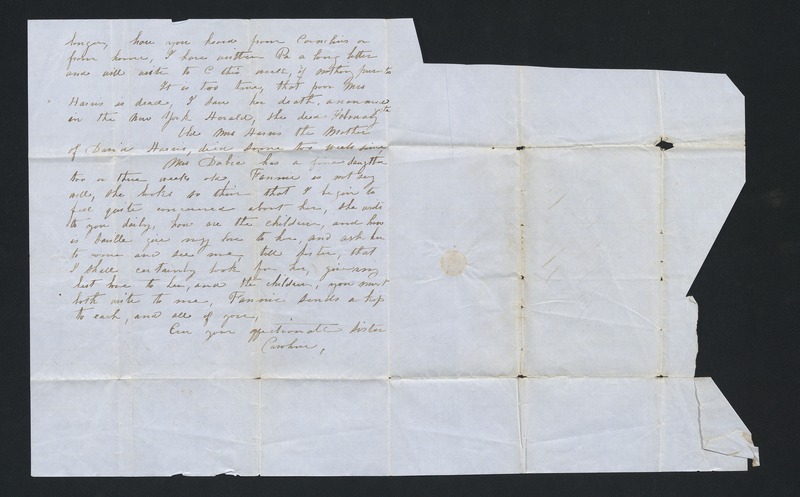 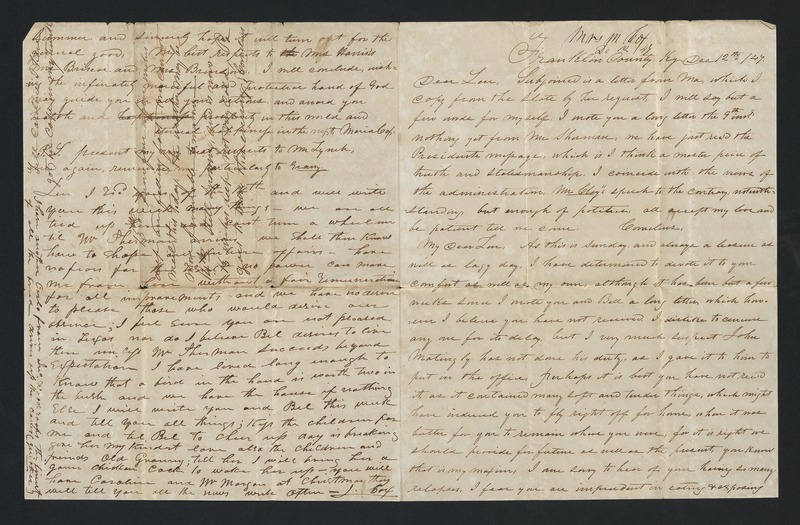 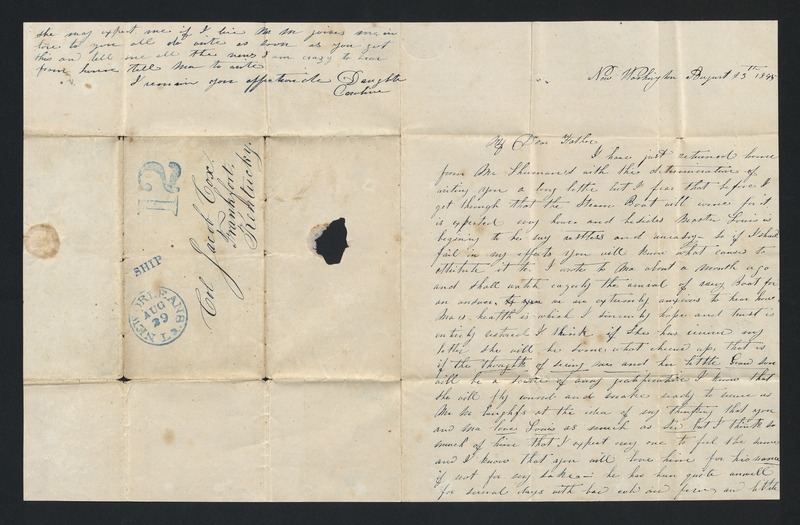 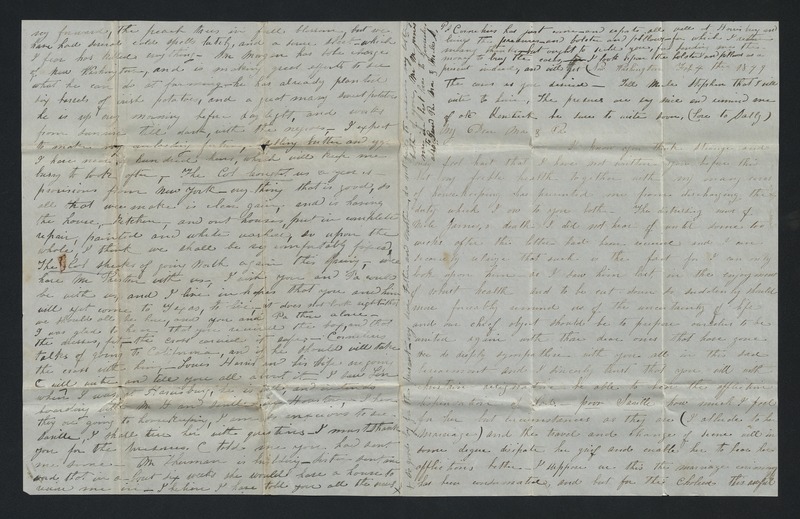 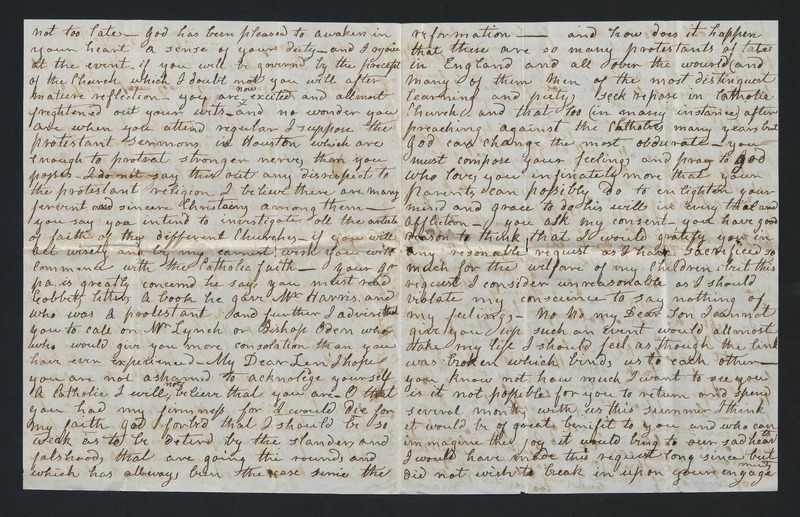 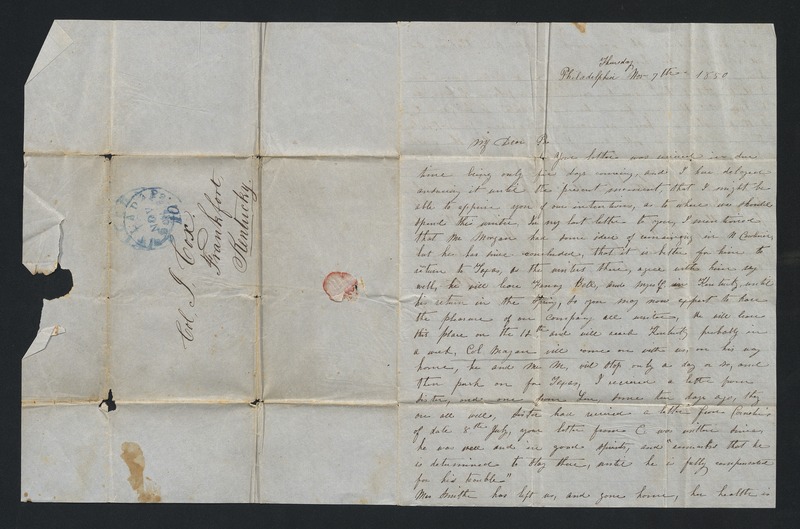 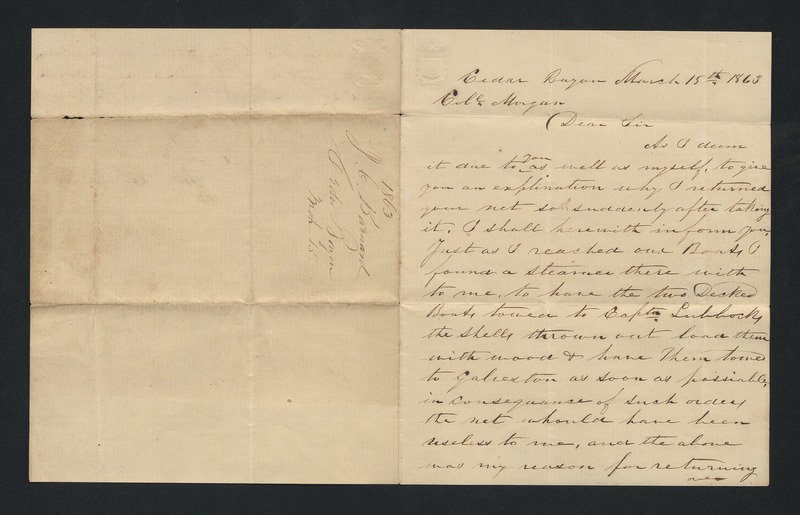 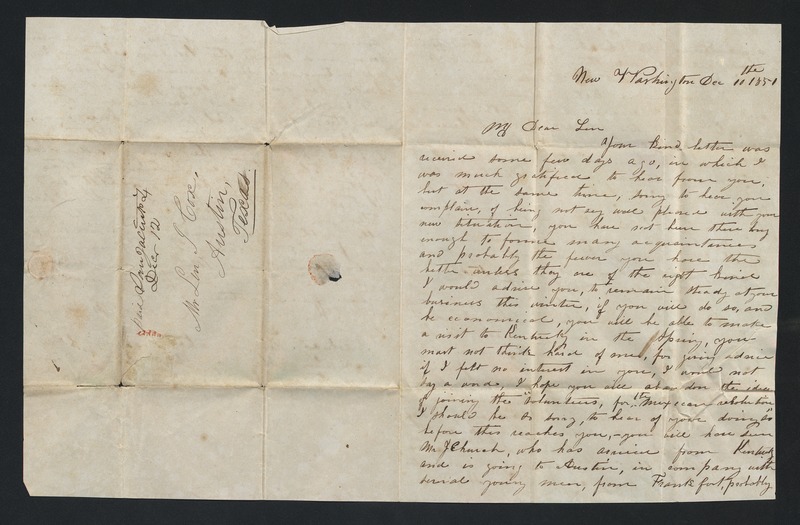 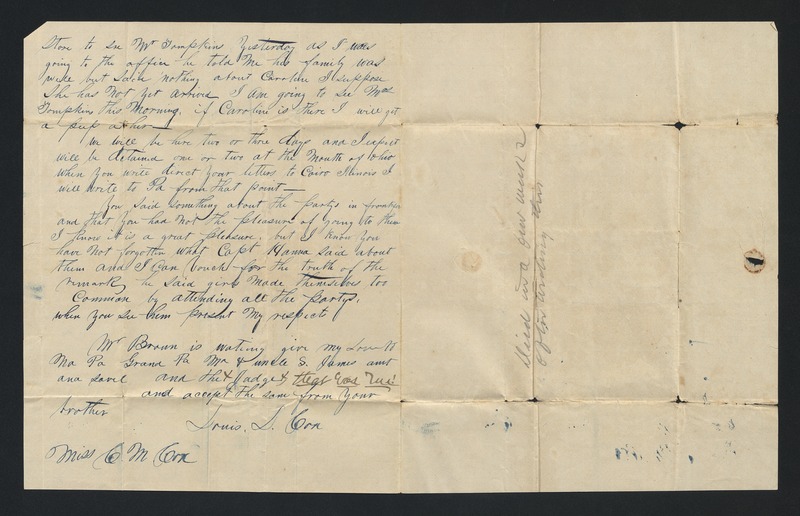 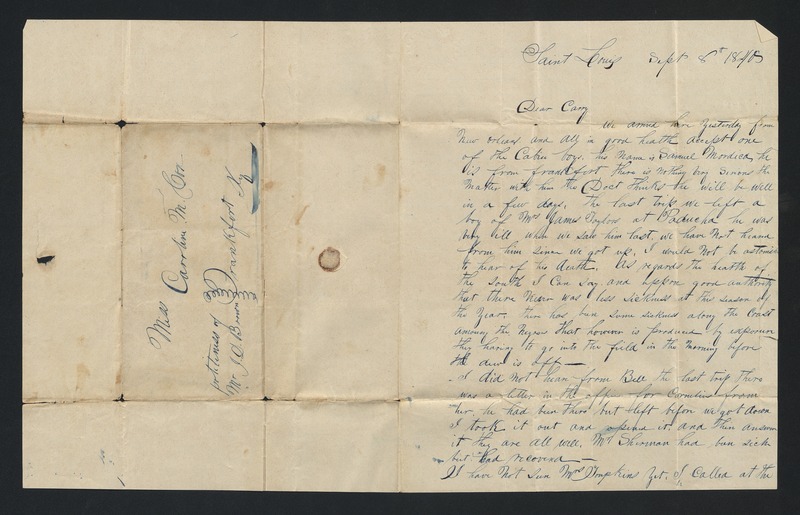 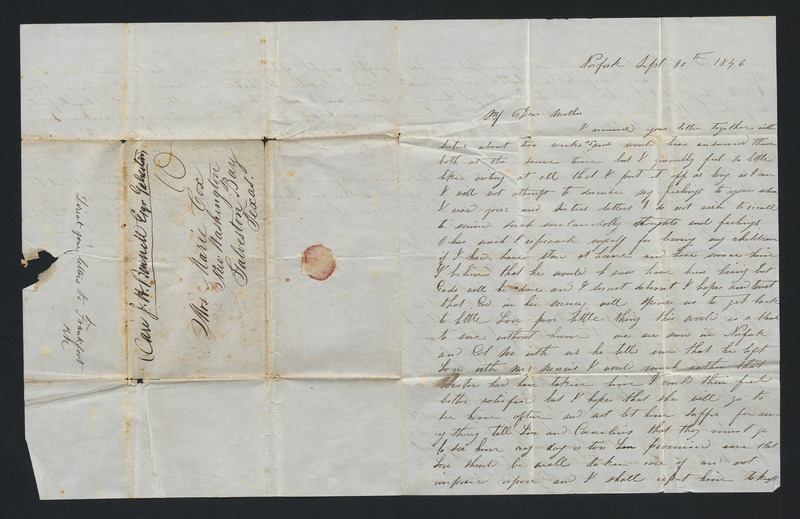 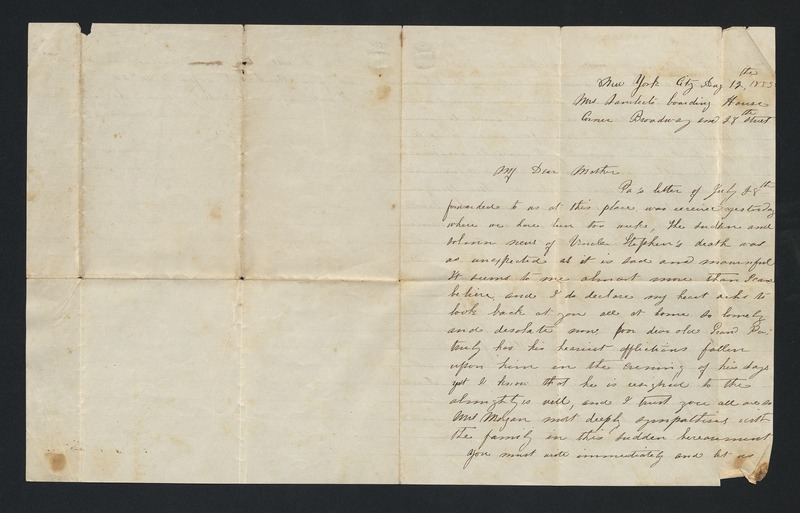 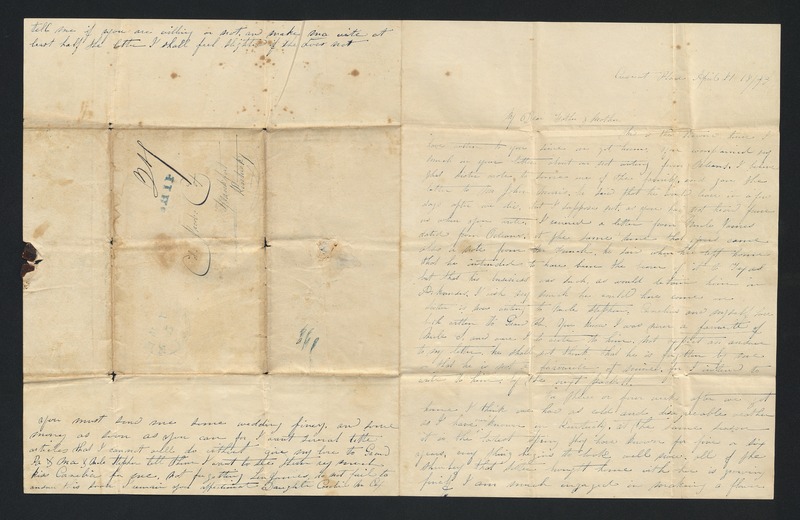 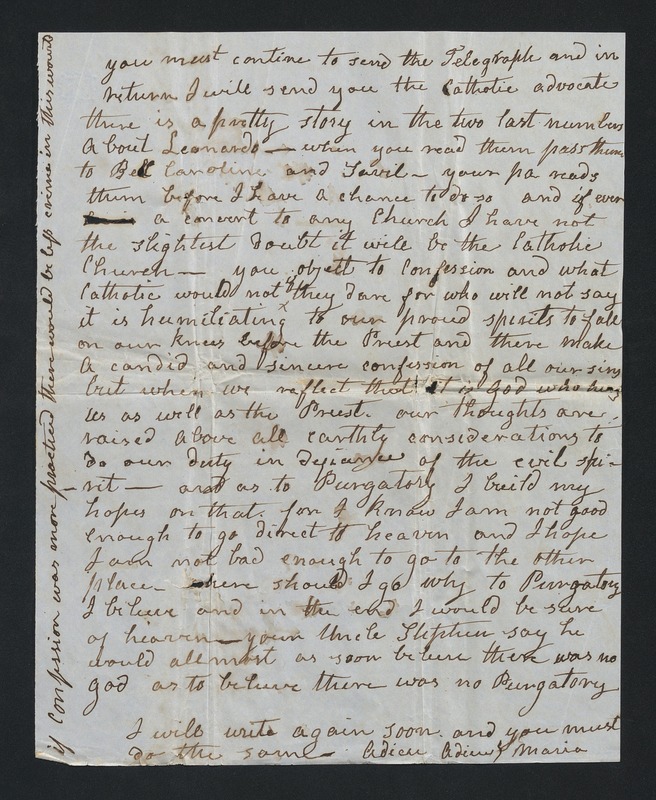 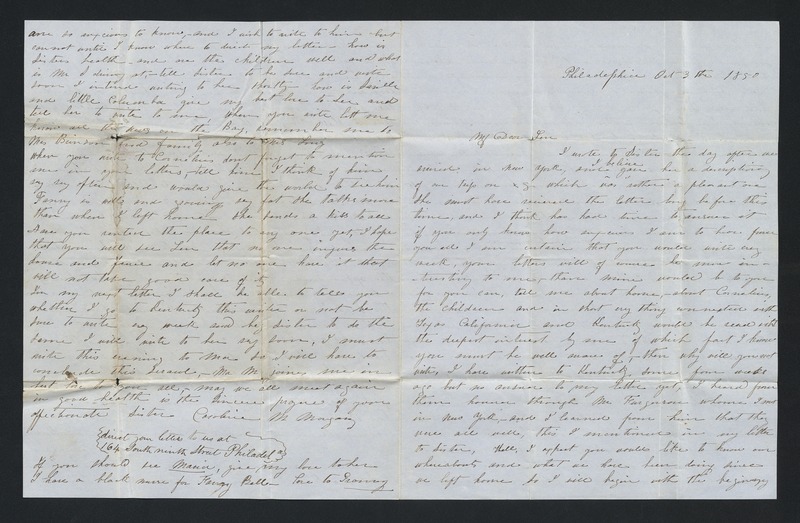 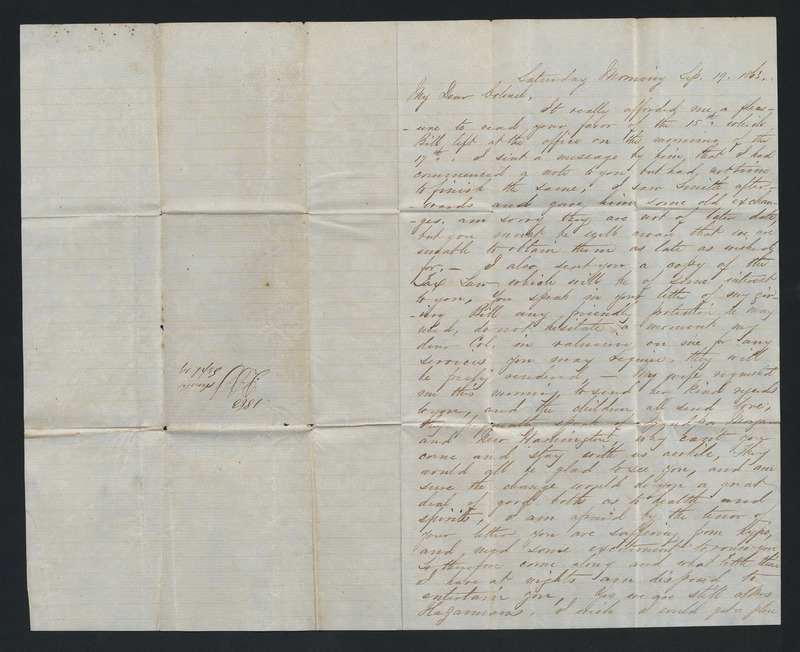 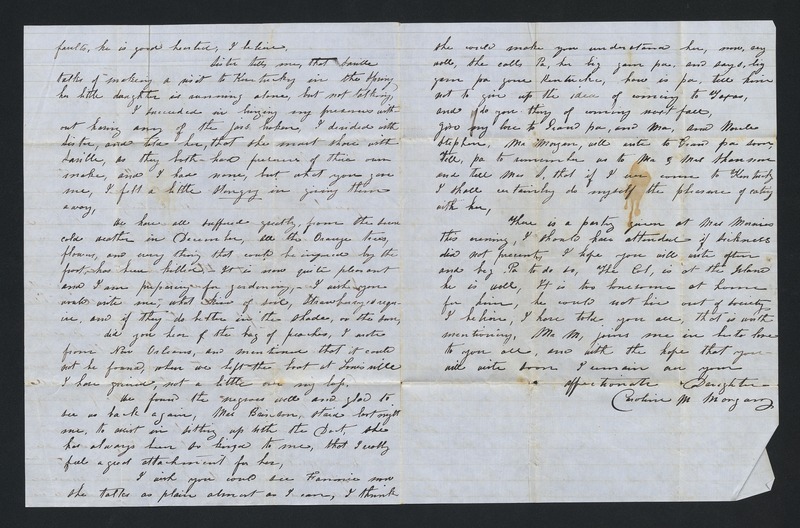 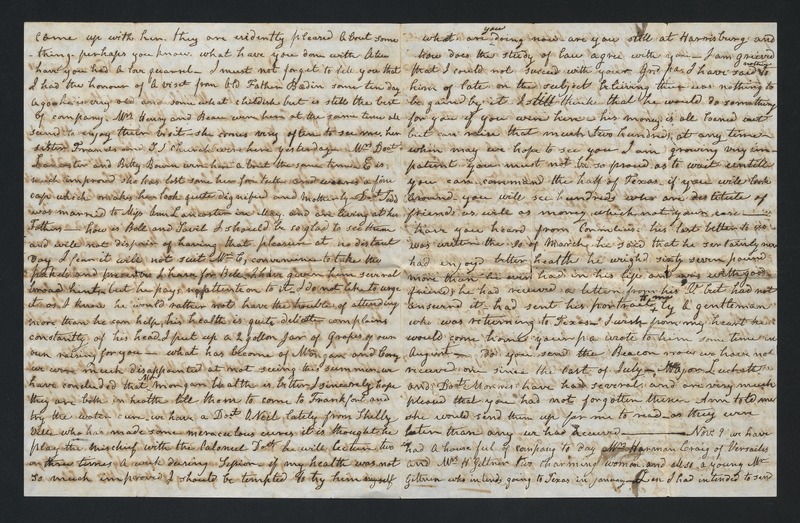 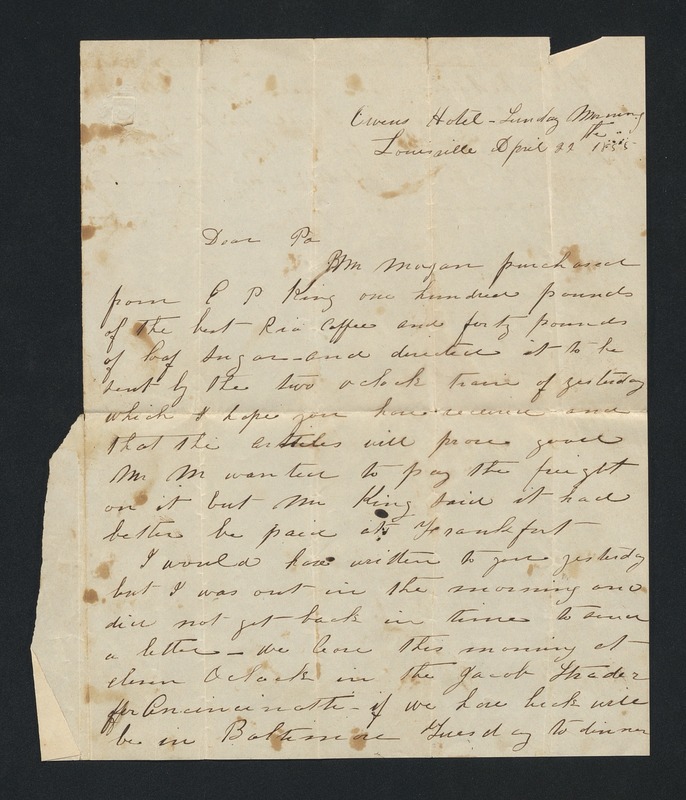 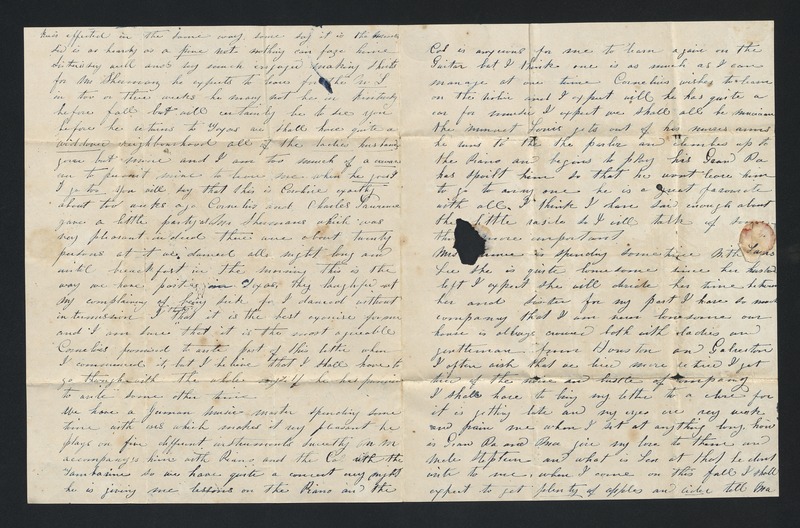 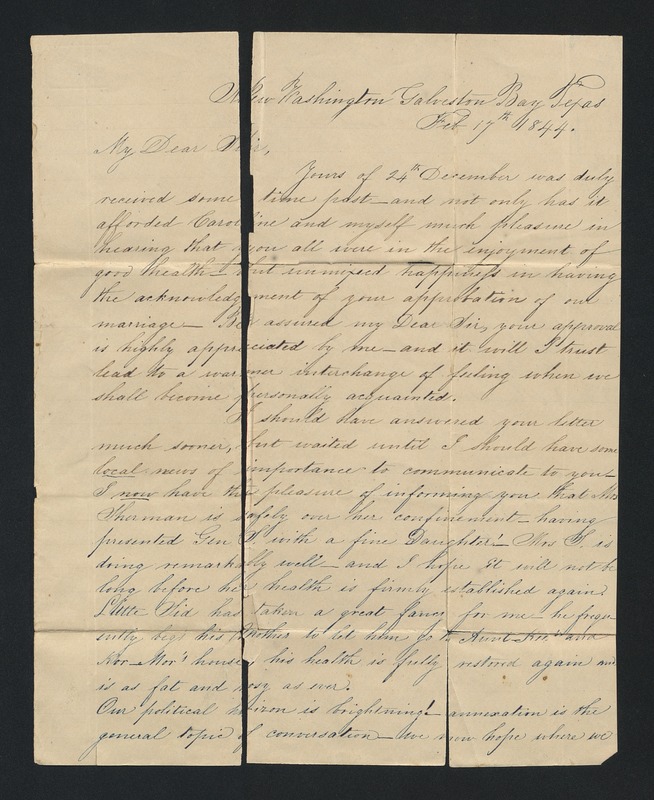 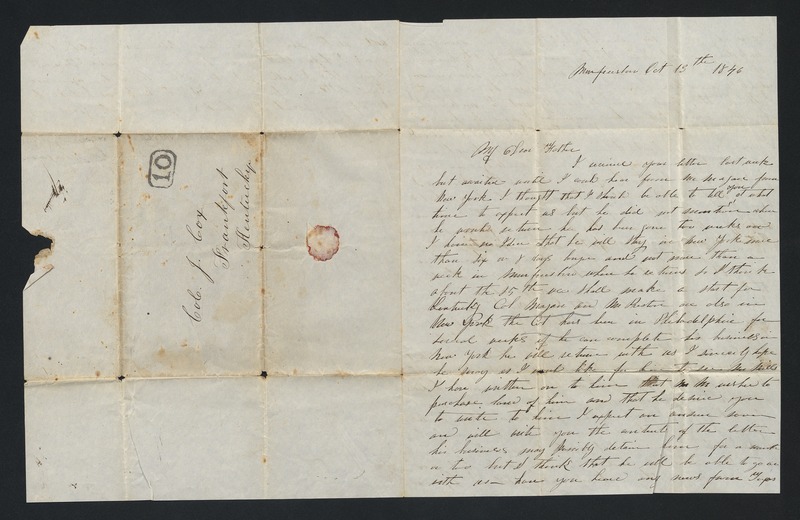 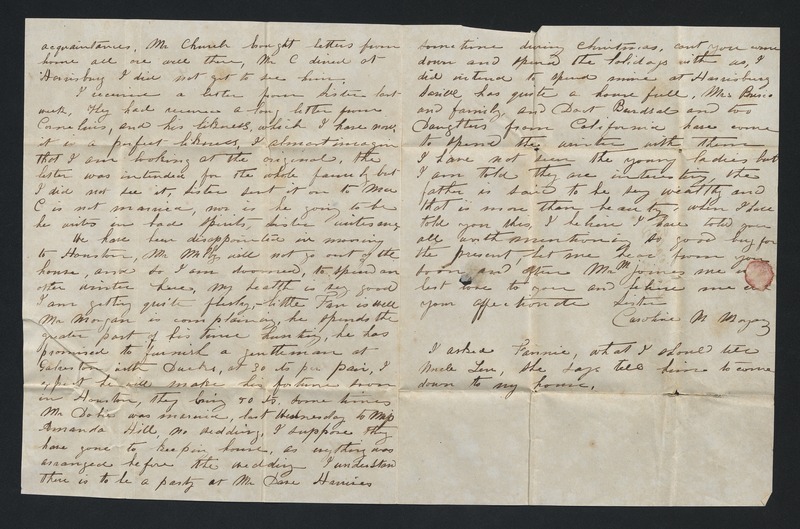 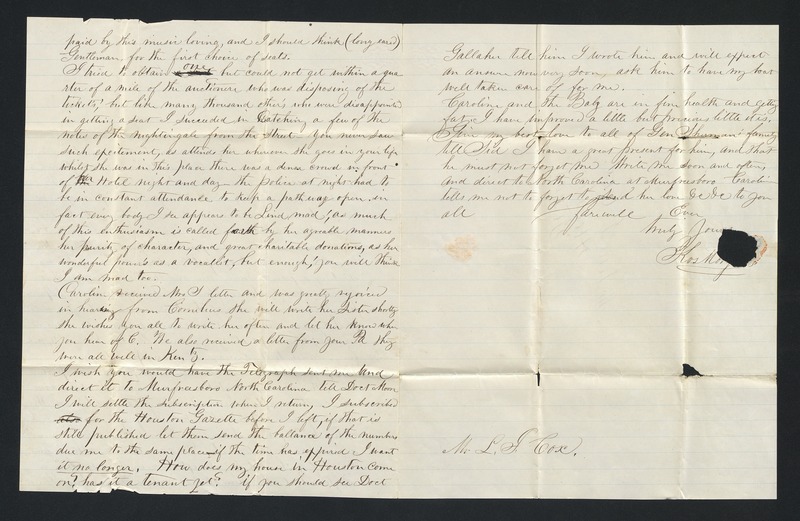 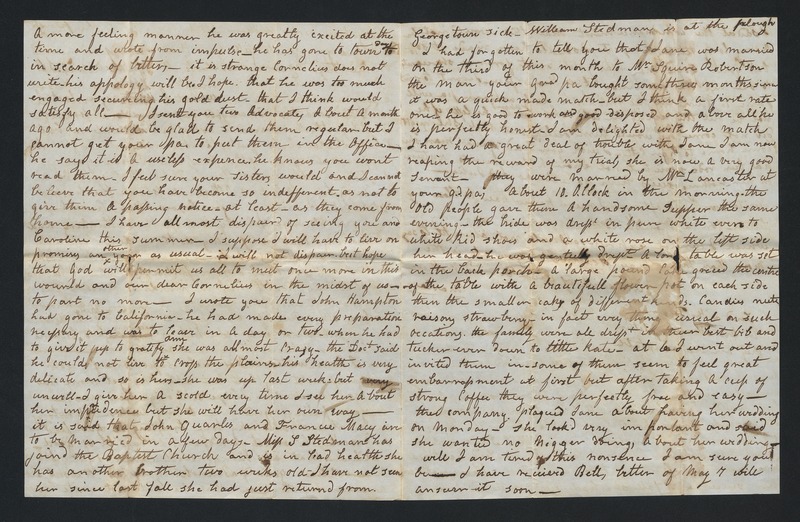 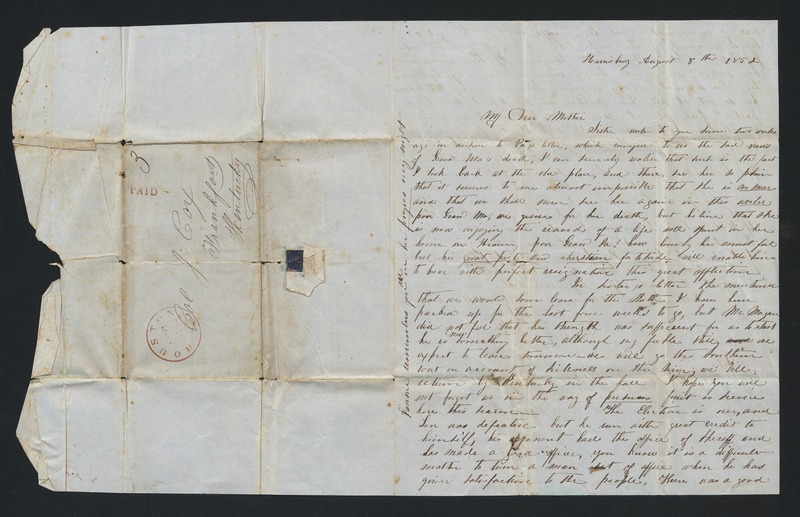 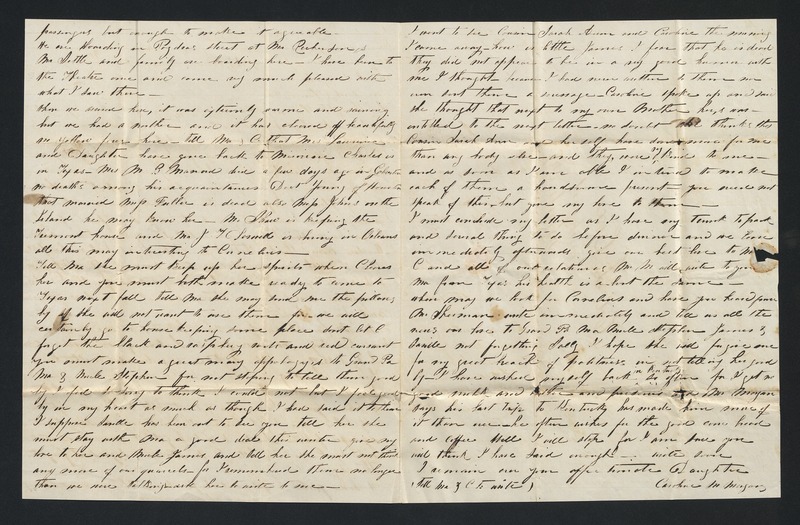 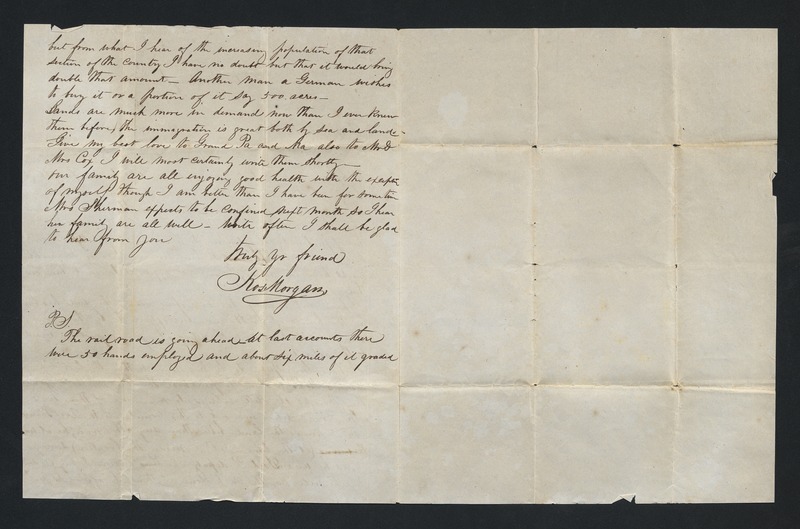 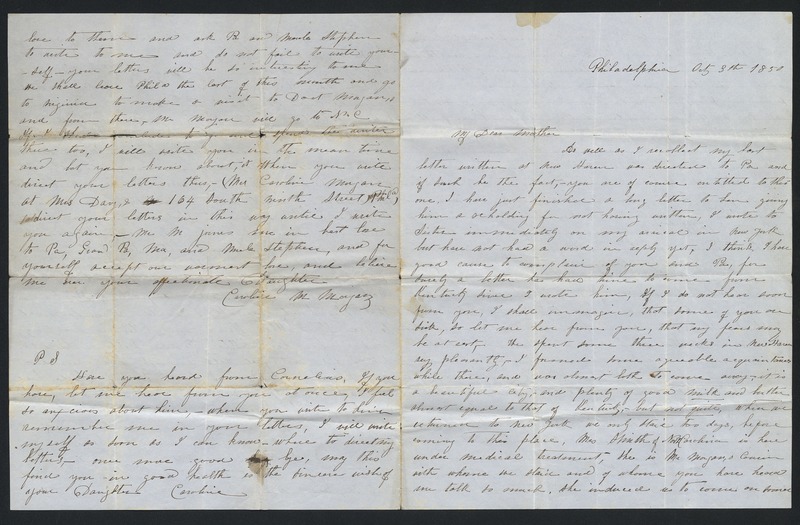 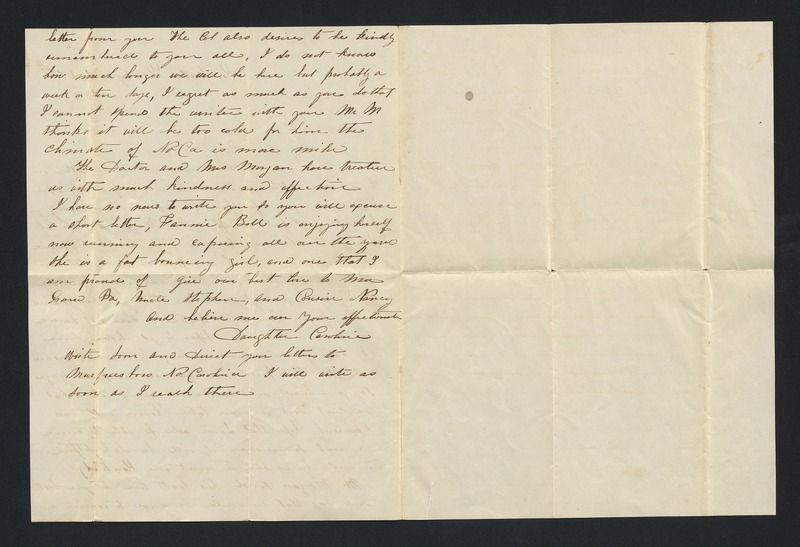 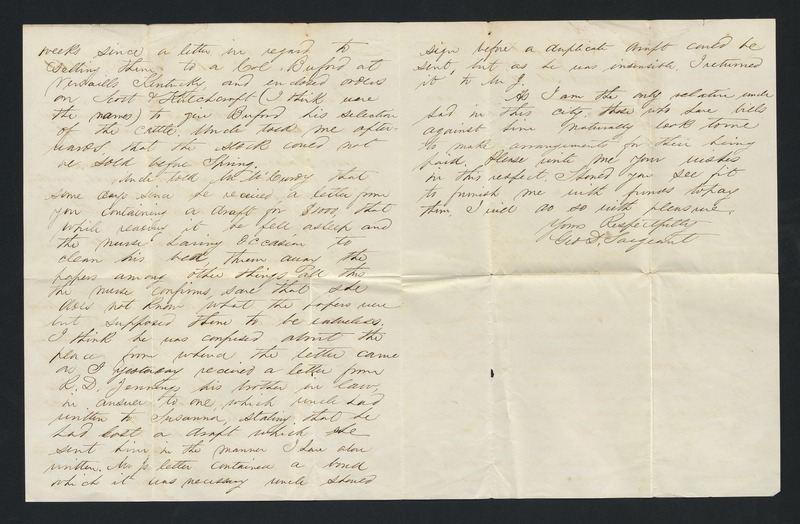 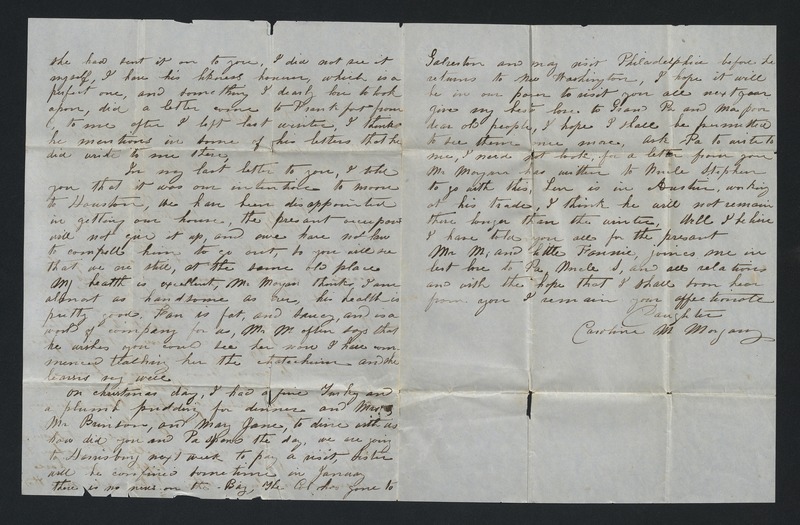 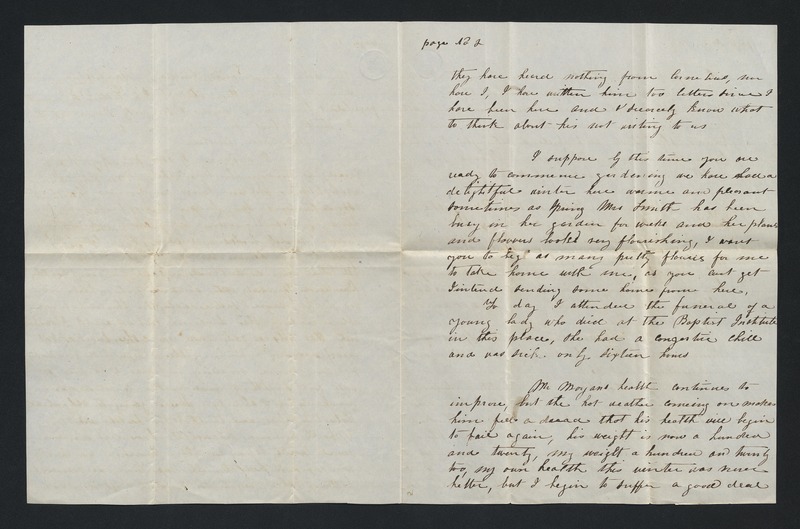 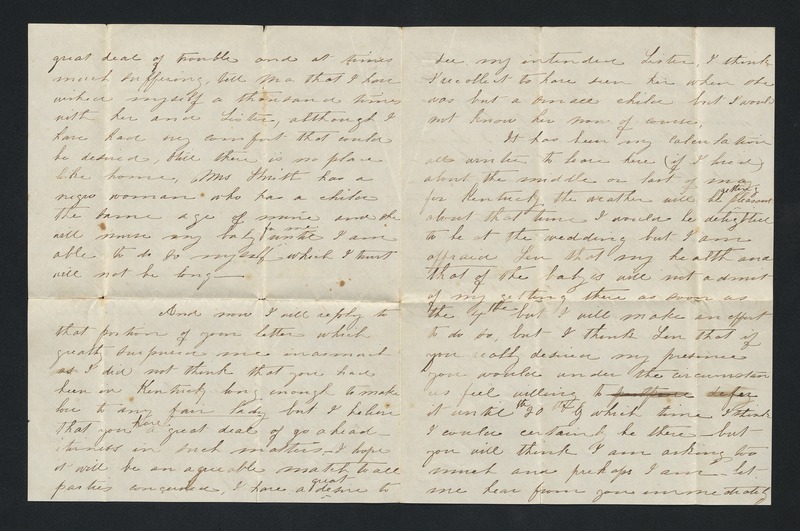 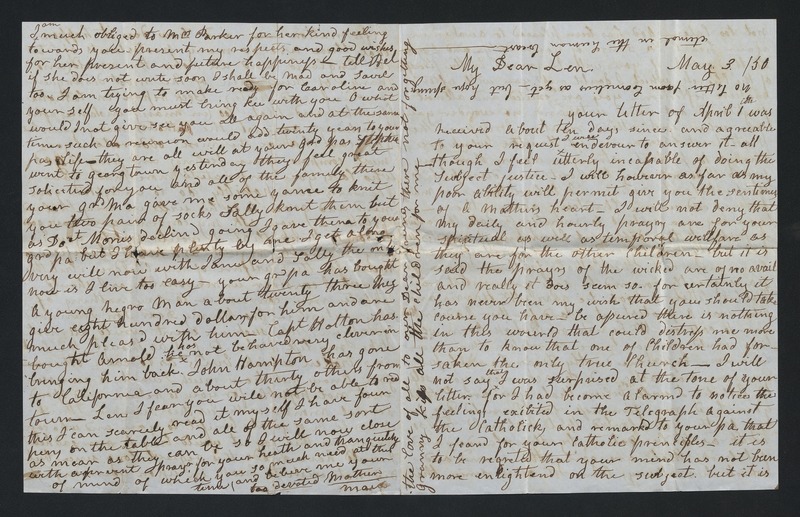 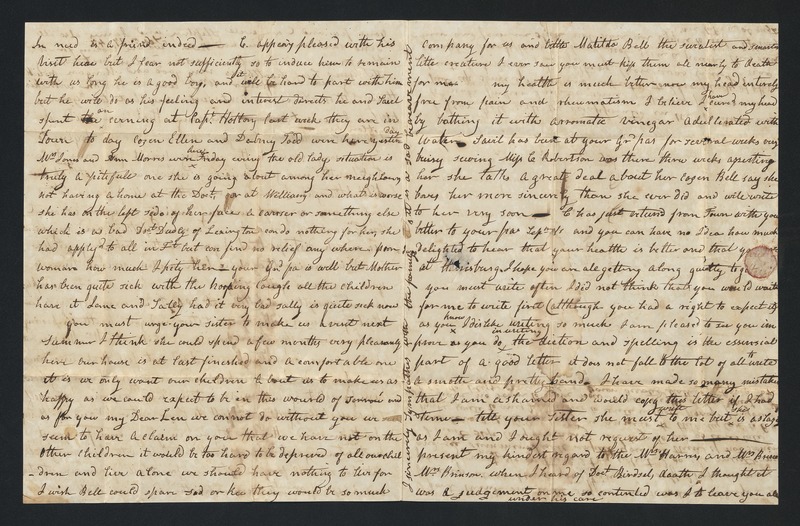 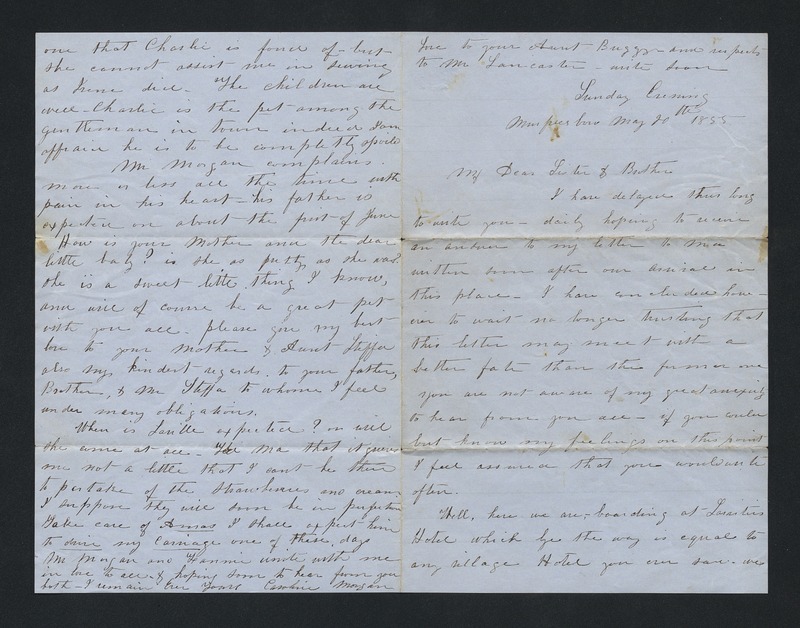 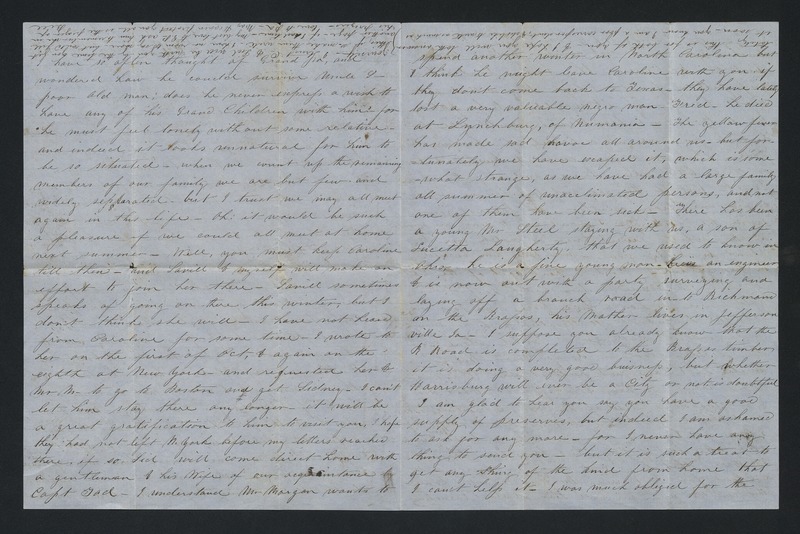 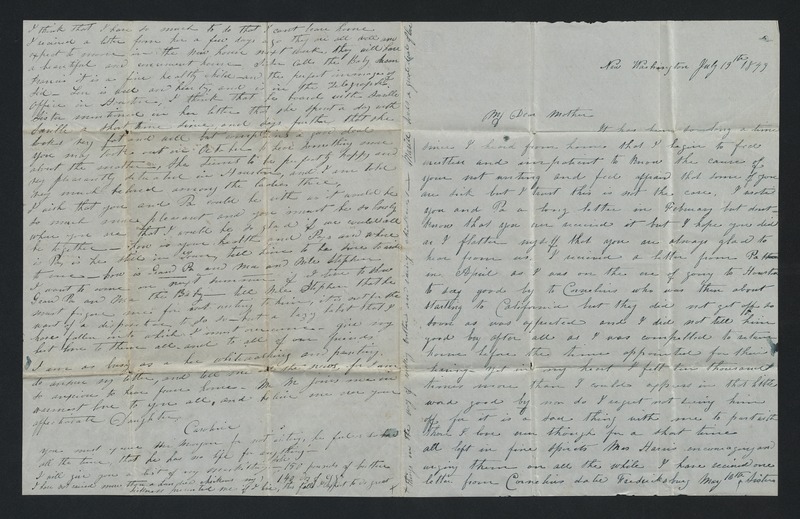 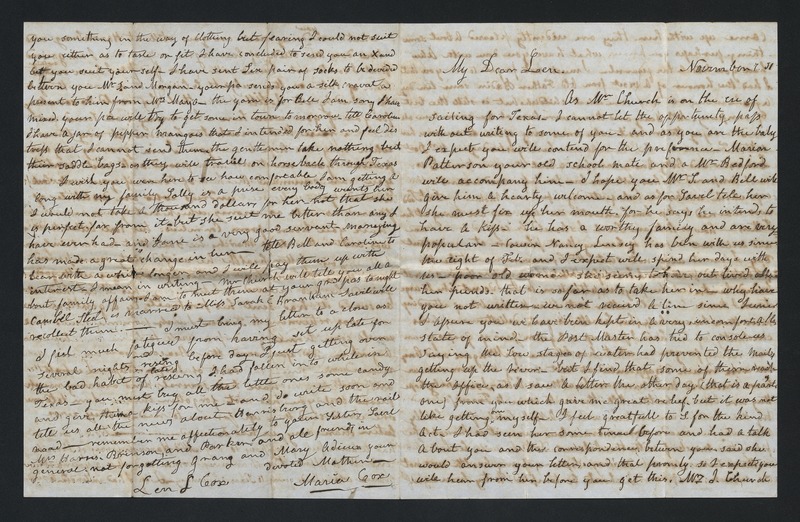 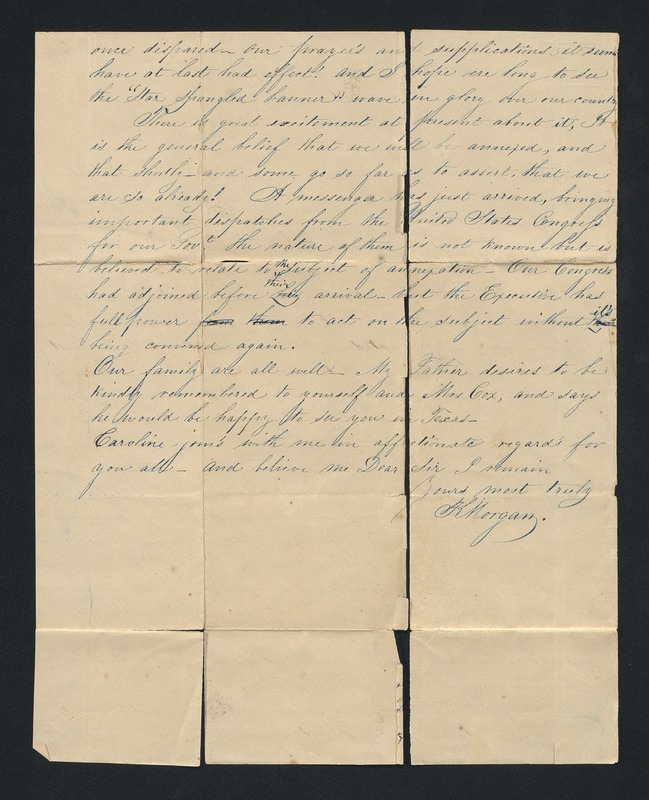 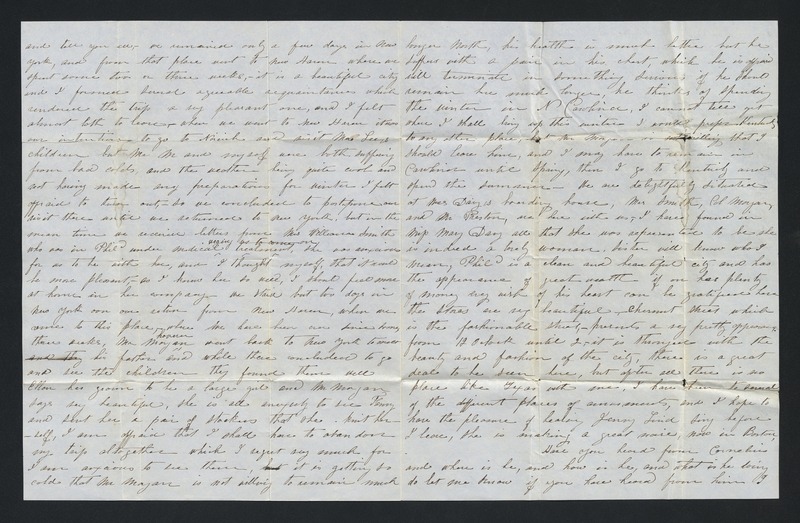 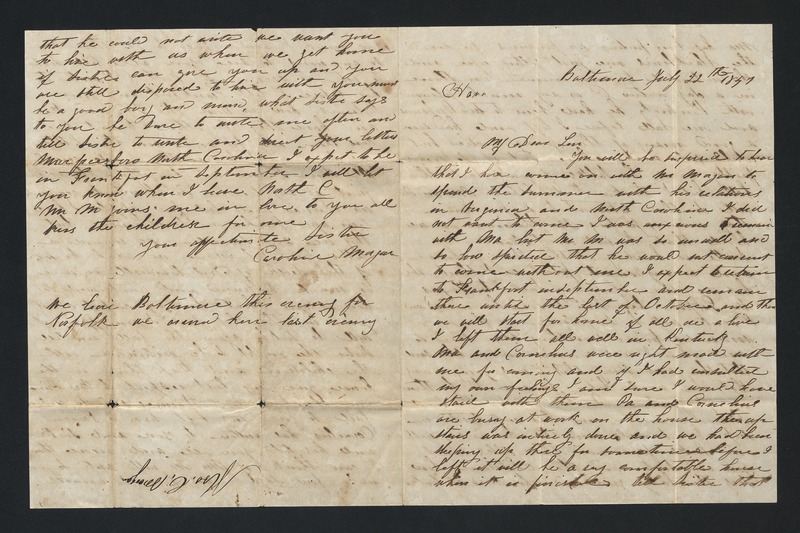 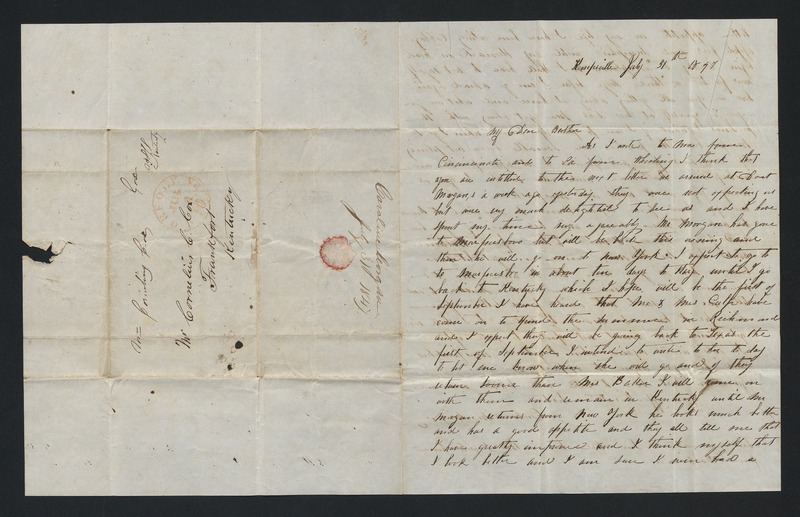 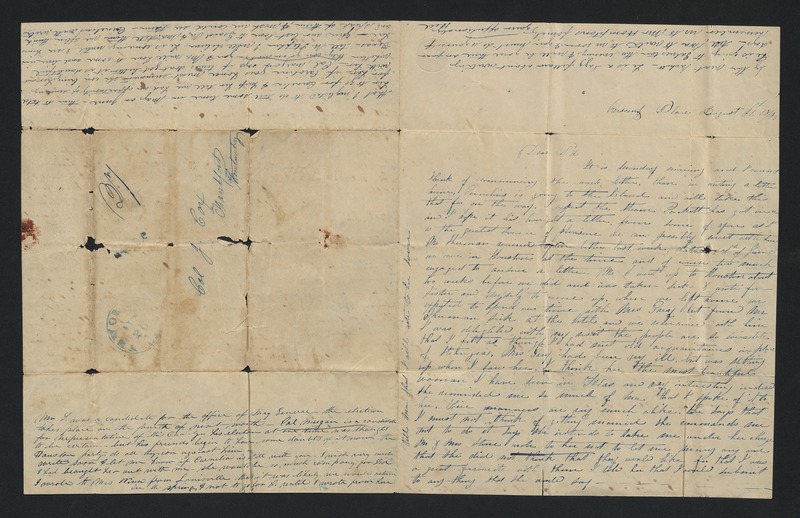 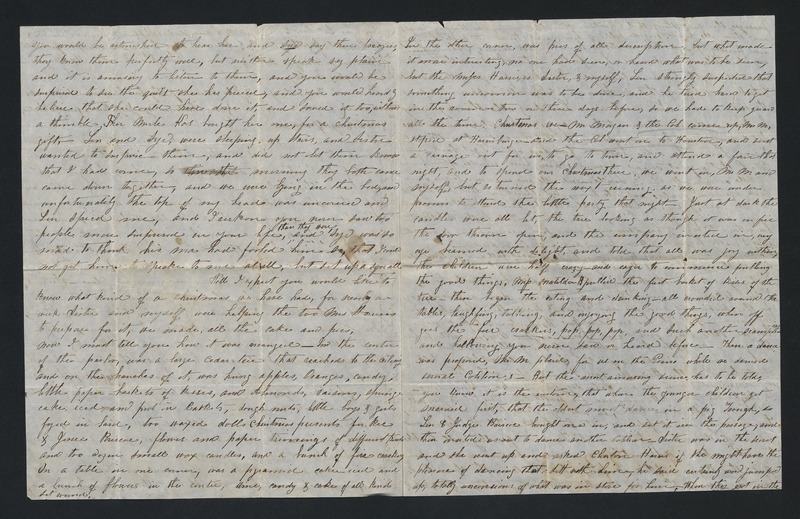 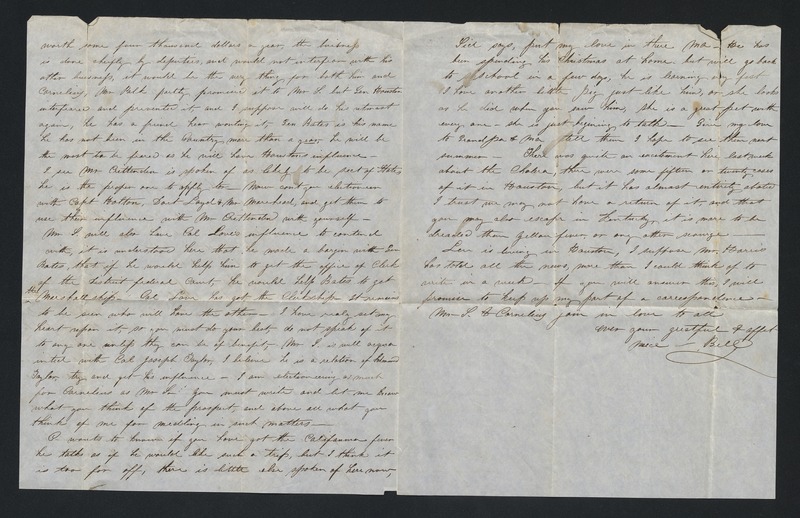 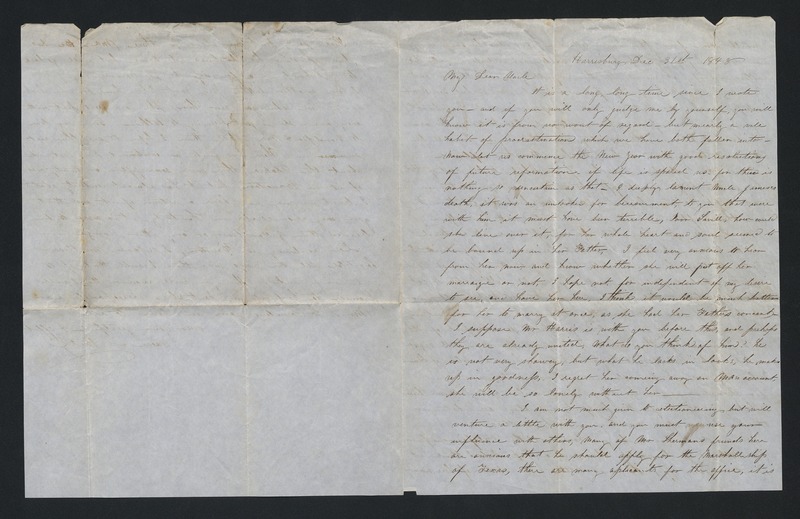 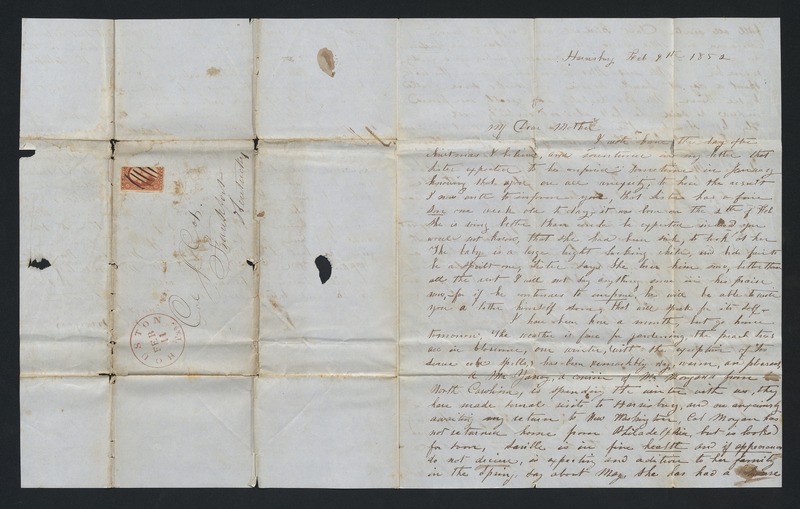 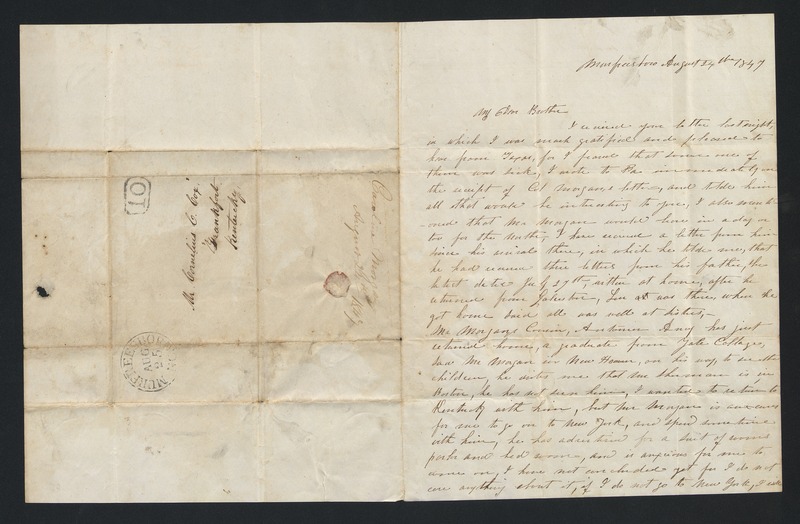 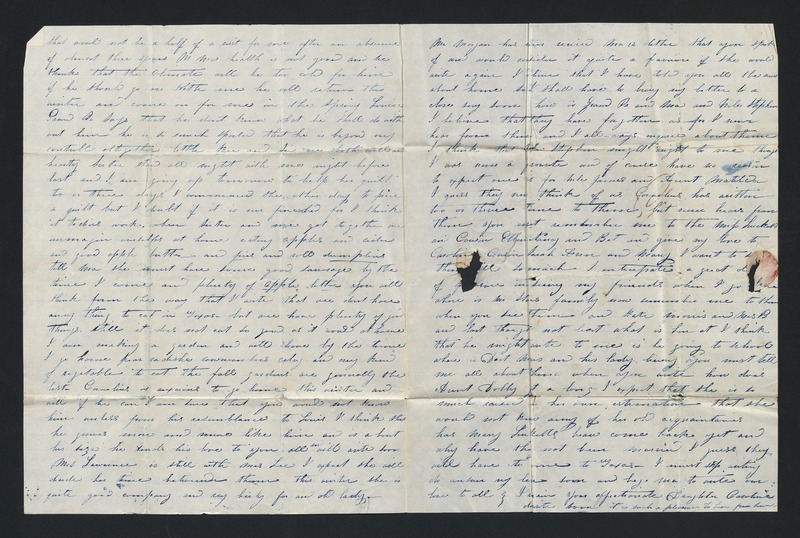 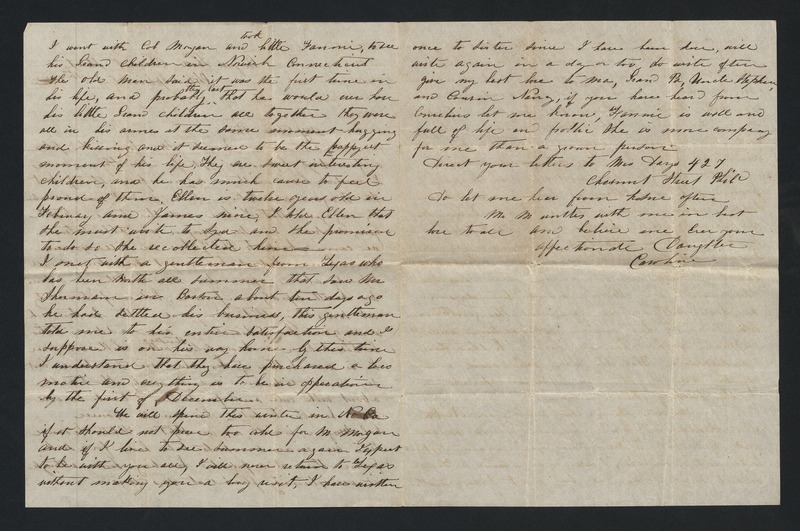 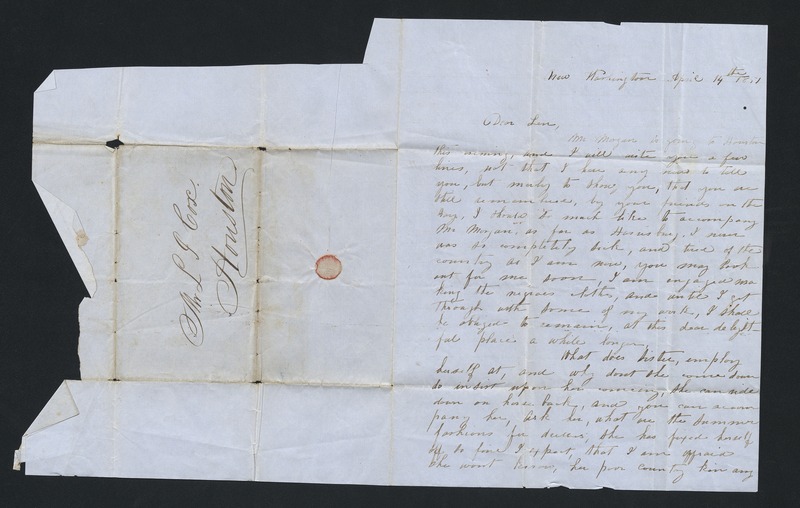 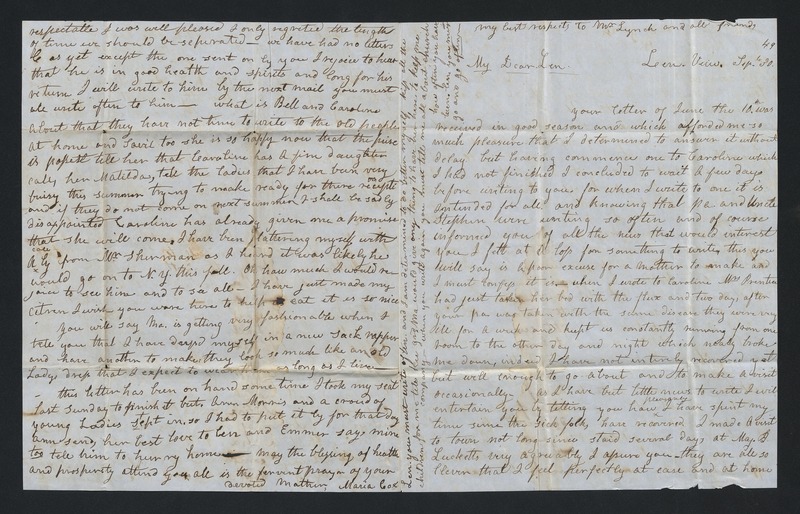 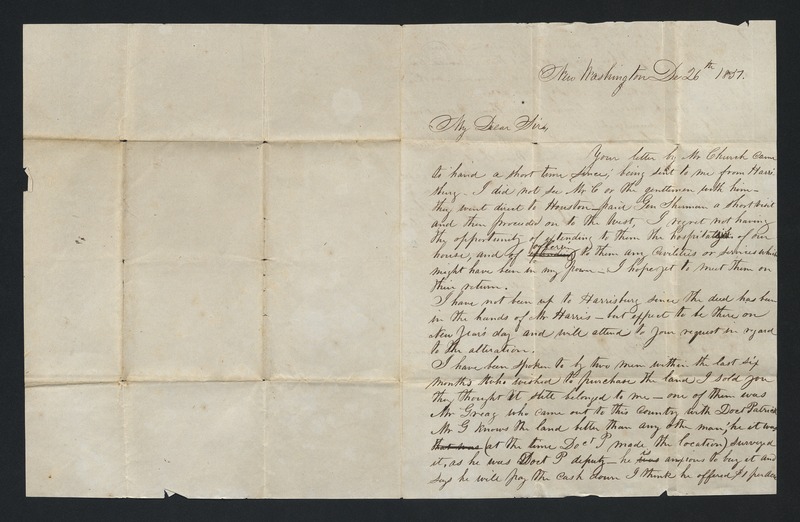 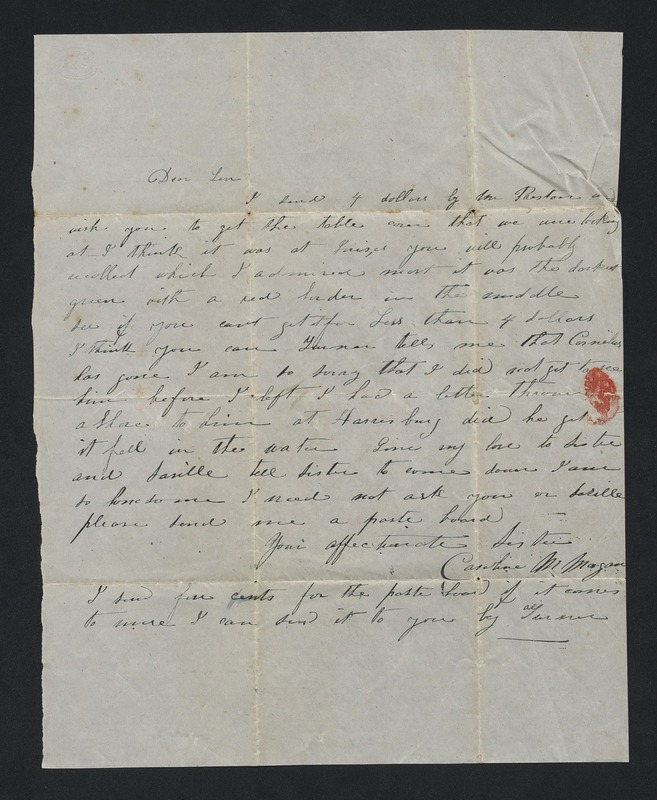 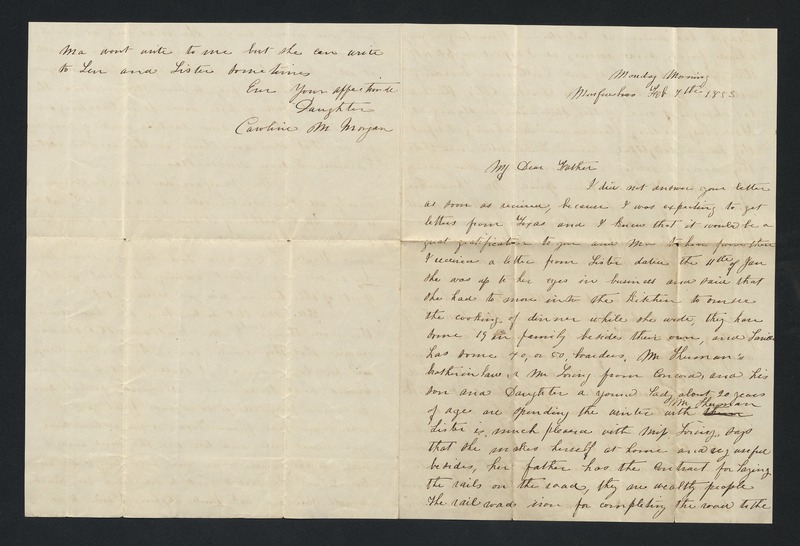 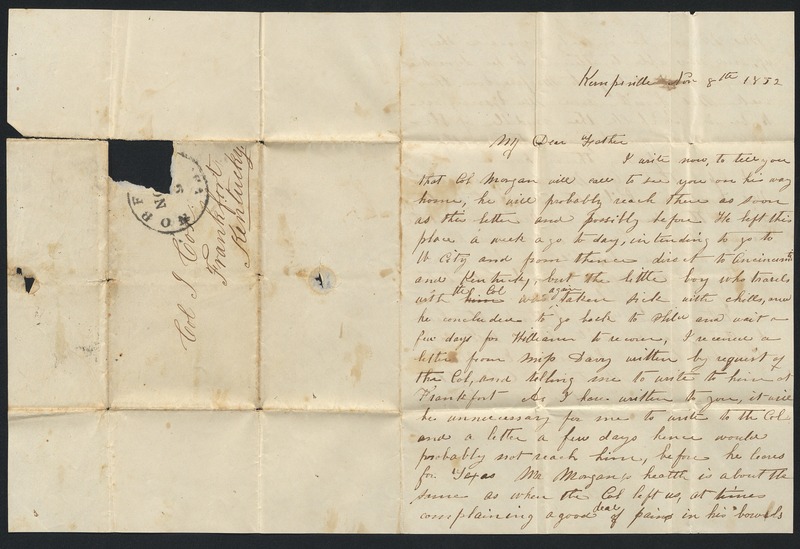 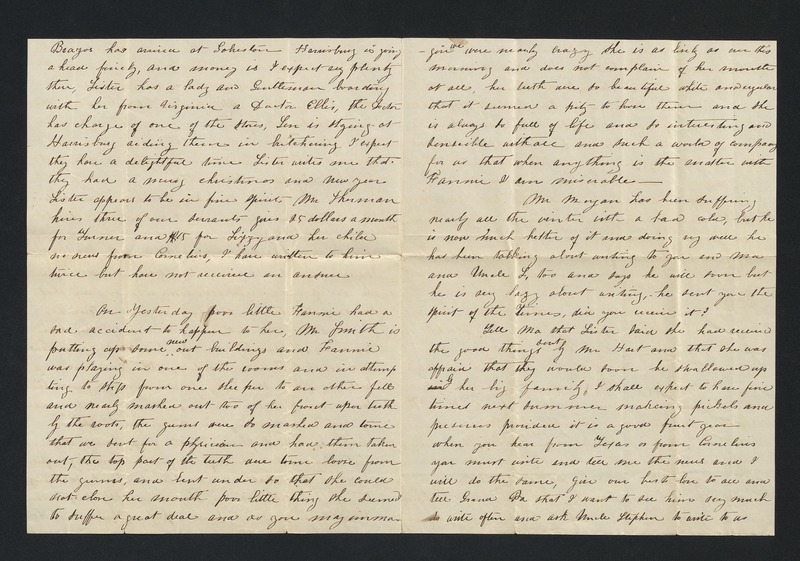 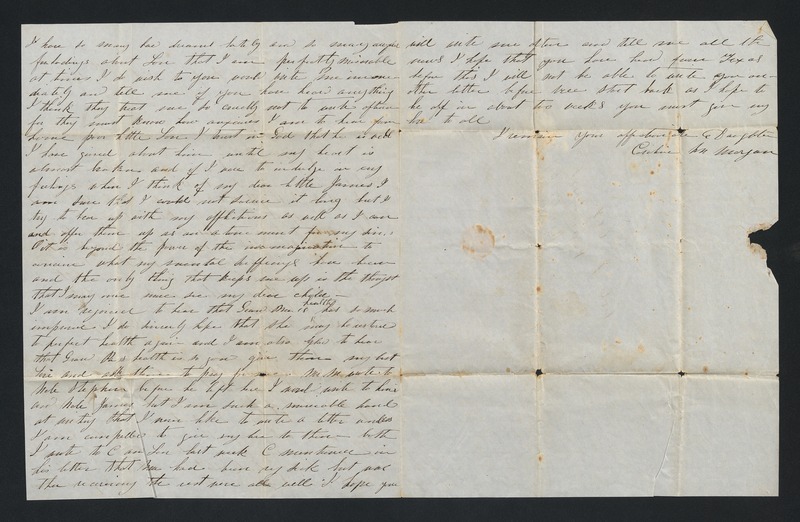 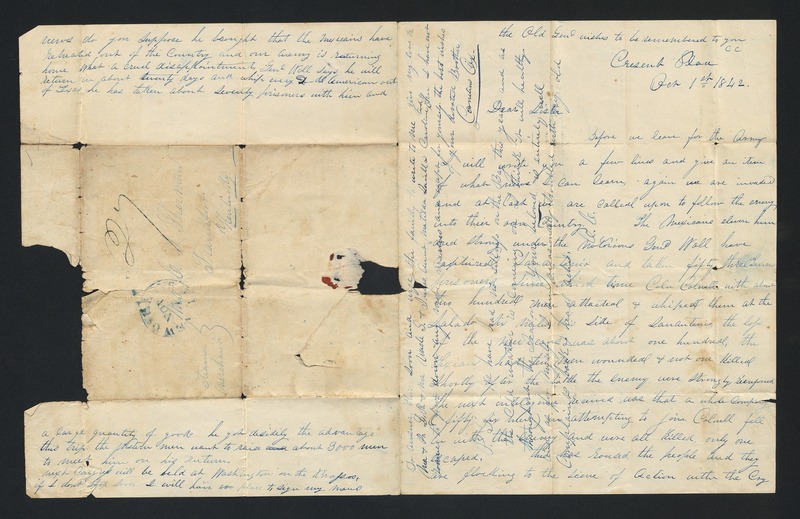 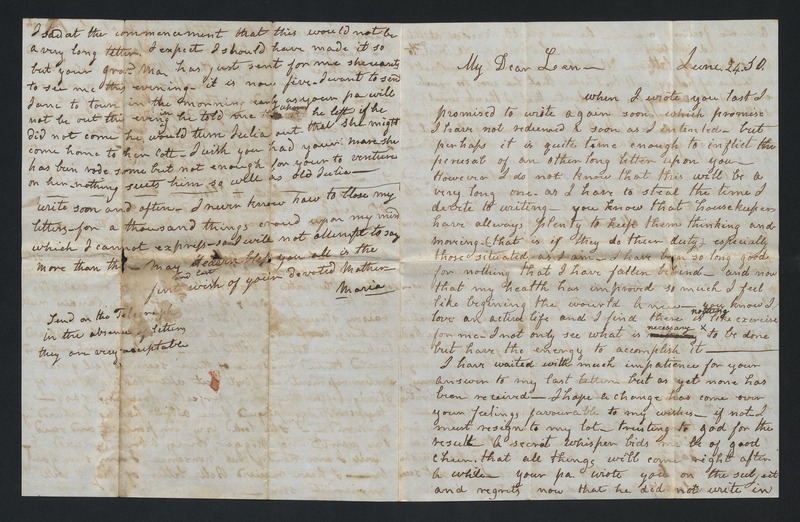 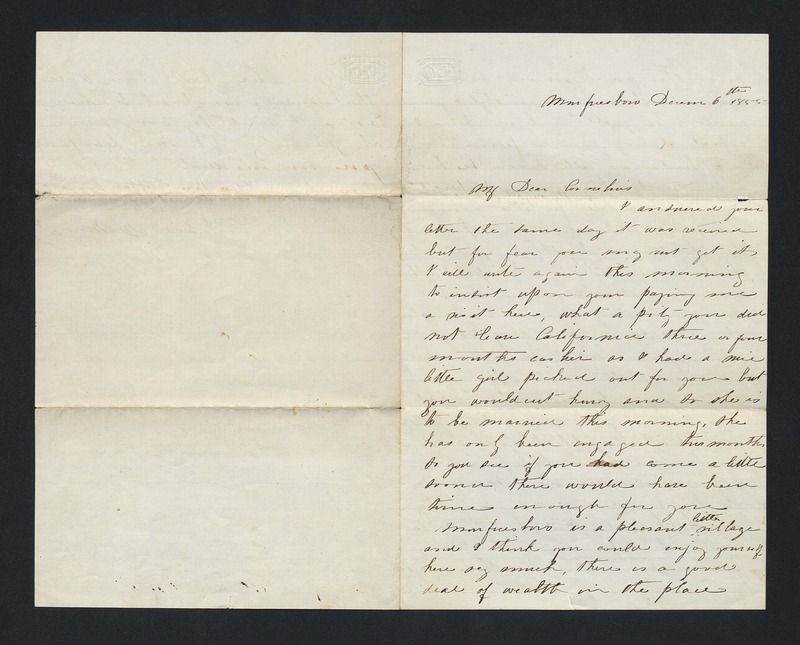 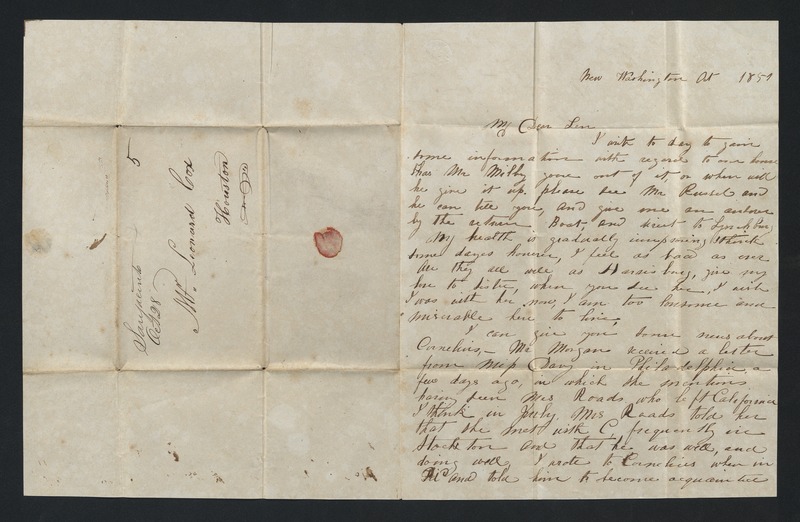 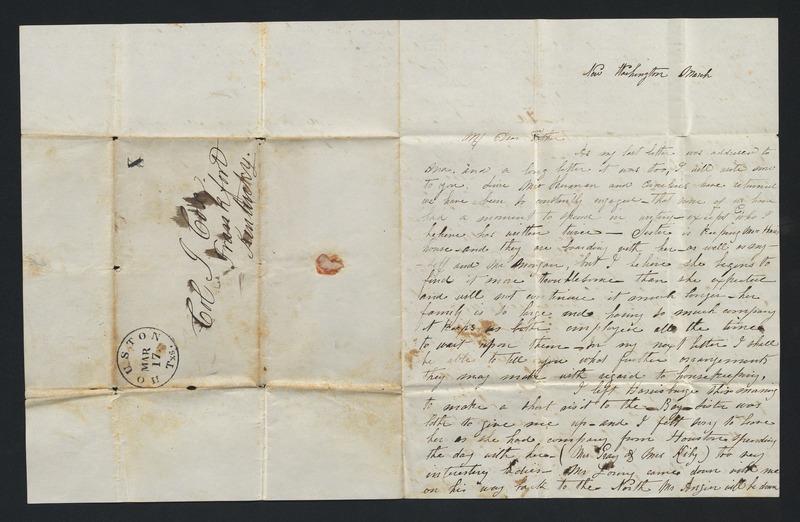 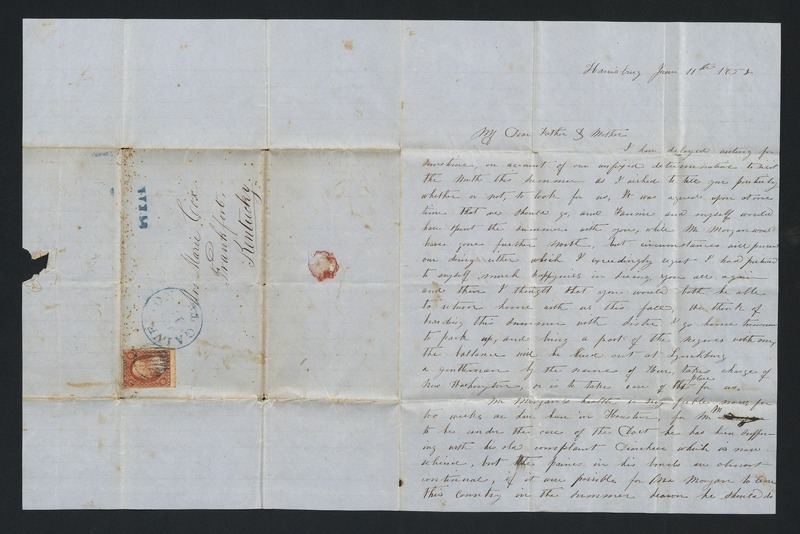 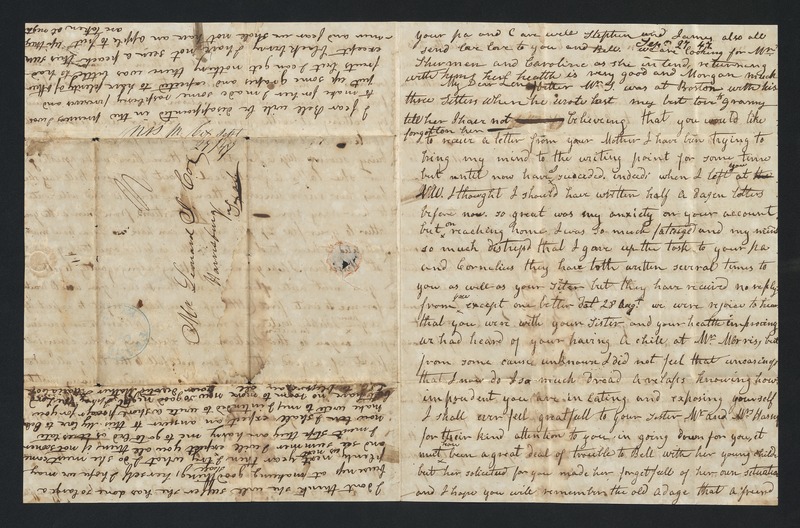 The papers additionally contain several letters written by Kos (Kosciuko) Morgan, Caroline's husband, and several letters written to Kos' father, James Morgan. 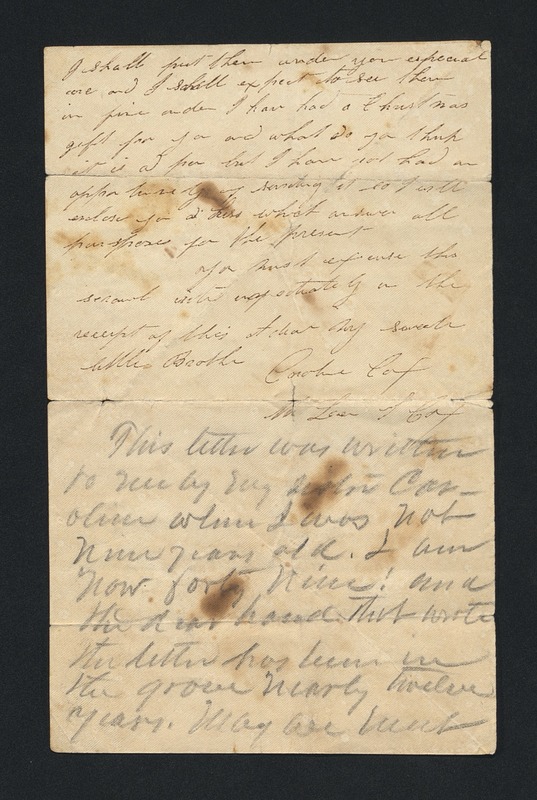 The letters describe many political and current events in Texas; the development of Harrisburg and New Washington, Texas; and the frequency of diseases such as yellow fever and typhus. 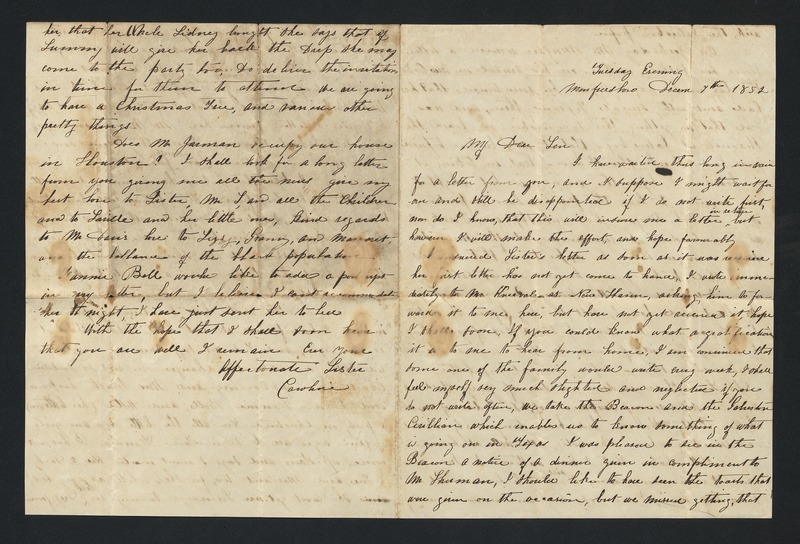 Several of the letters discuss the deaths of Caroline's children Louis and Thomas from common tropical diseases.